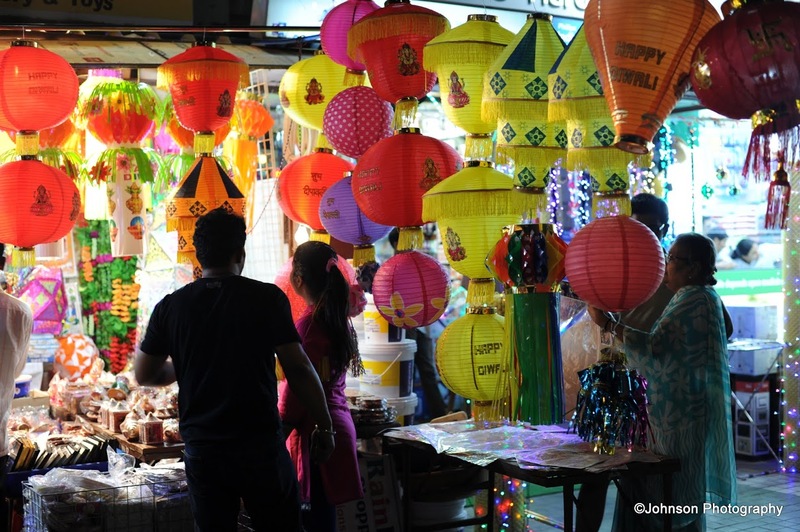 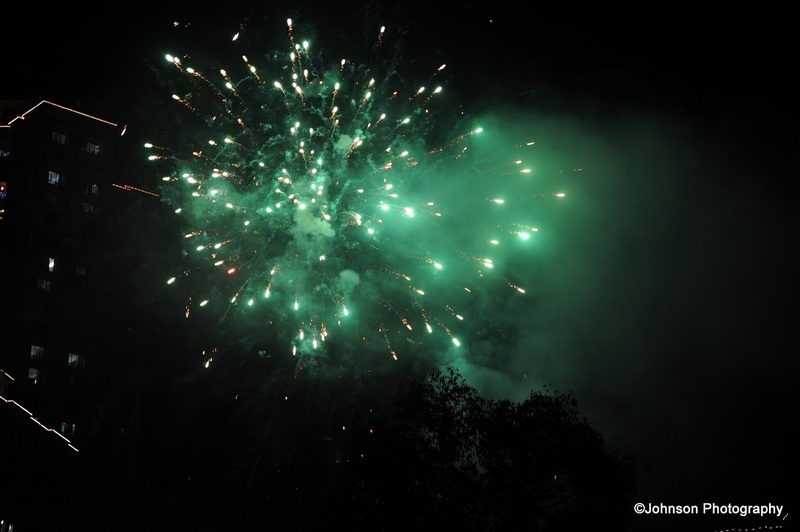 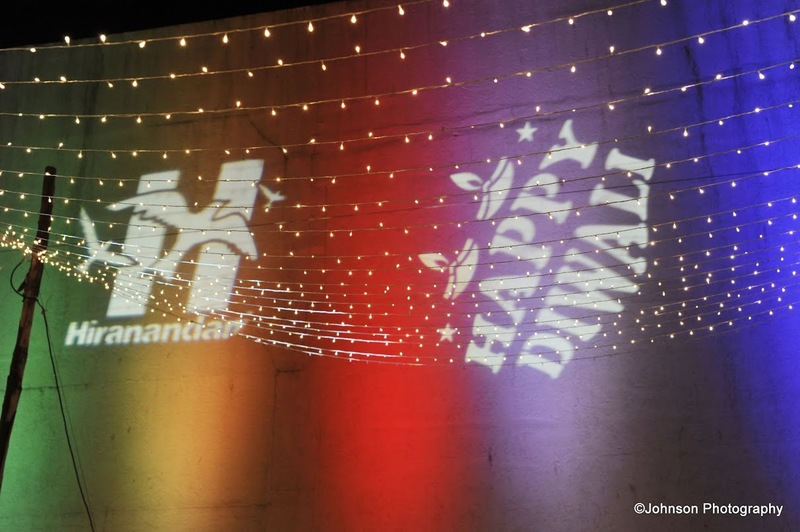 Diwali or Deepavali is the festival of lights celebrated every year in autumn in India. 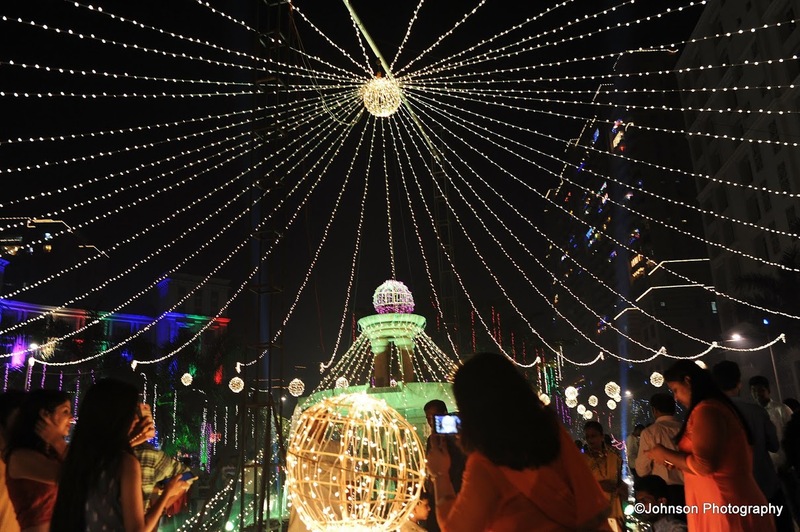 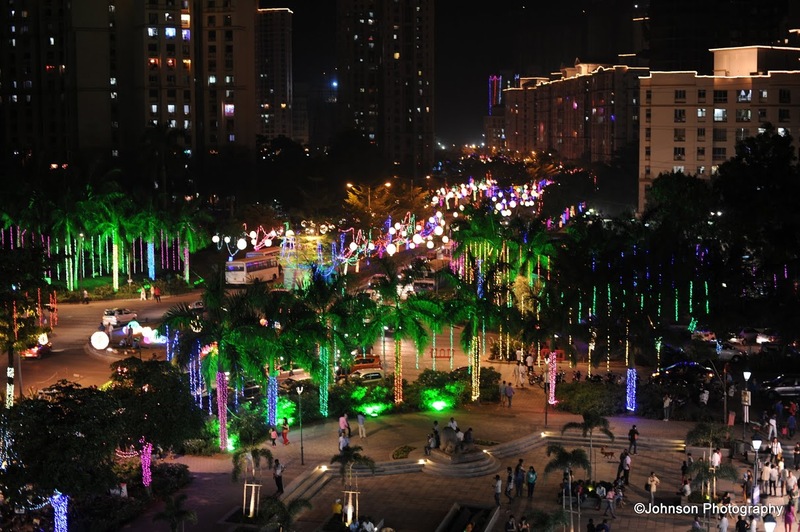 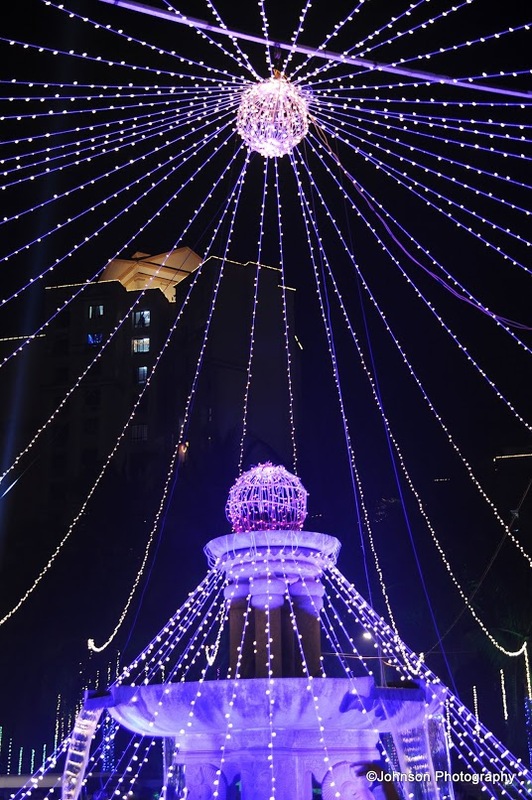 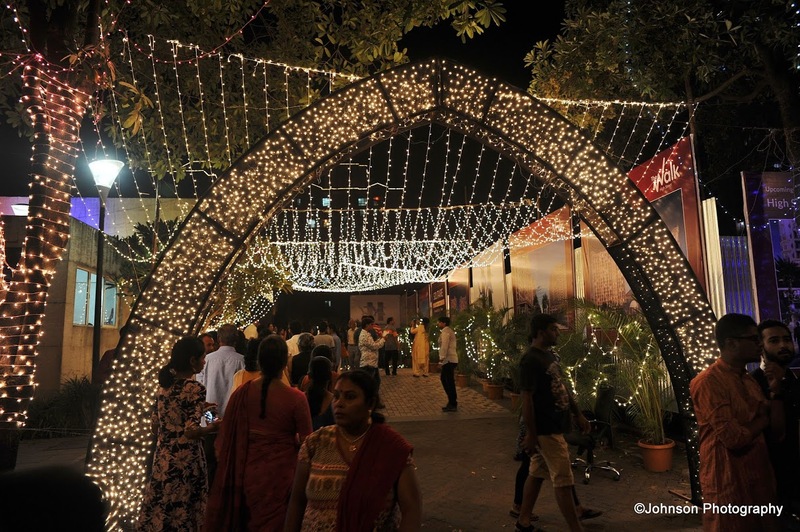 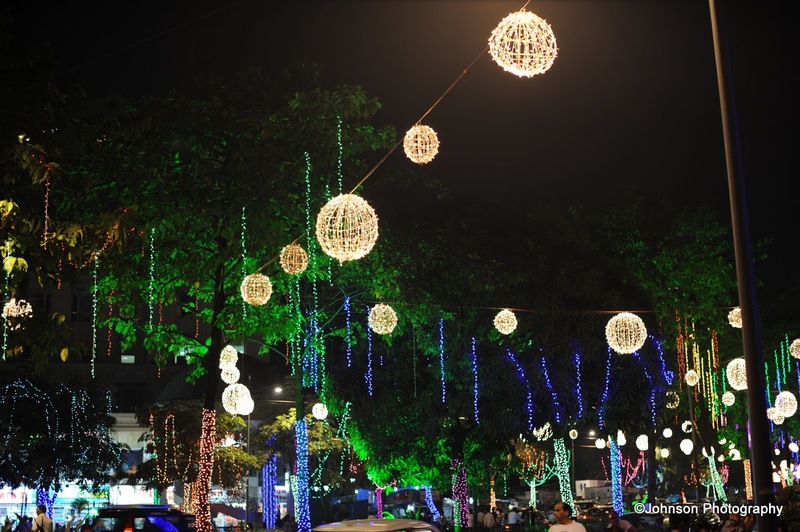 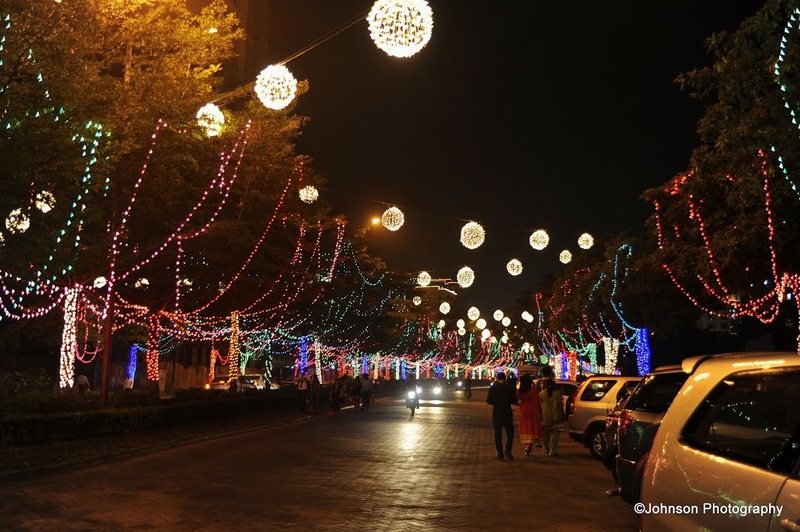 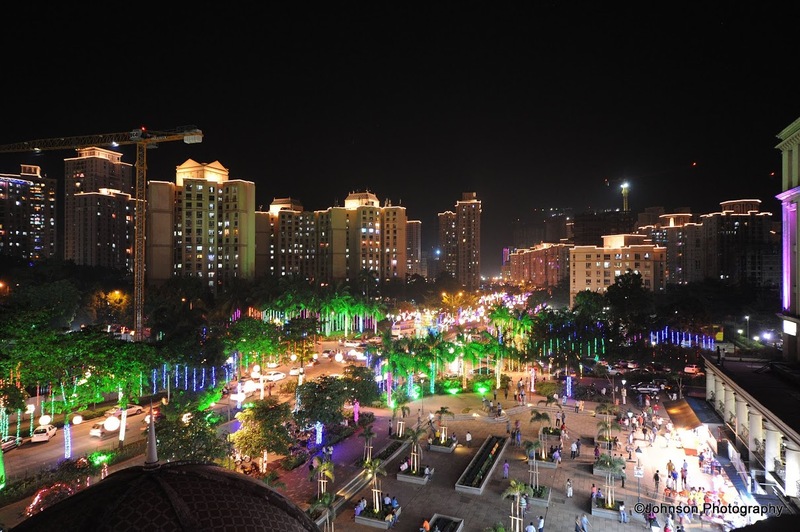 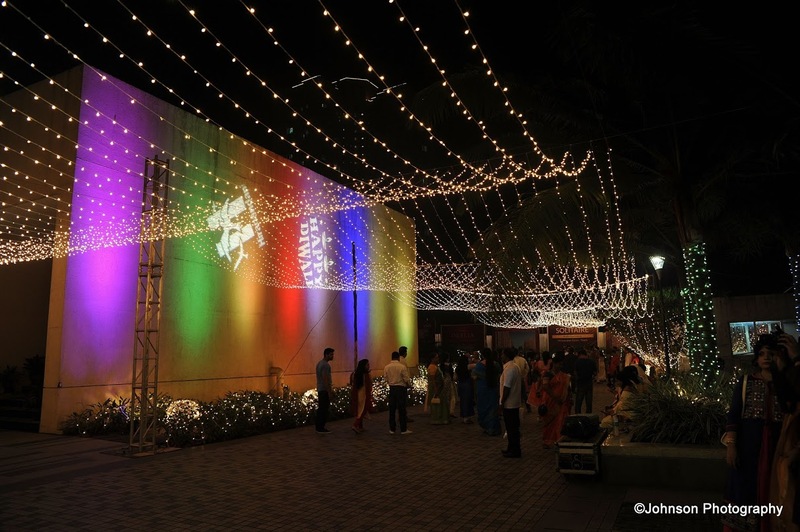 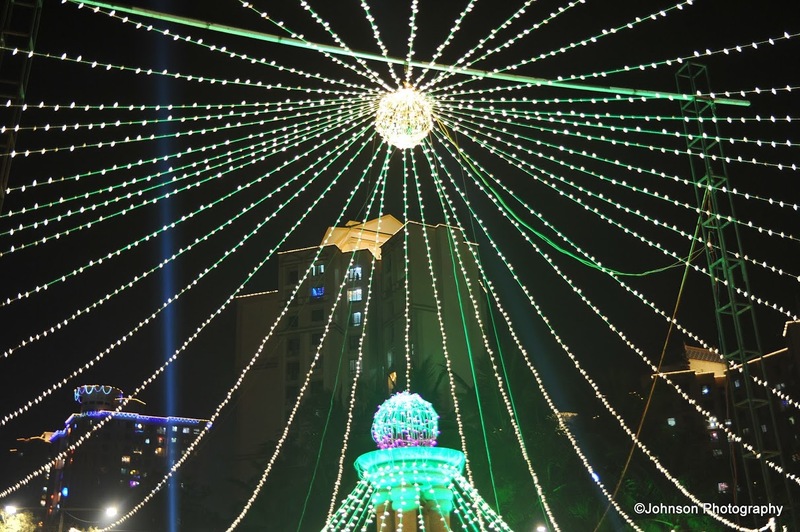 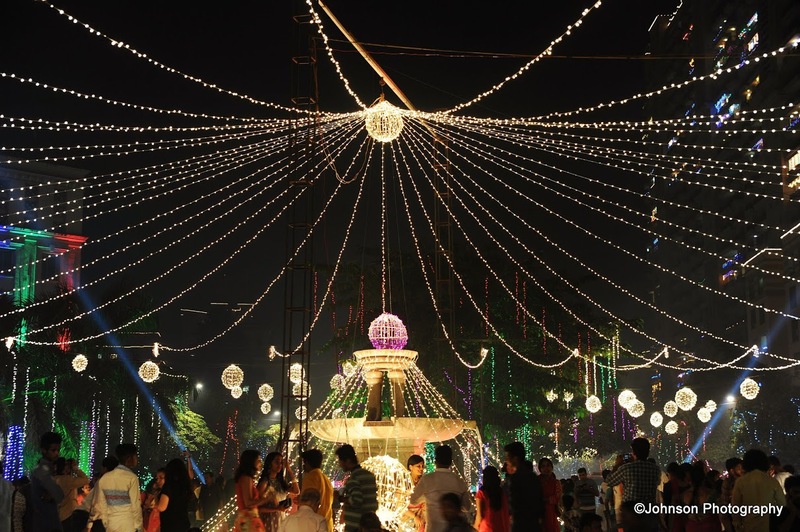 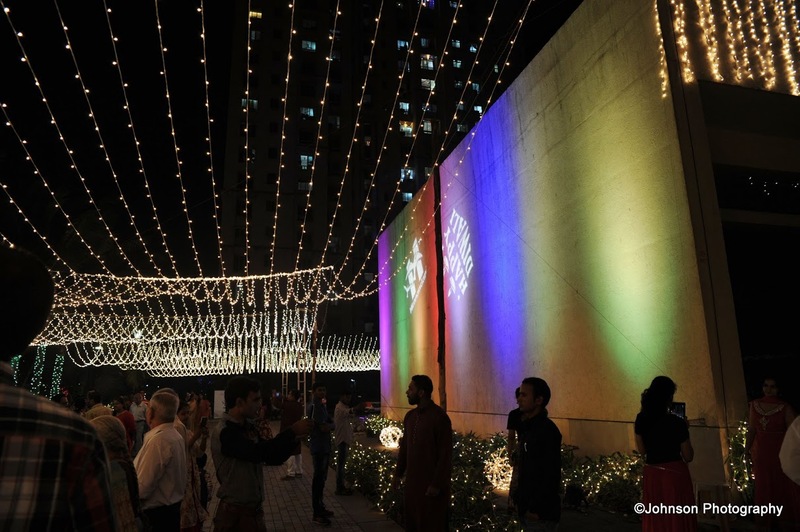 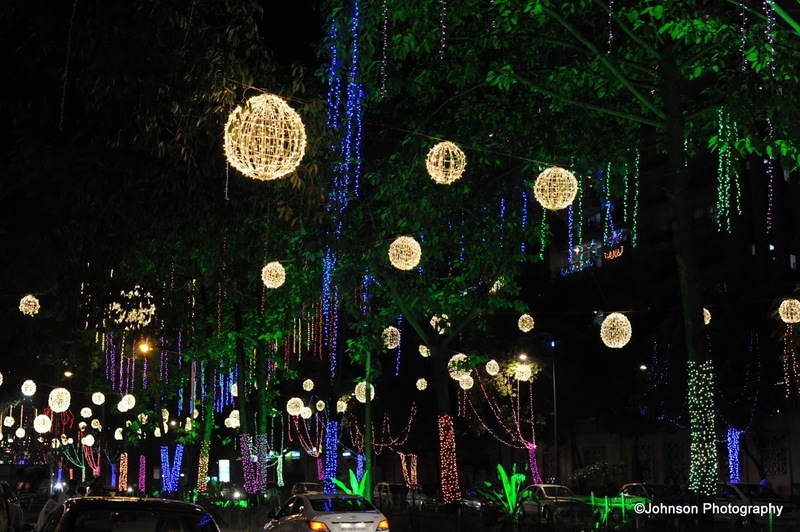 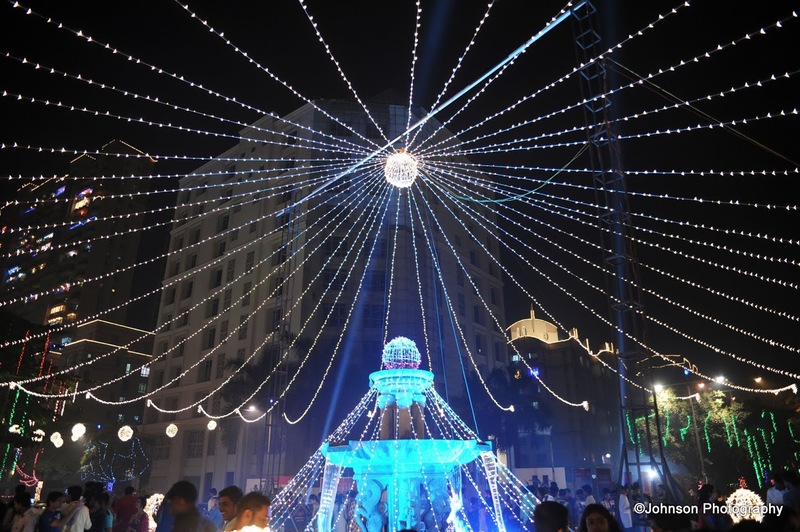 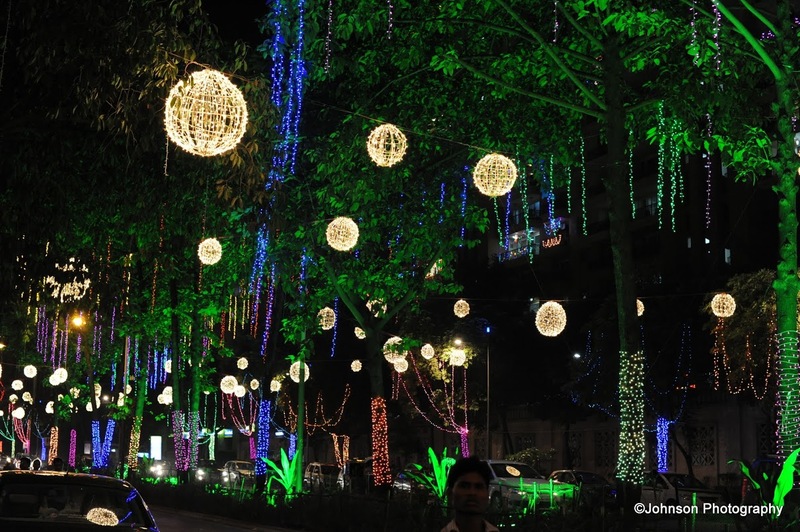 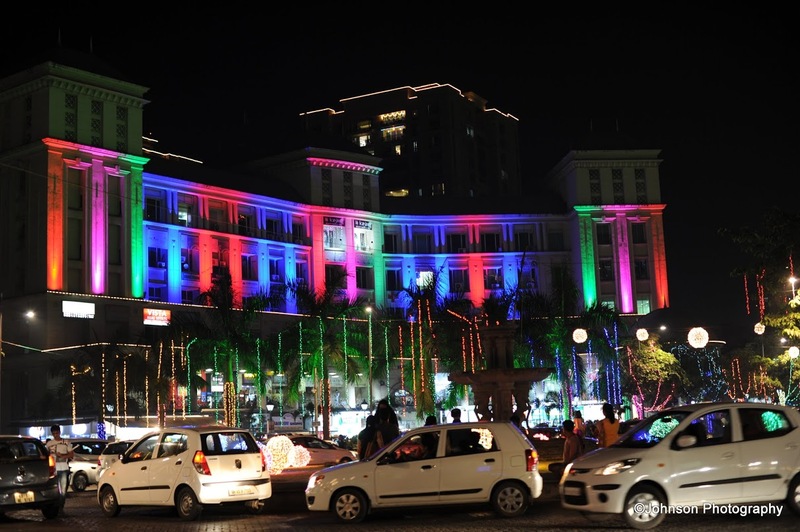 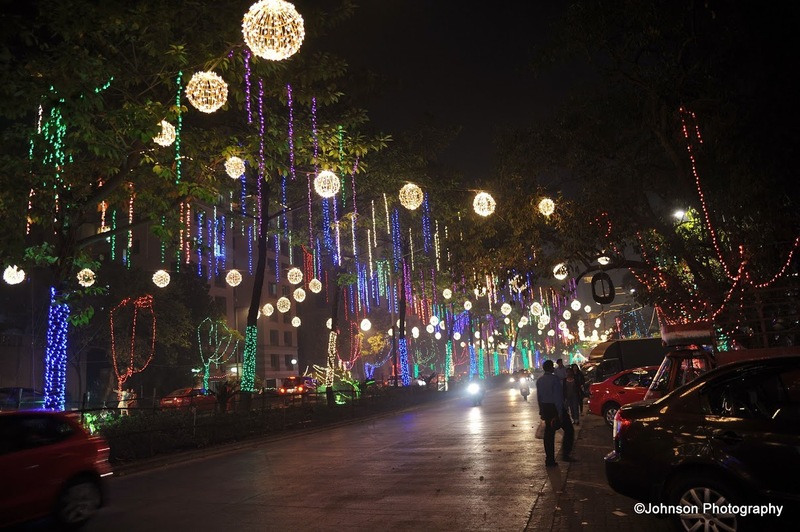 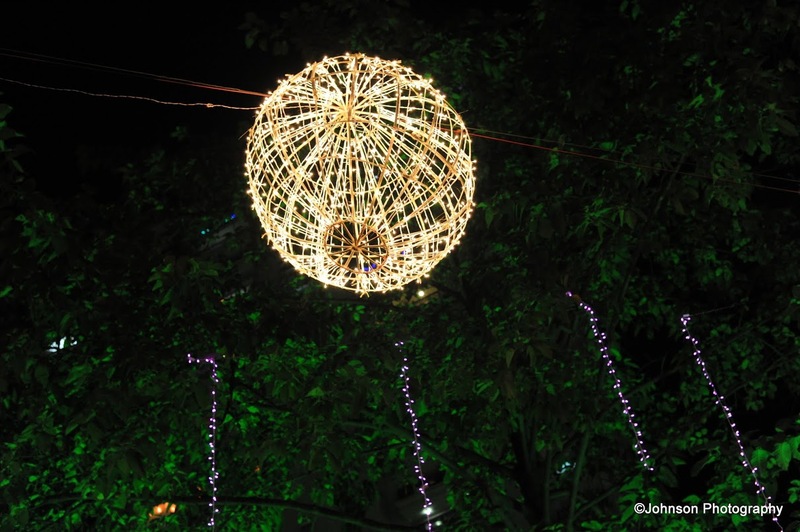 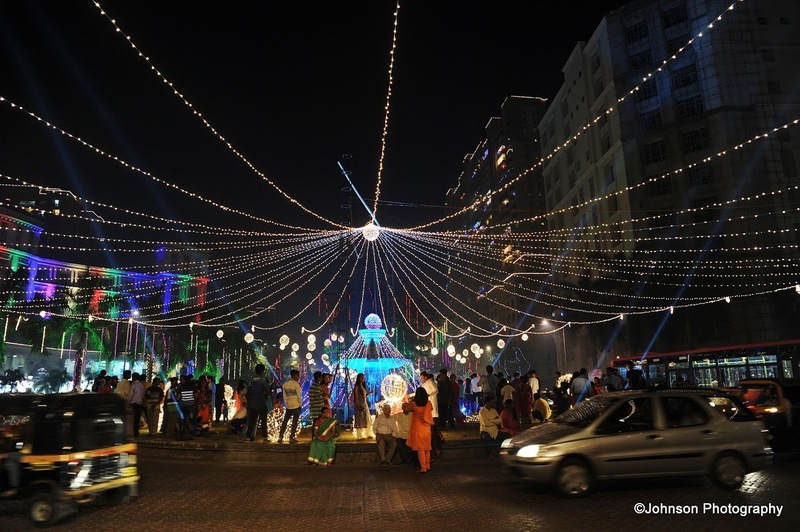 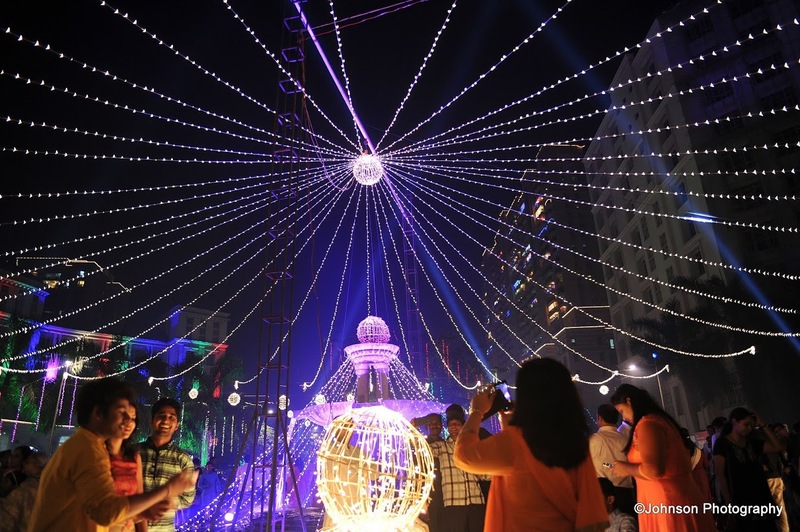 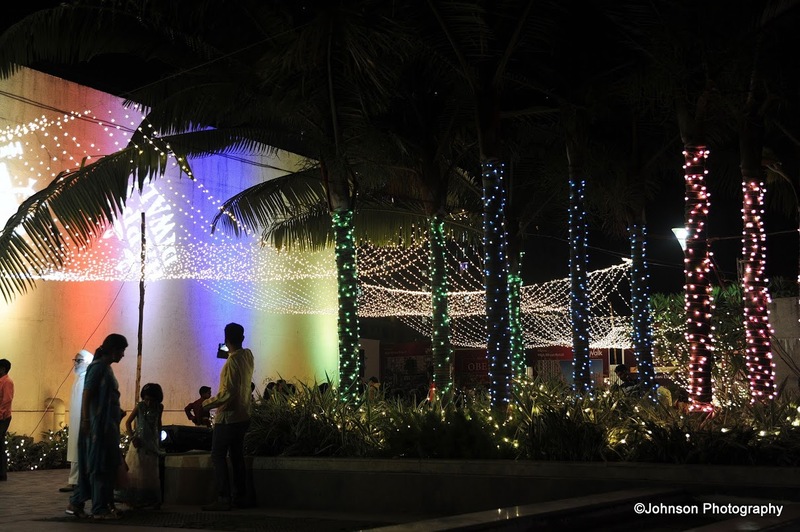 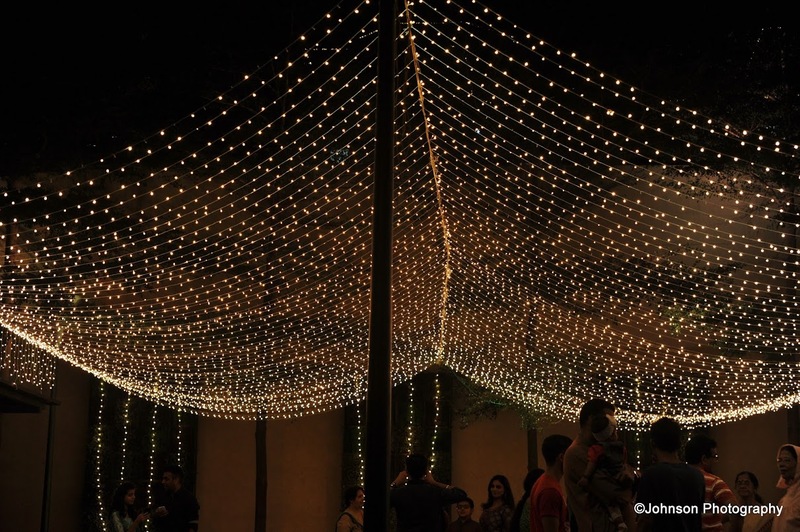 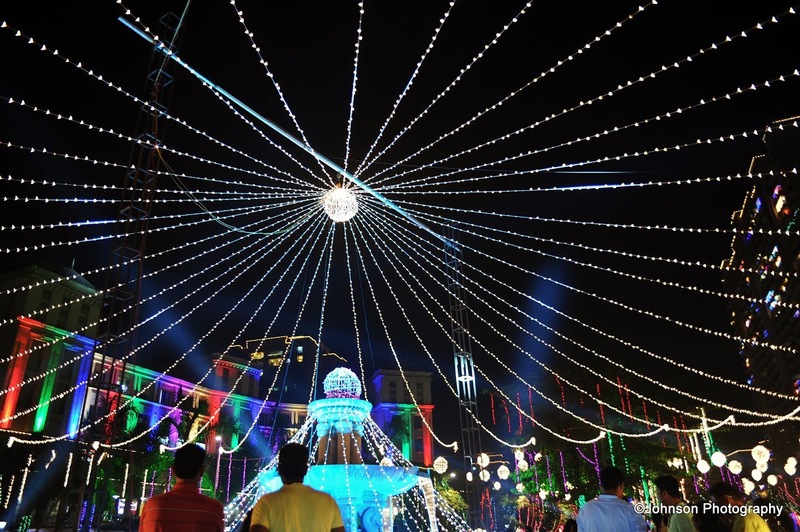 This year it was celebrated from 28 Oct to 01 Nov. Below are some of the pictures of the Diwali illumination arranged in Hiranandani Estate, Thane. 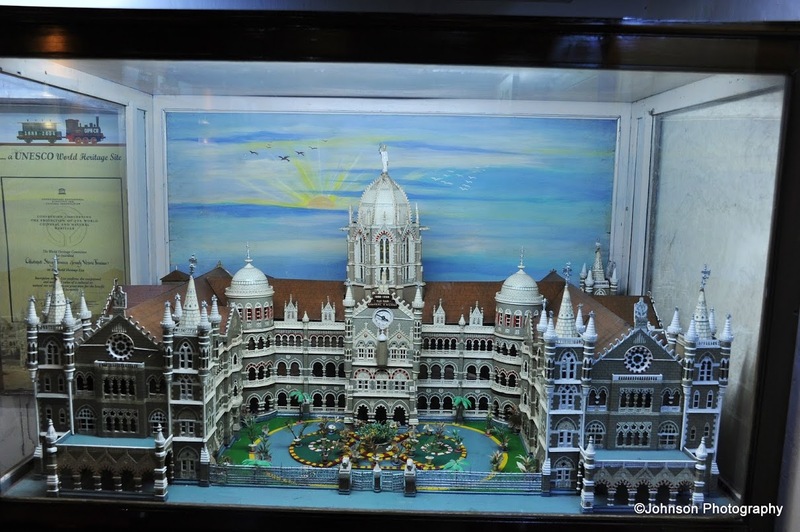 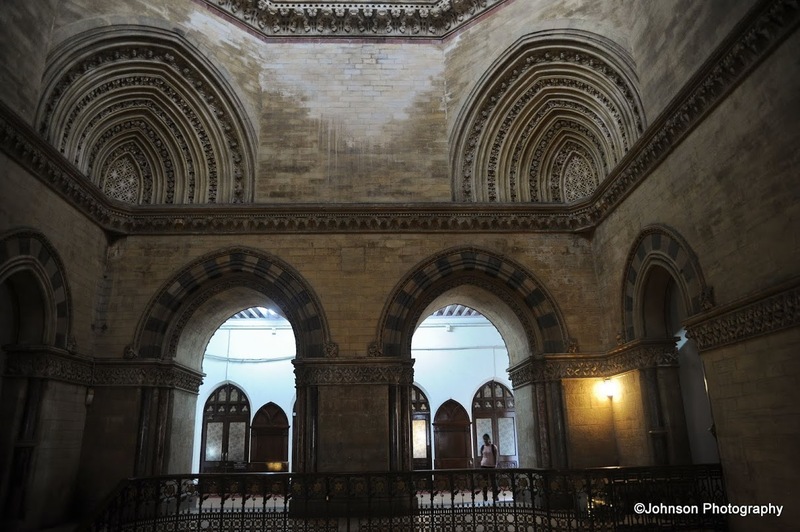 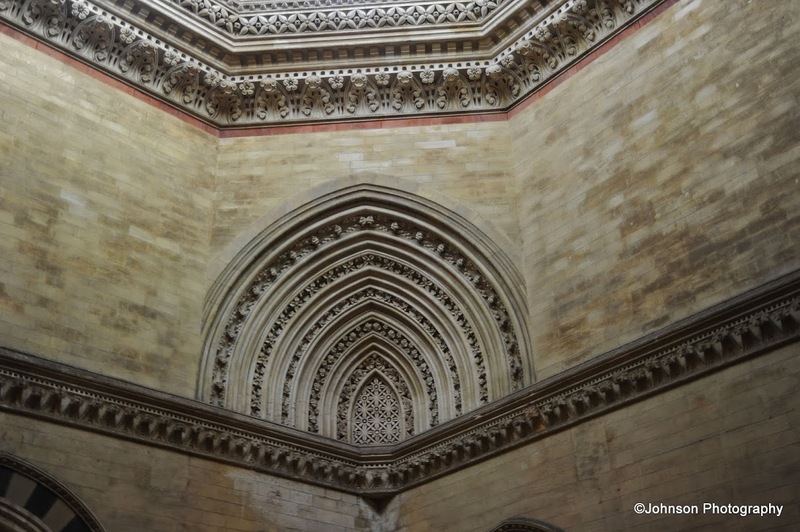 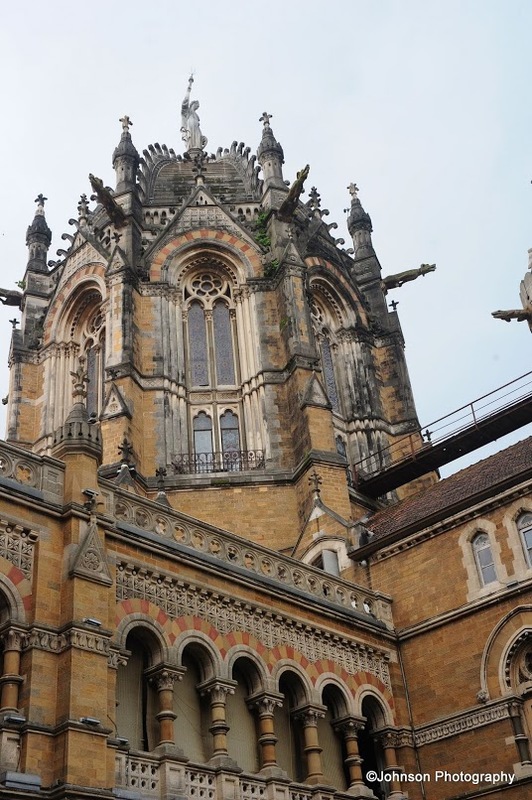 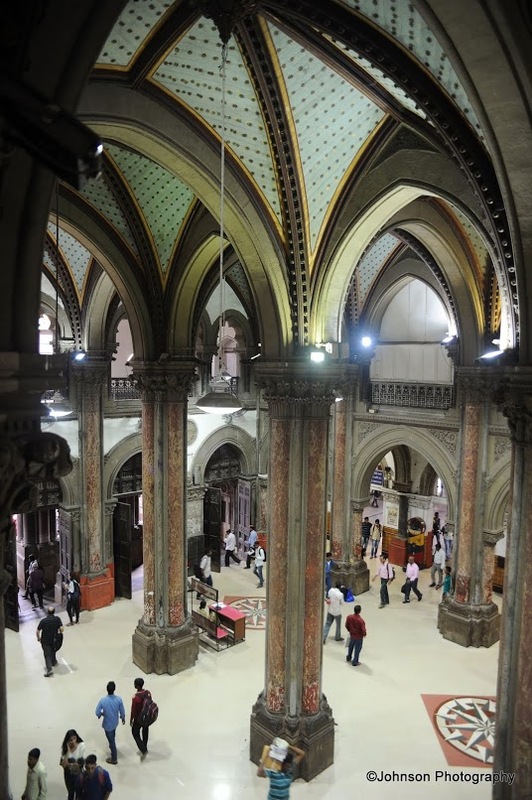 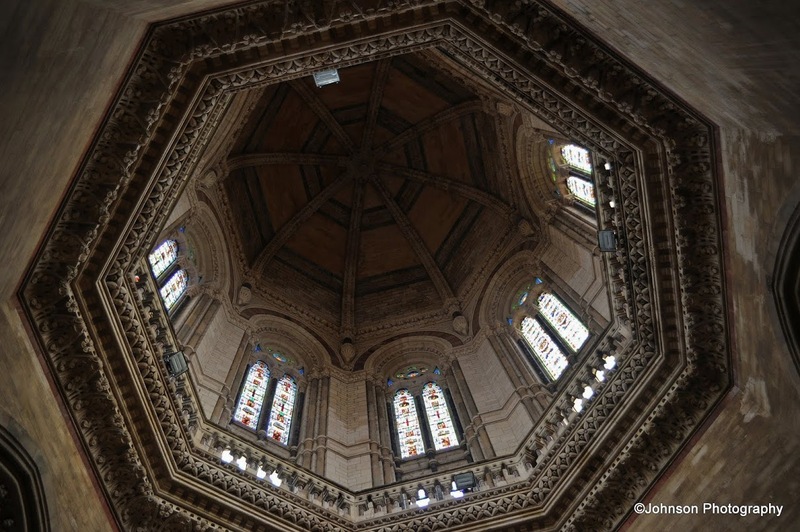 Chhatrapti Shivaji Terminus (CST) is a UNESCO World Heritage Site in Mumbai, India. 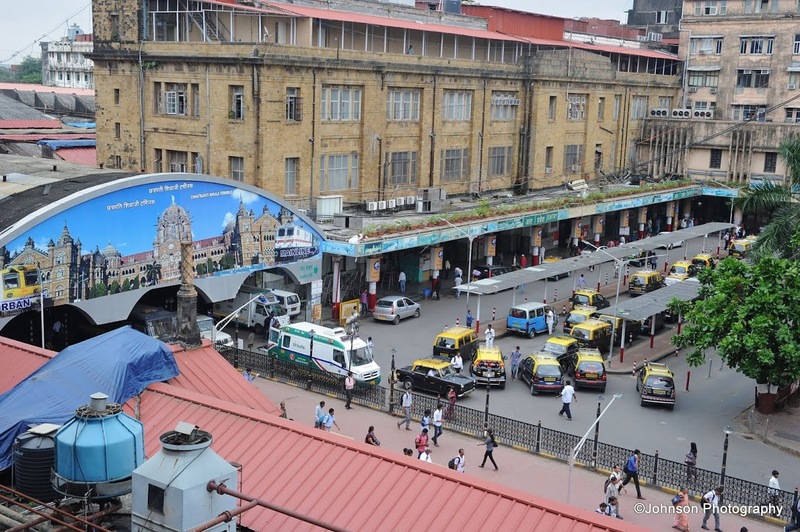 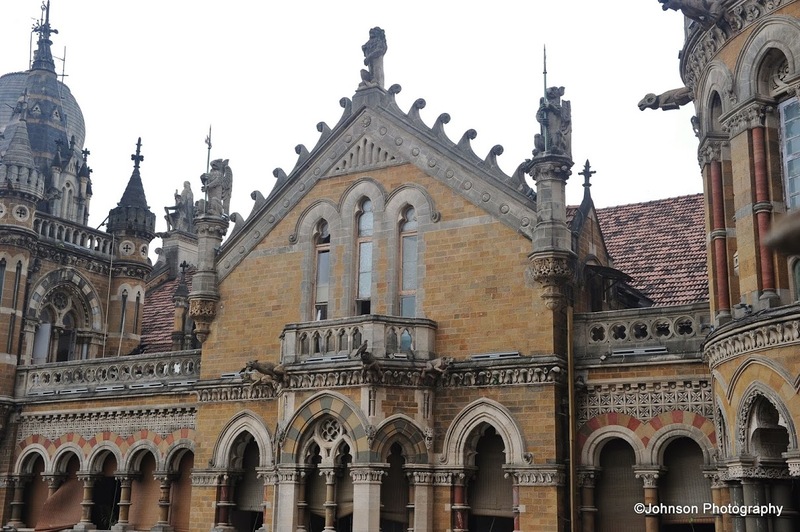 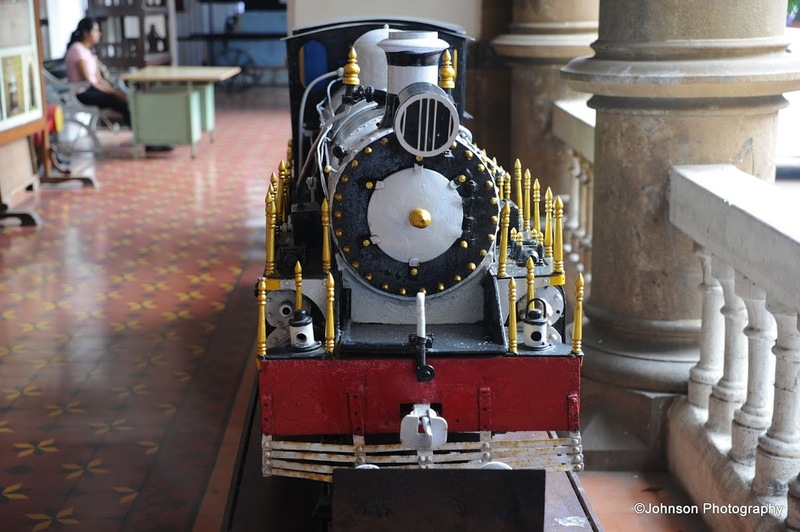 This historic railway station is one of the busiest in India. 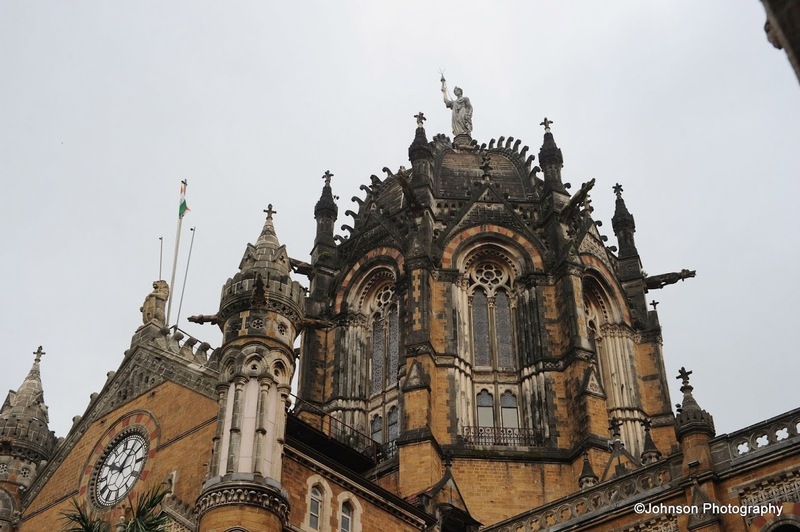 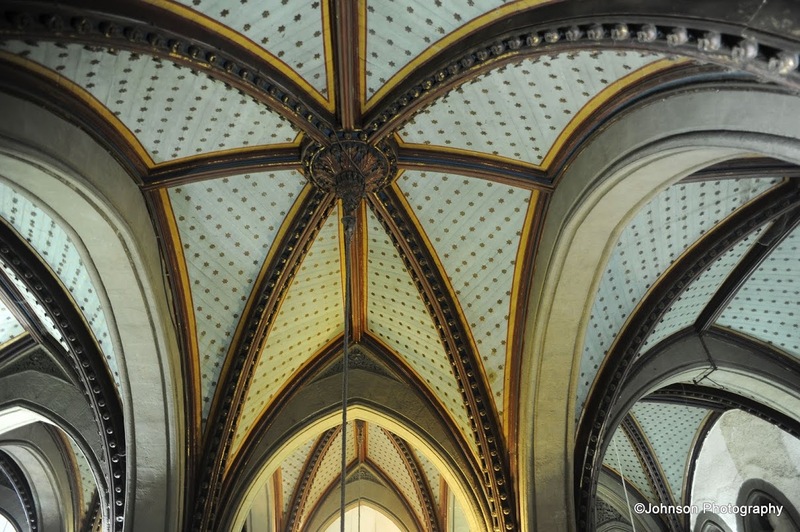 Built in 1887 this gothic structure is the most photographed monument in India after the Taj Mahal. 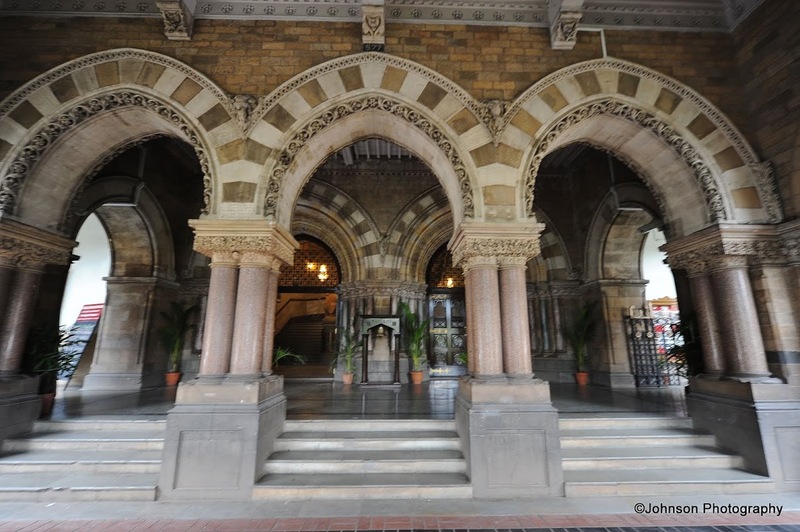 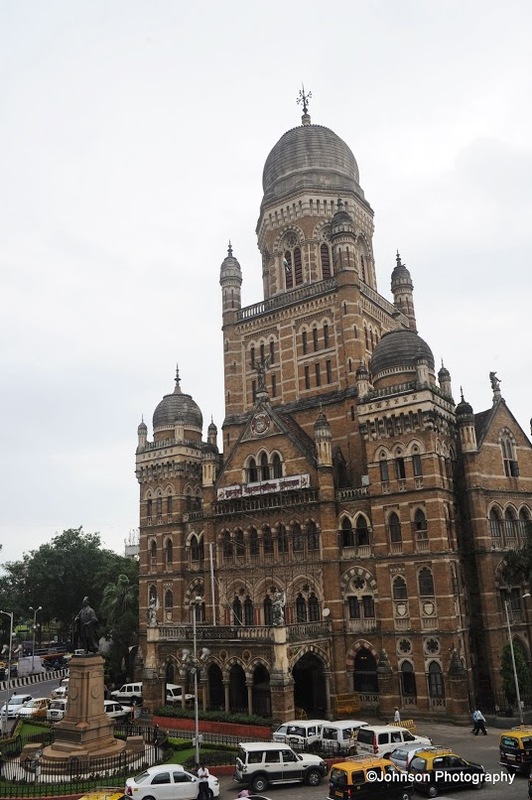 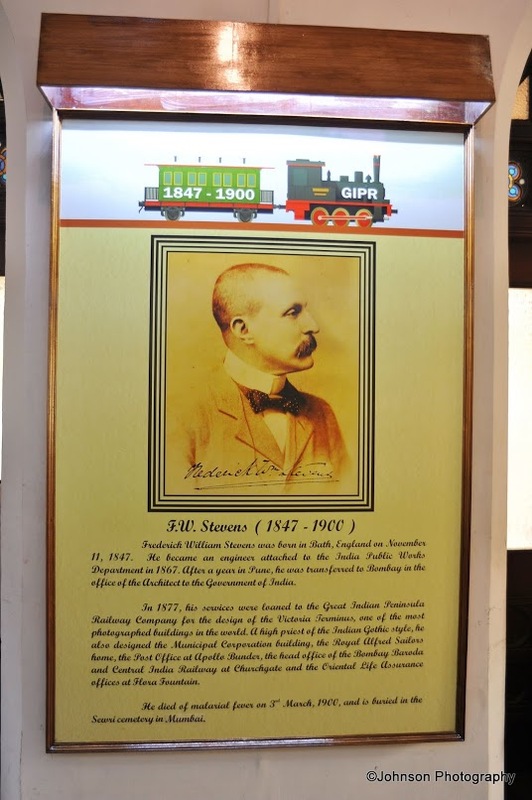 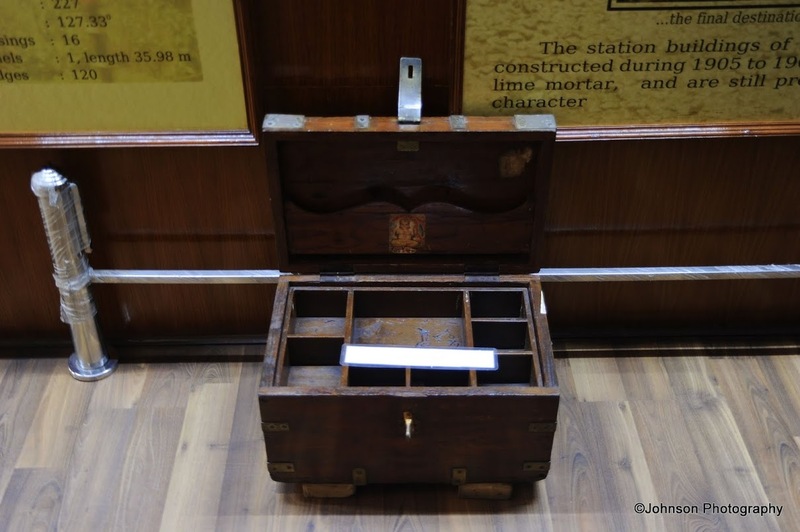 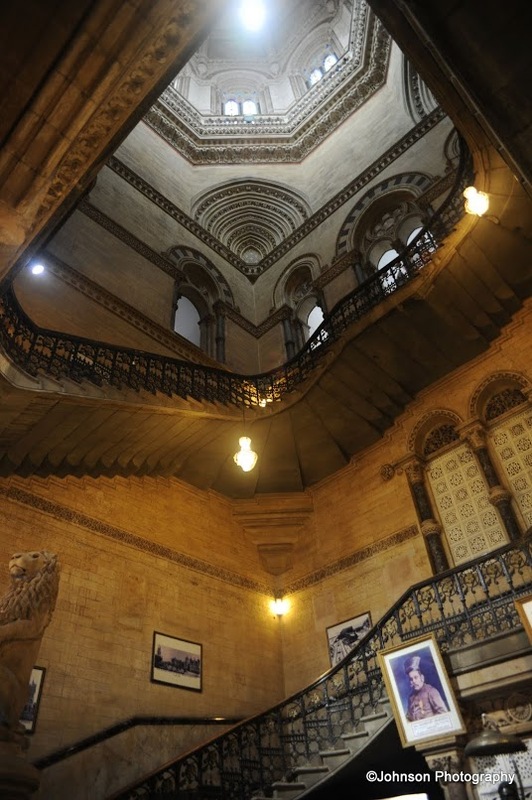 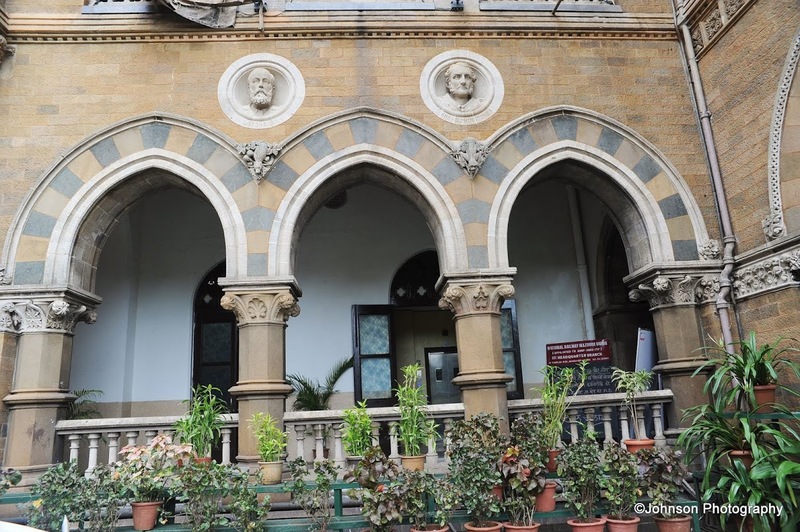 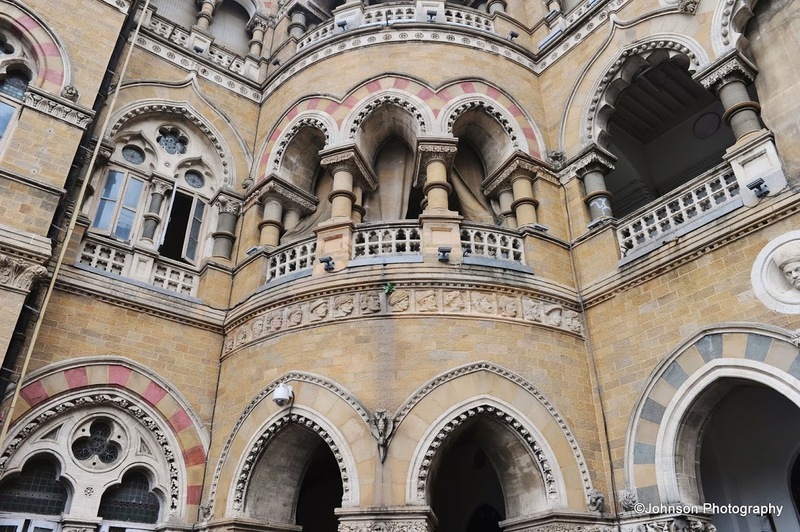 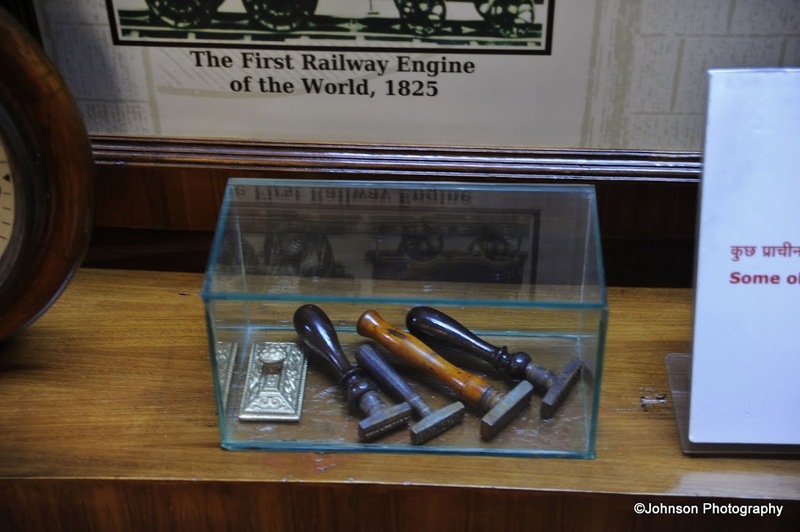 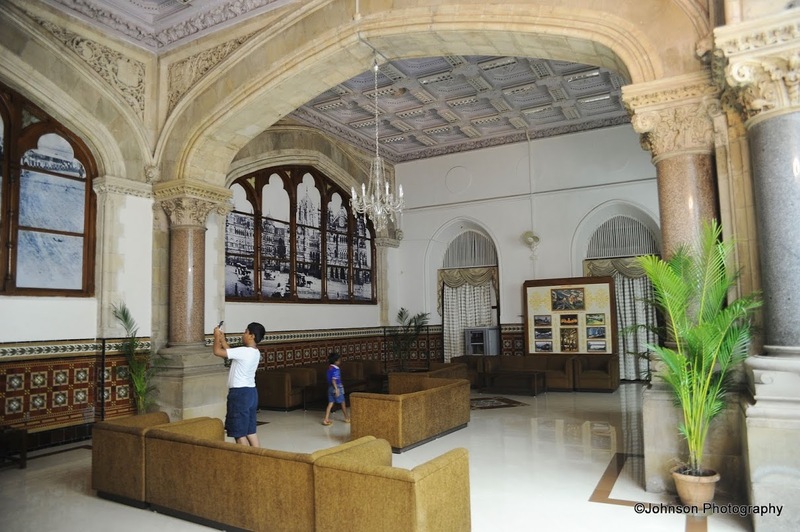 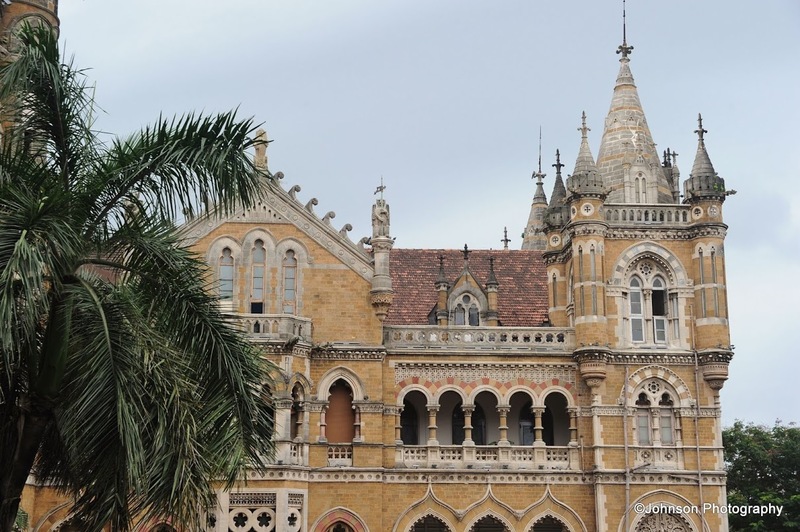 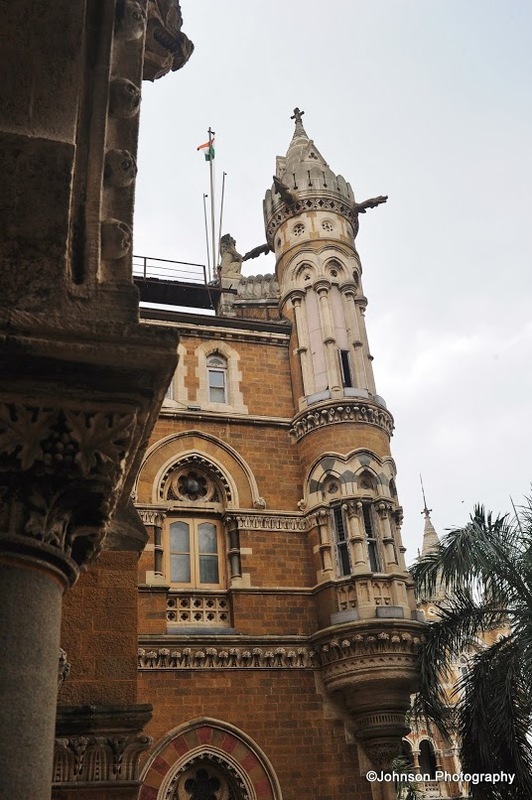 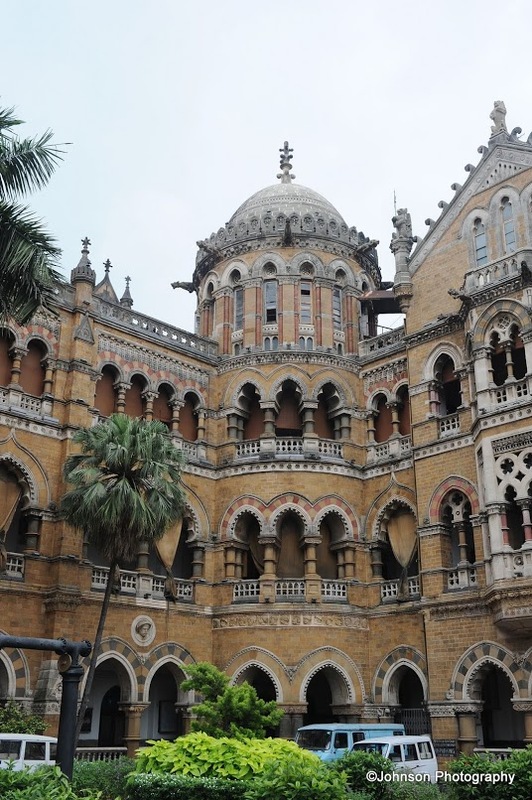 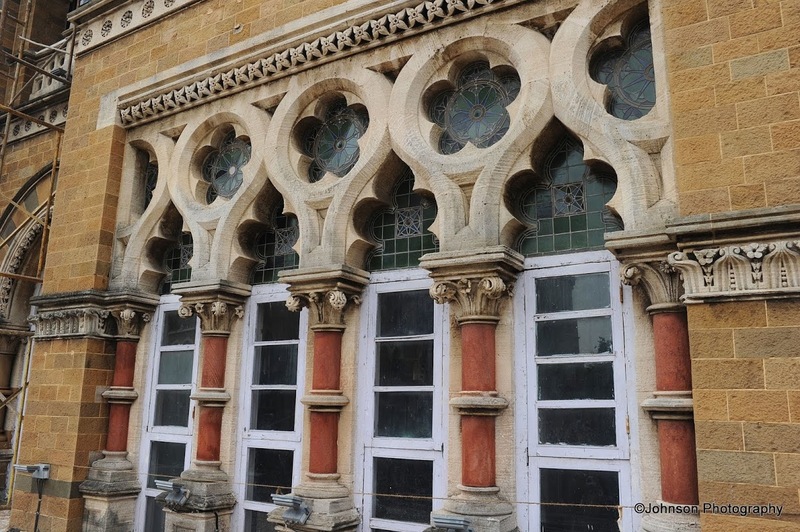 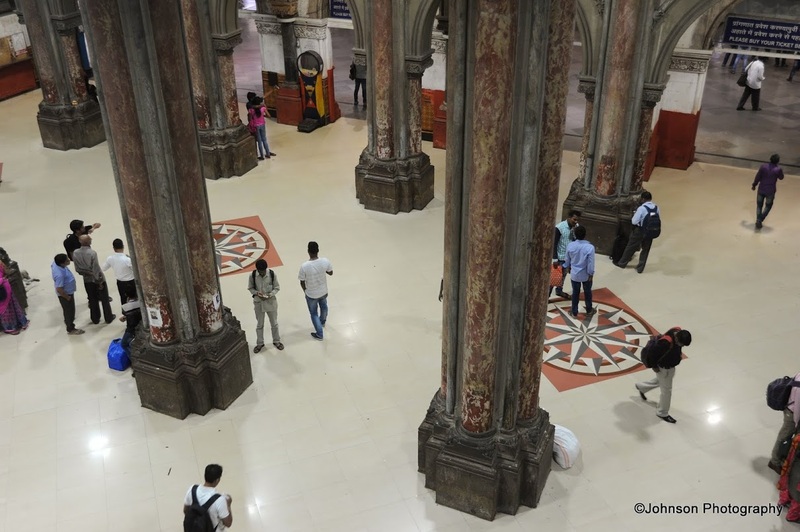 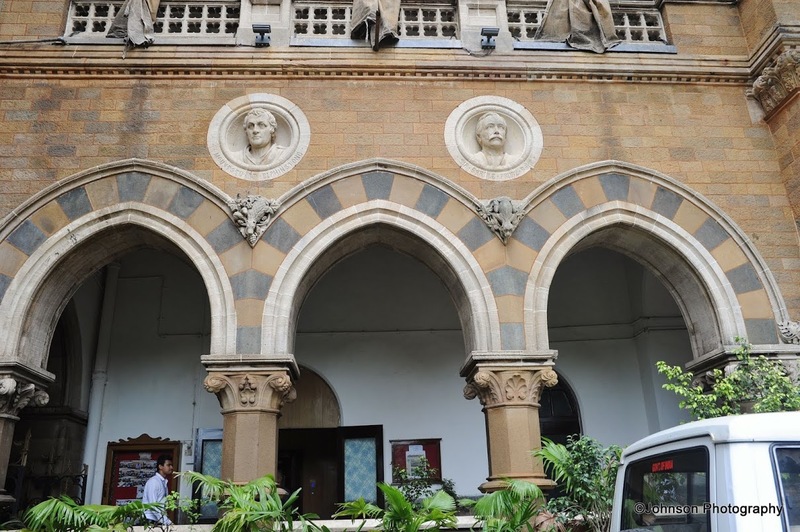 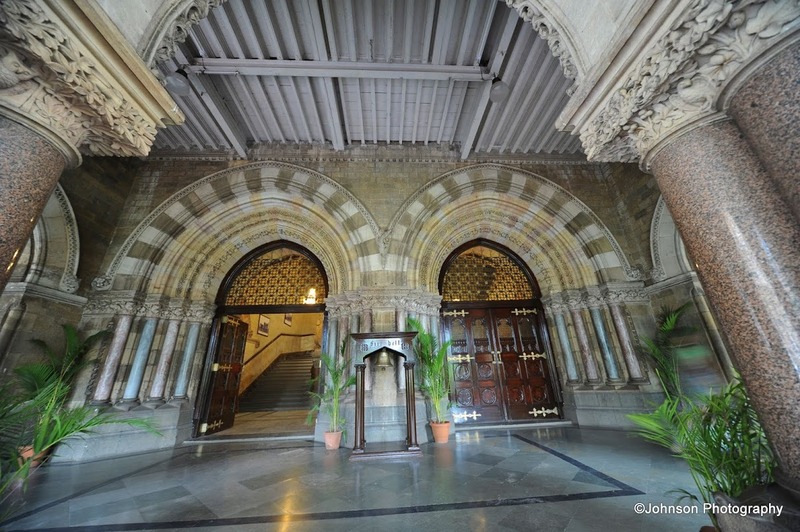 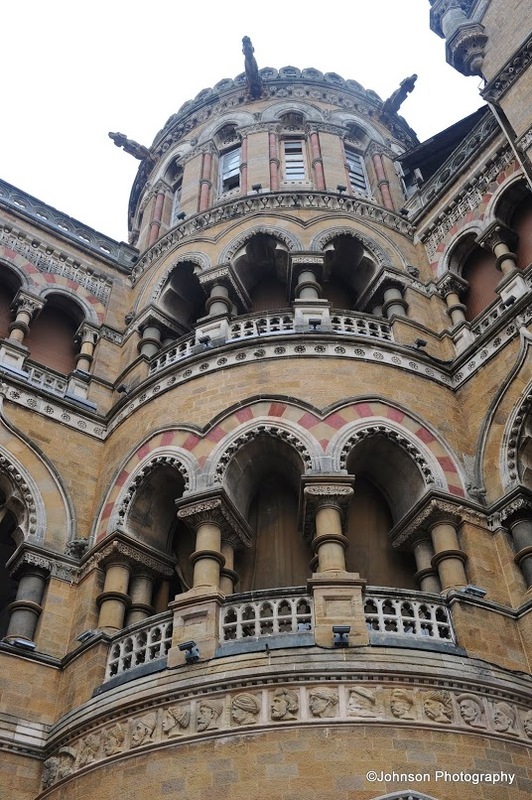 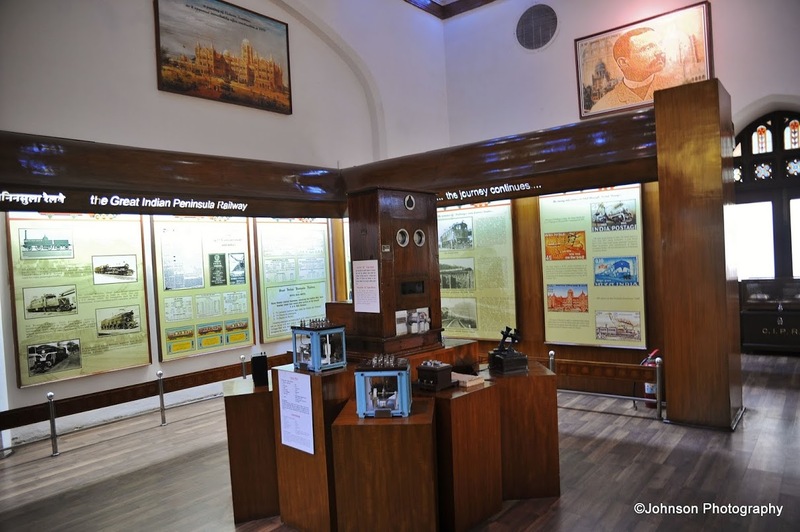 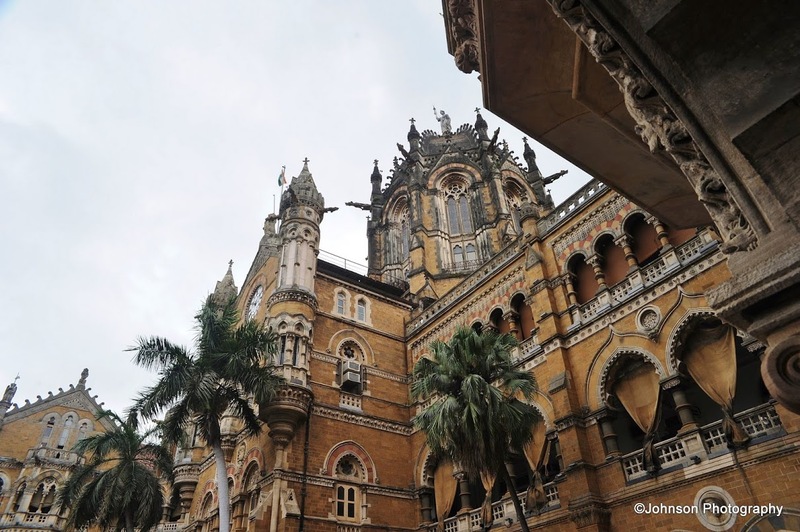 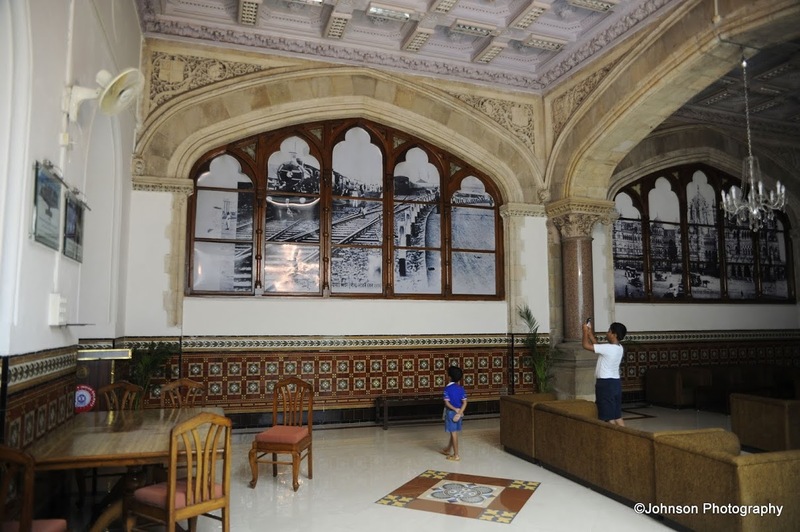 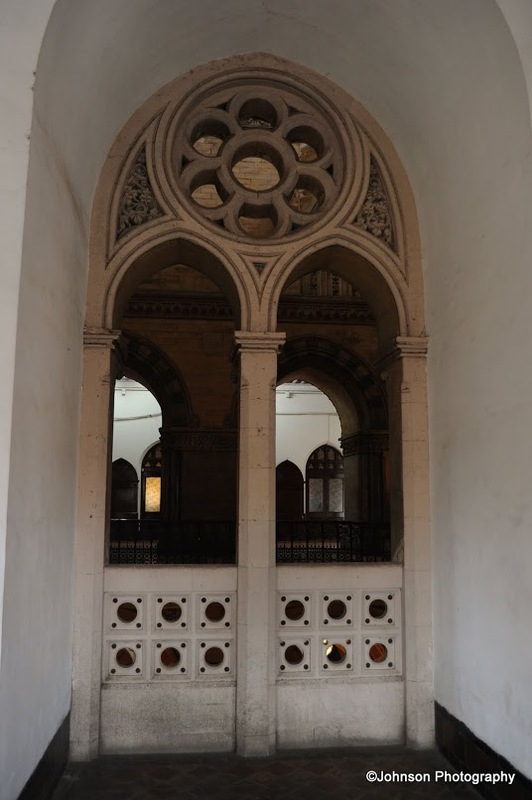 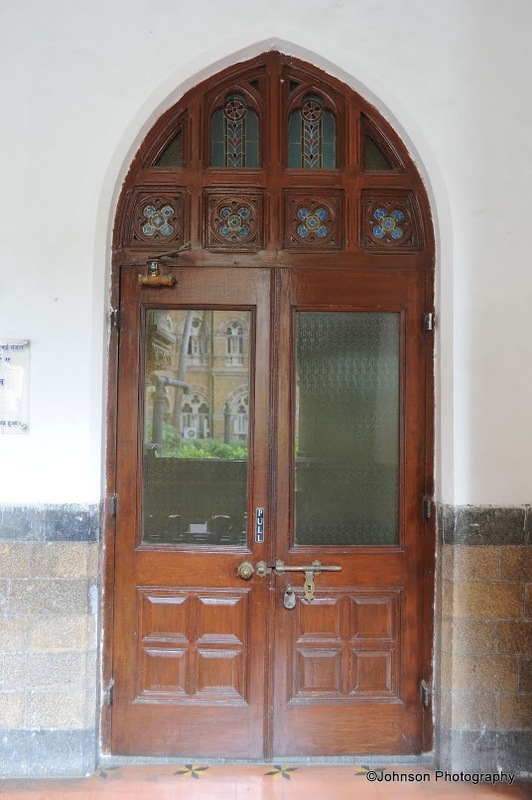 Originally it was called Victoria Terminus and was intended to house the main station and the administrative offices of the Great Indian Peninsular Railway the predecessor of Indian Railway. 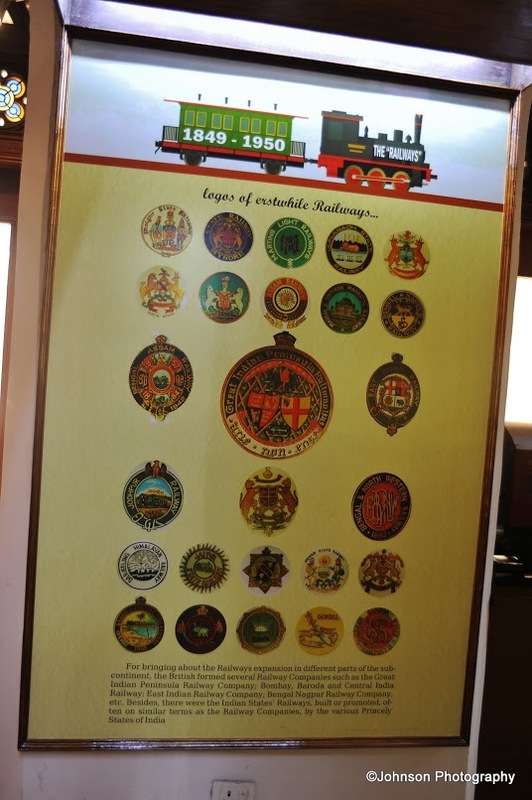 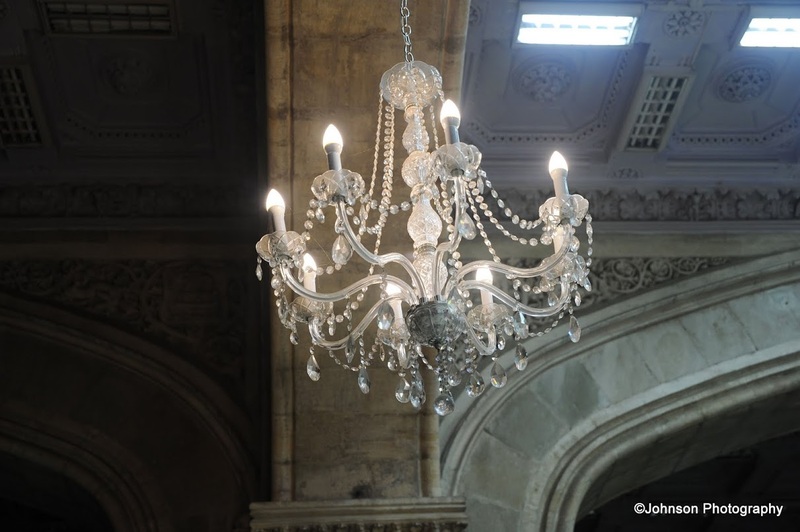 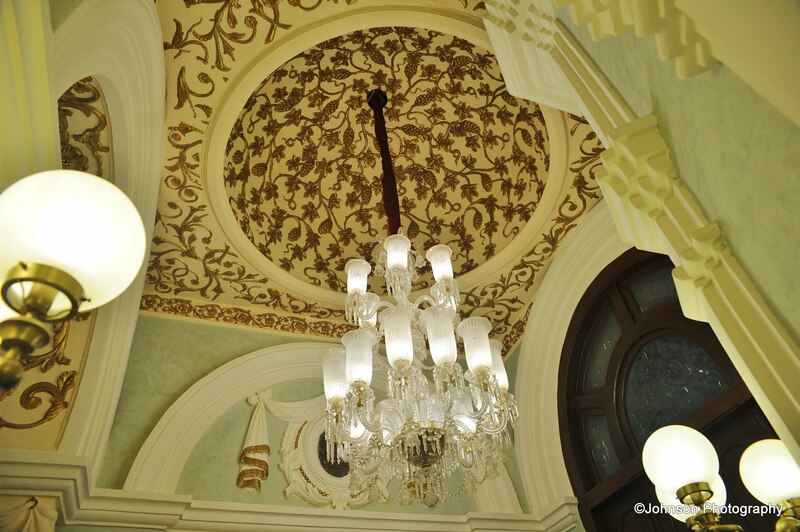 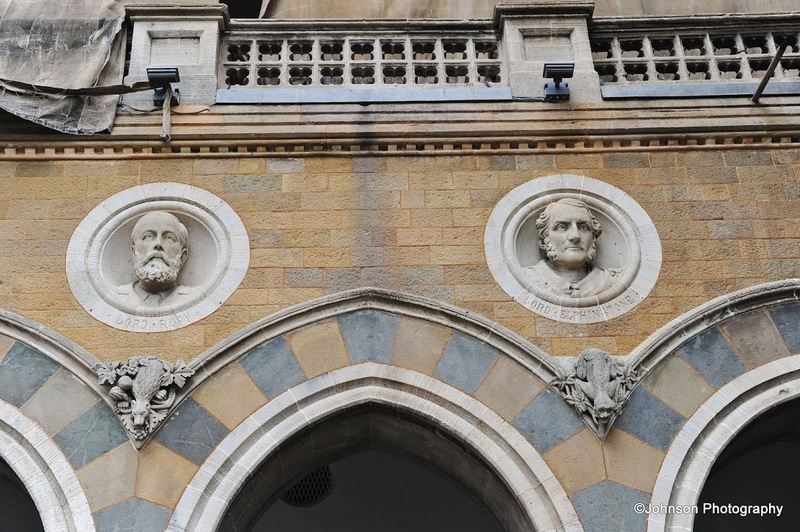 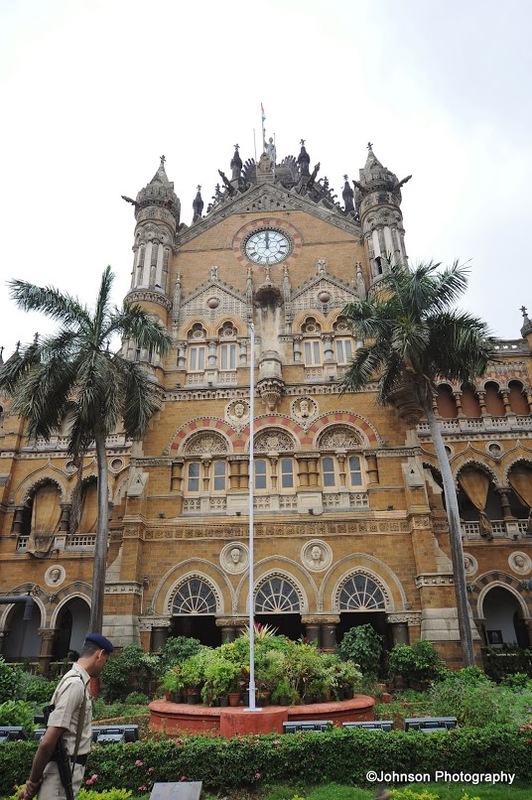 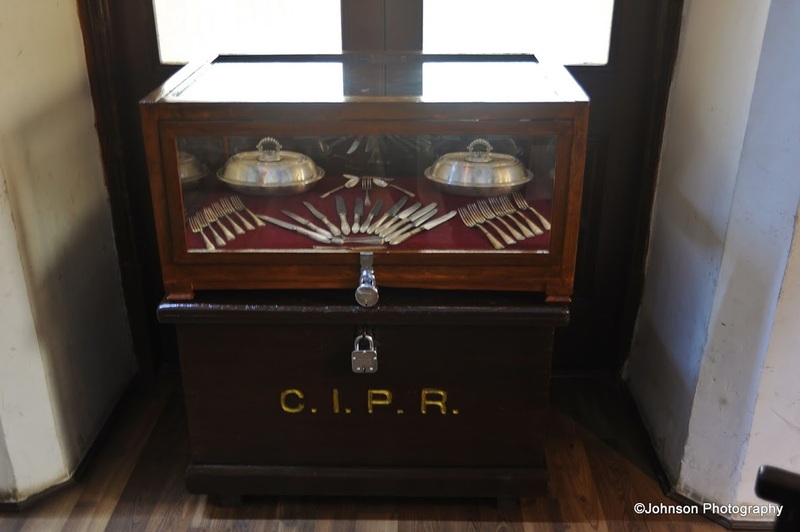 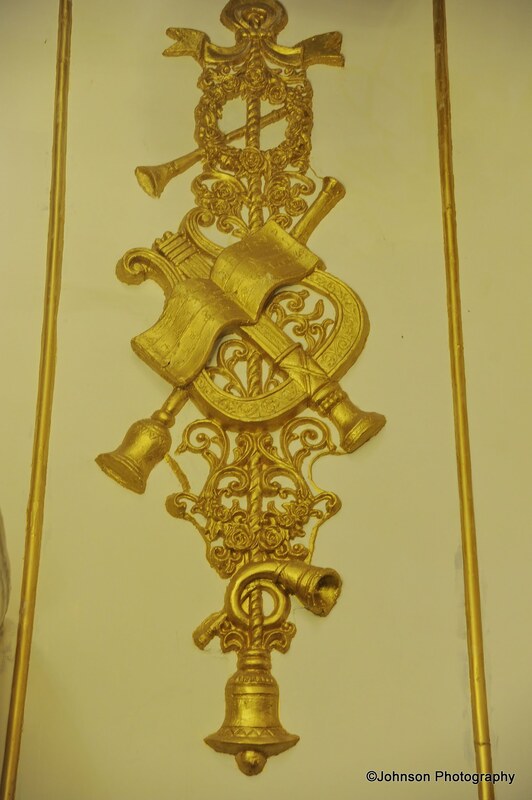 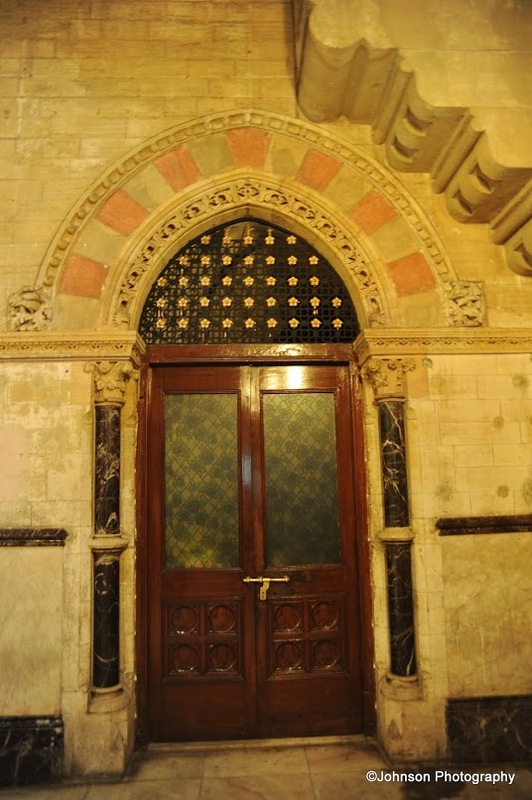 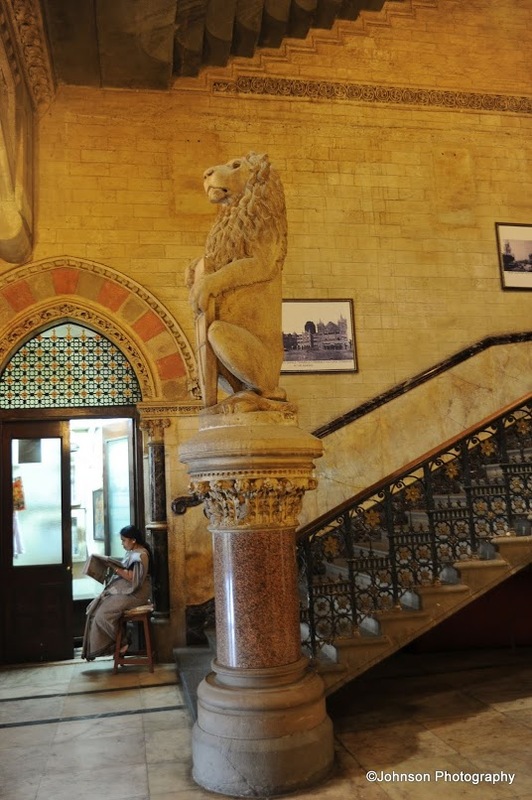 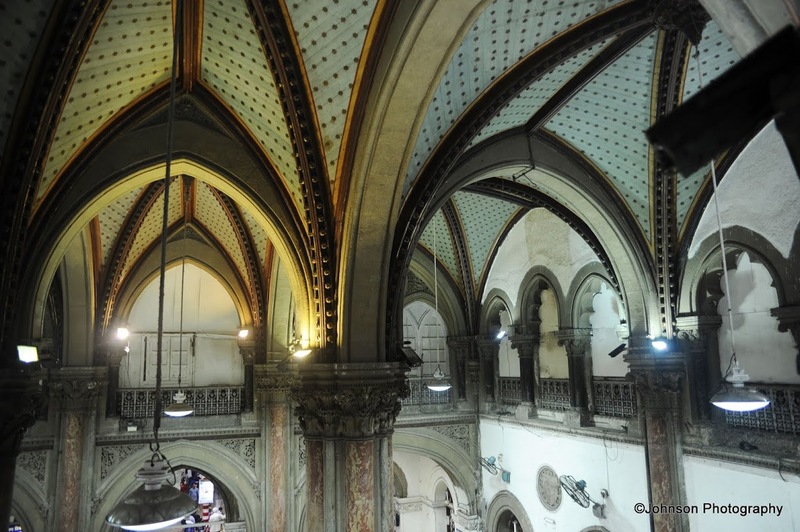 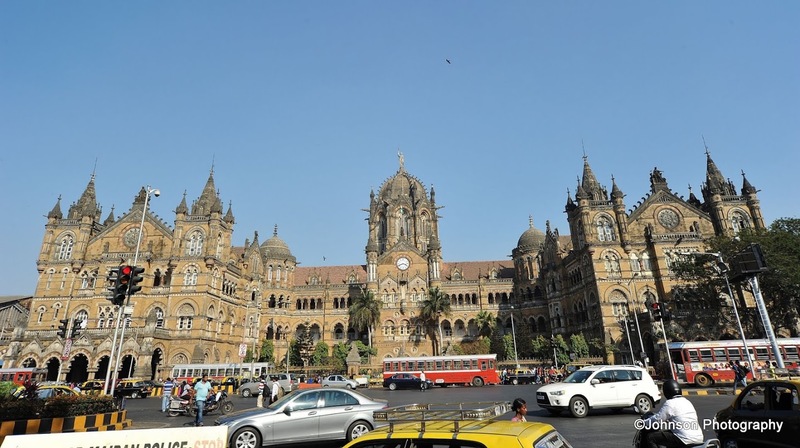 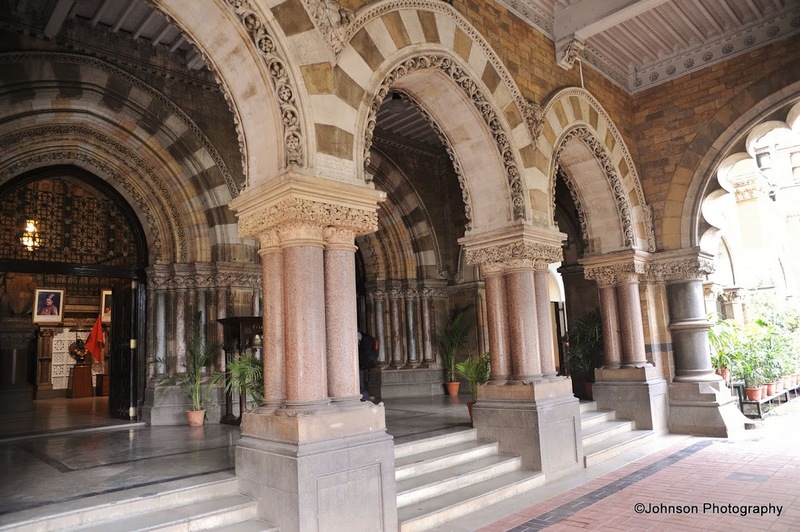 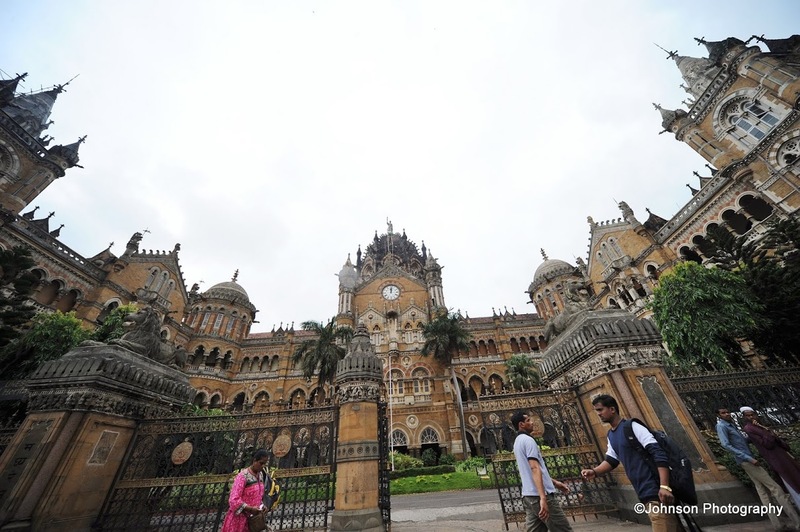 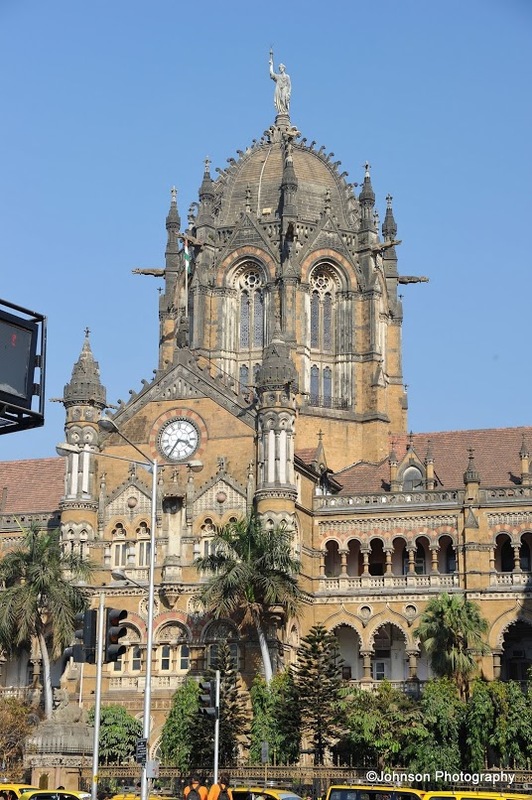 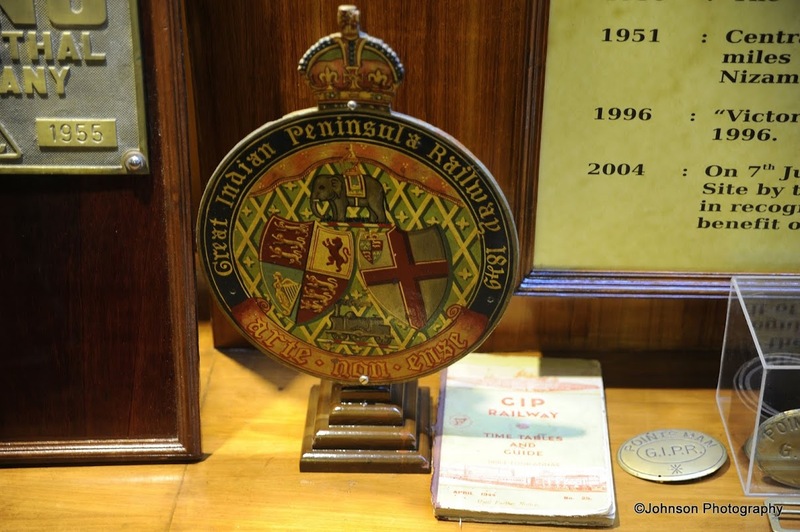 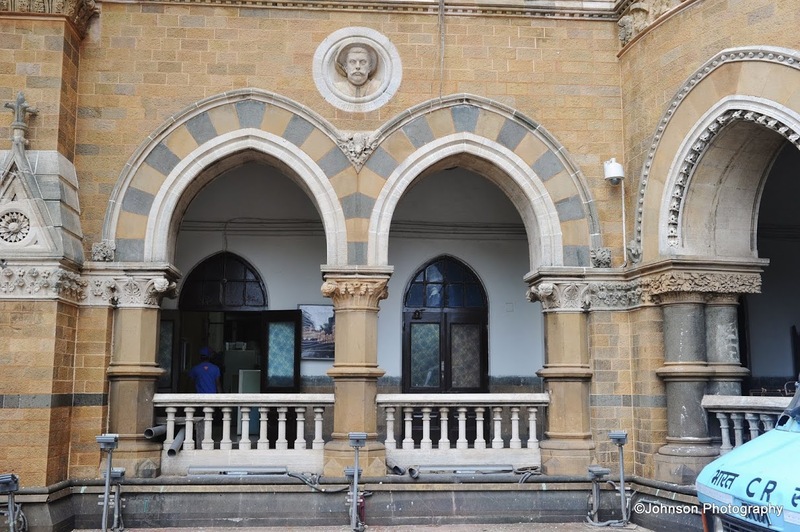 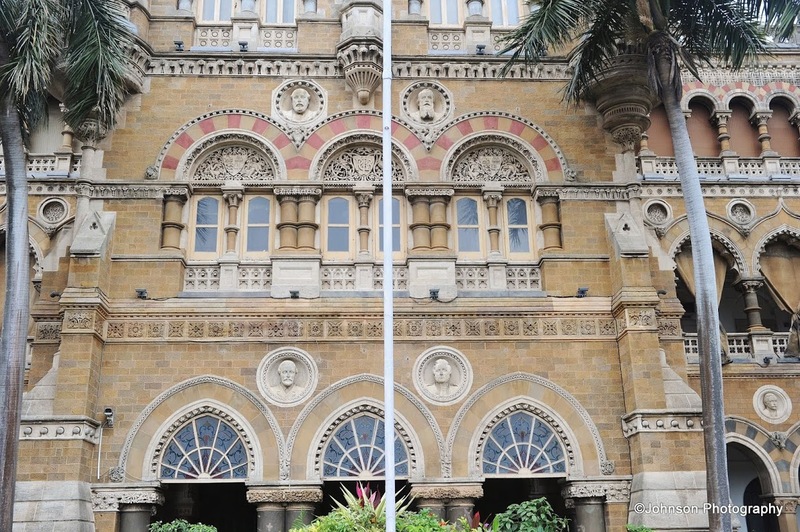 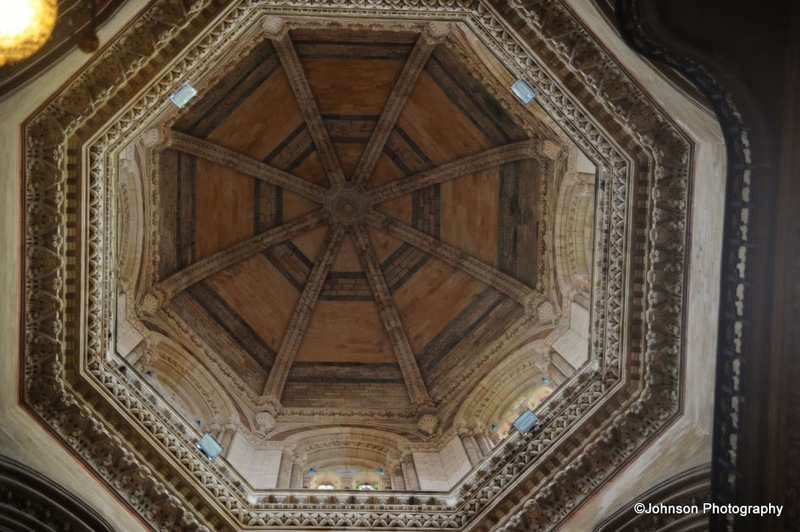 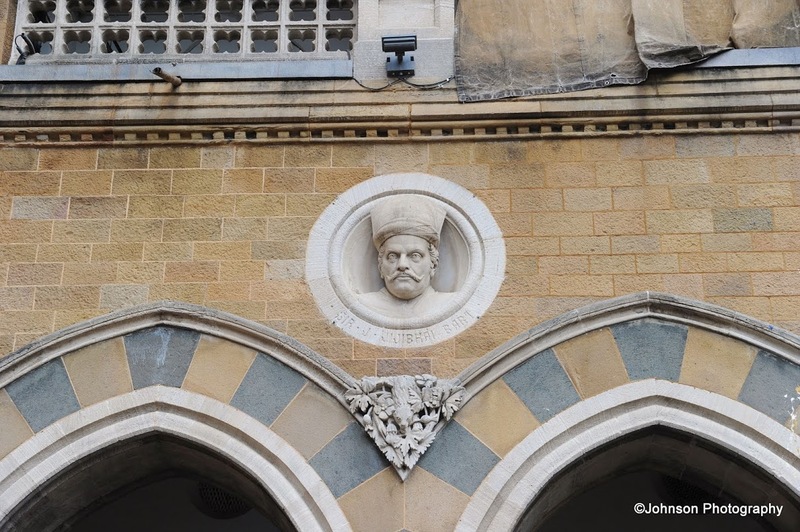 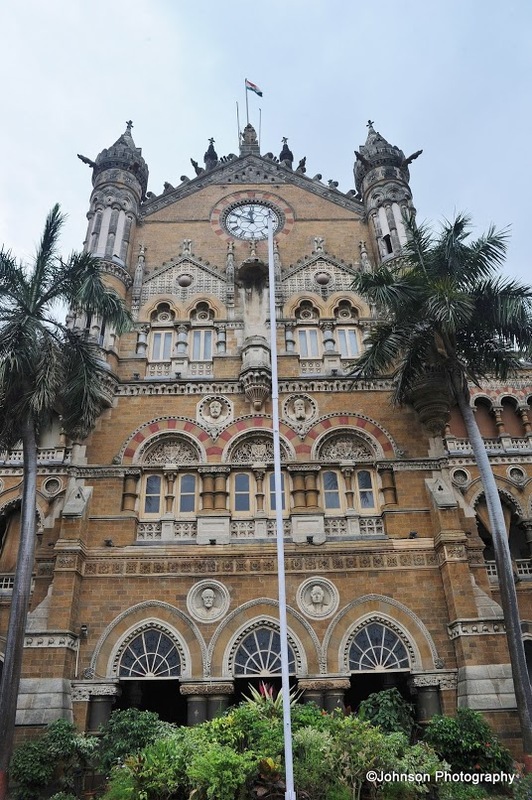 In March 1996 its name was changed to Chhatrapti Shivaji Terminus and known simply as CST. 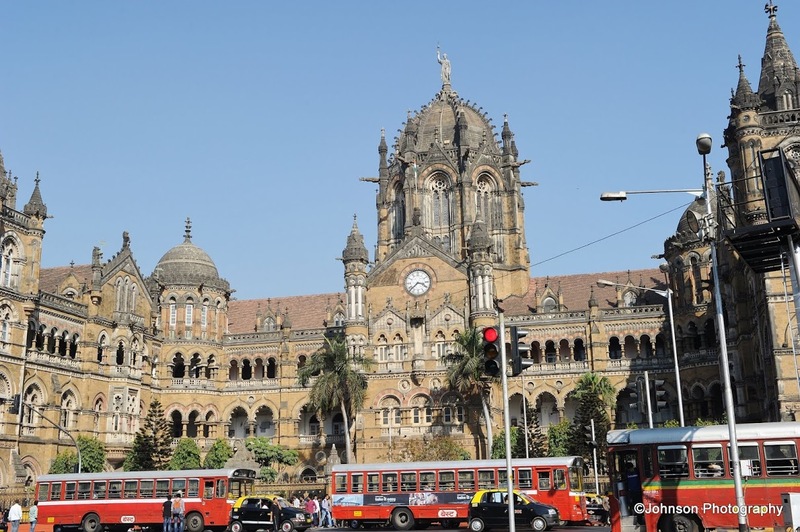 The CST has 18 platforms out of which 7 are reserved for local suburban trains and 11 are for long distance out-station trains. 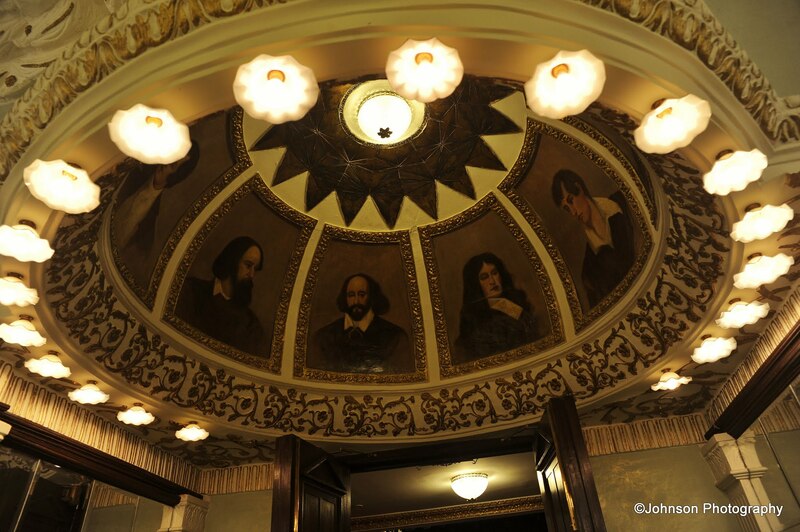 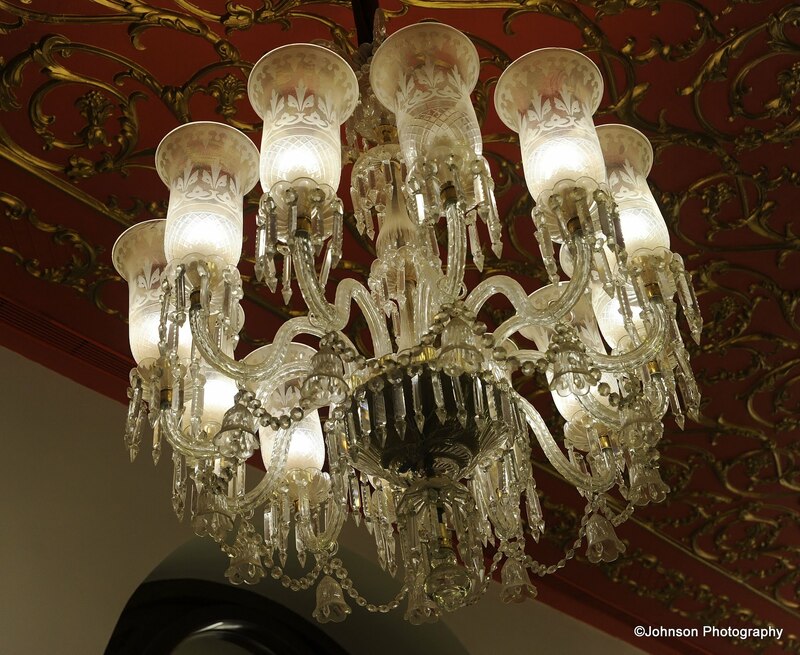 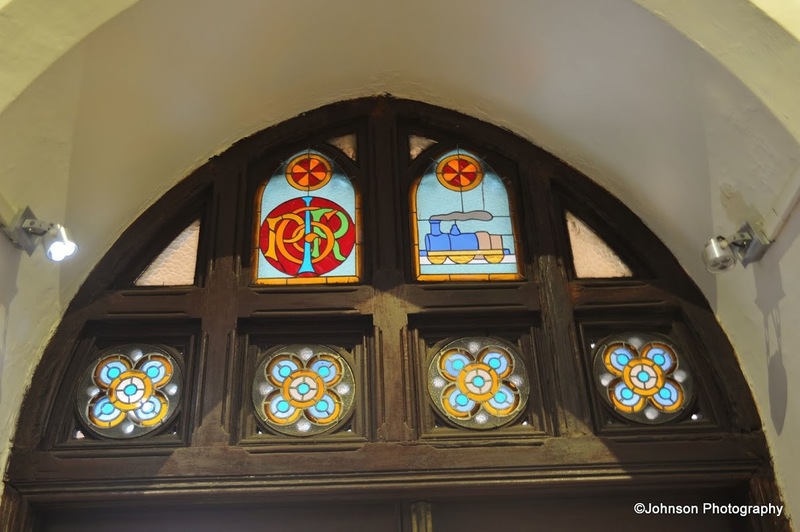 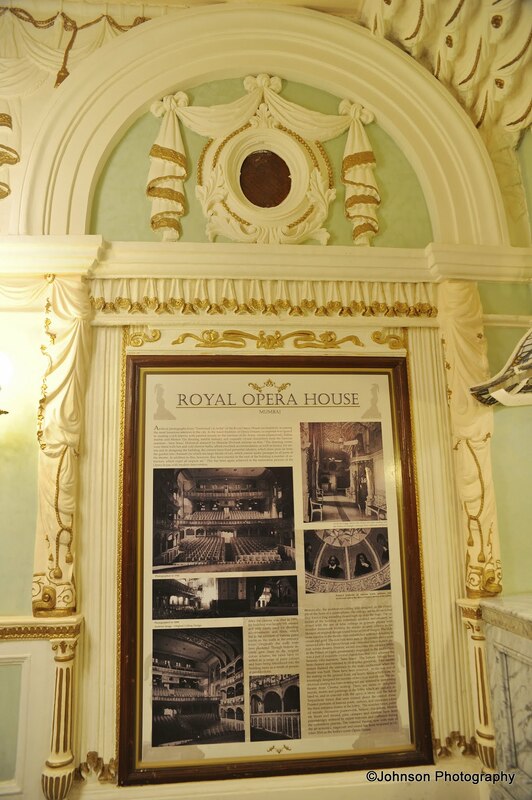 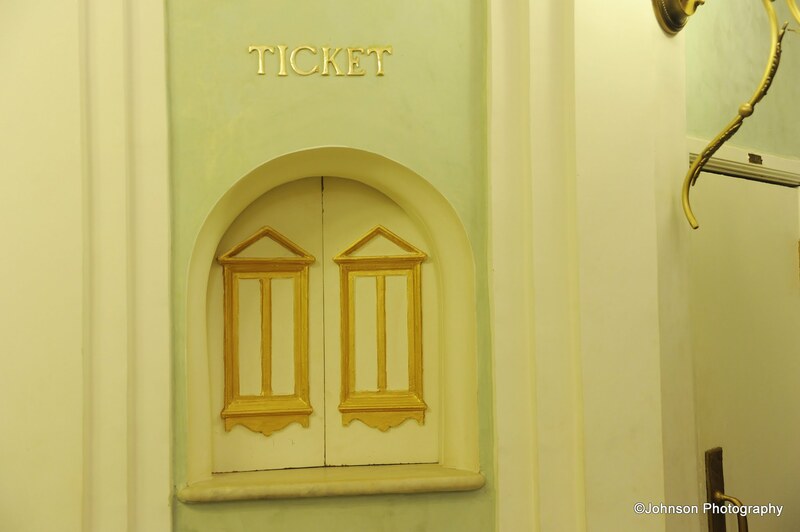 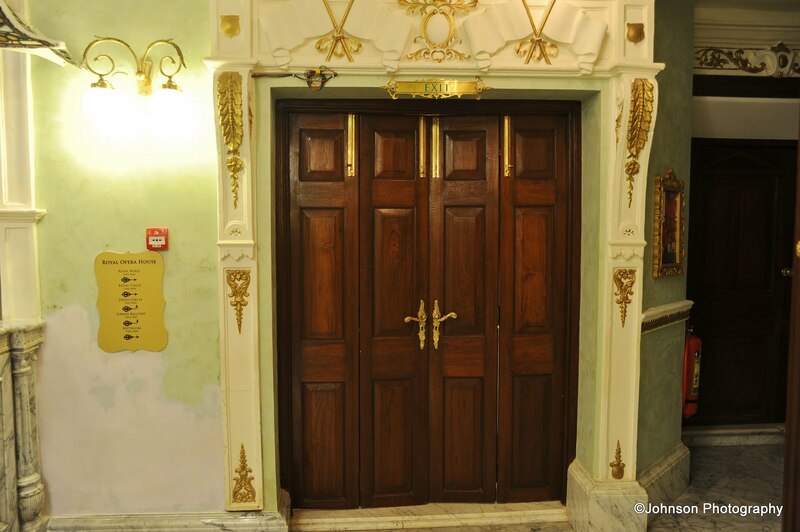 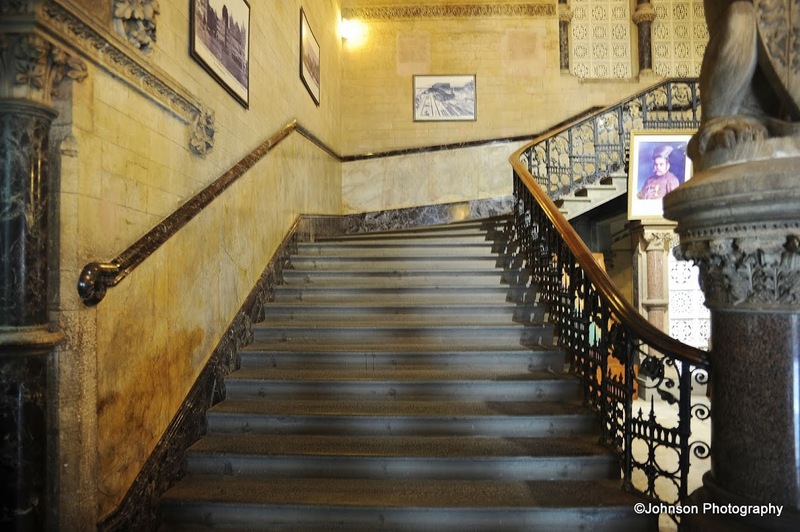 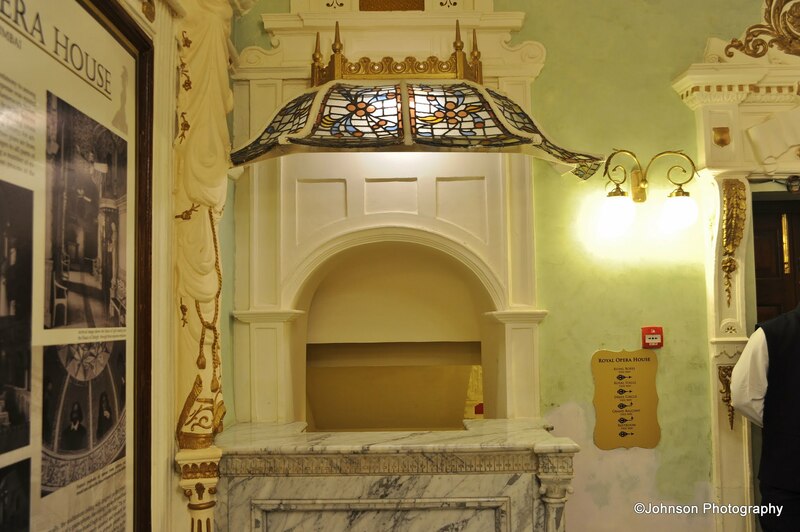 The tour also includes tea and biscuits in the Heritage Lounge at second floor. 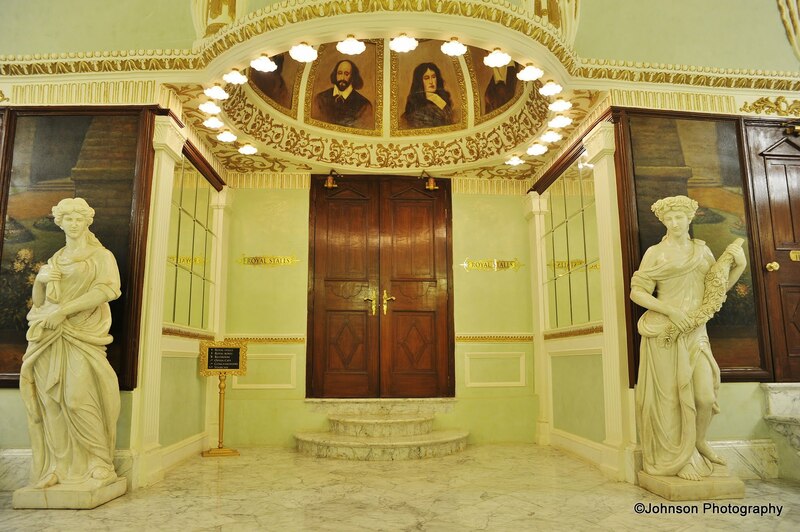 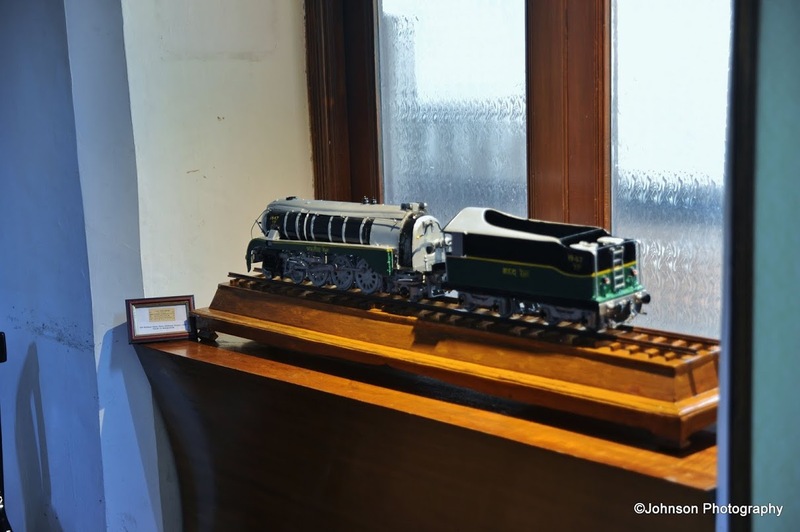 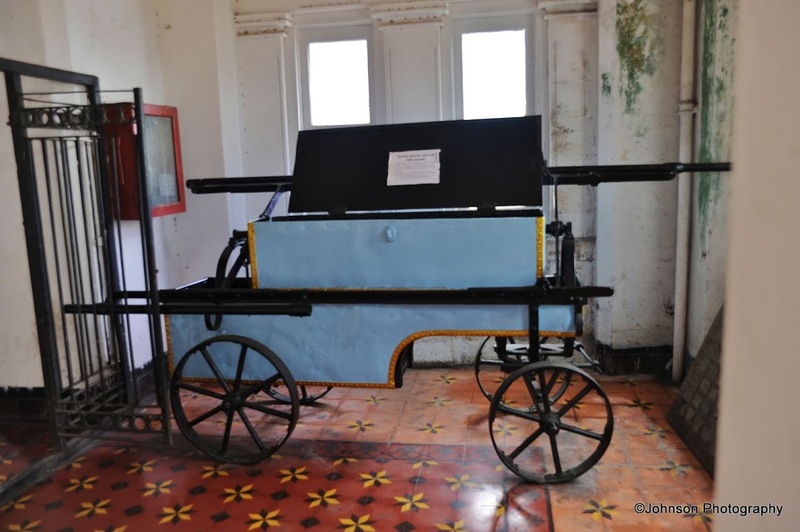 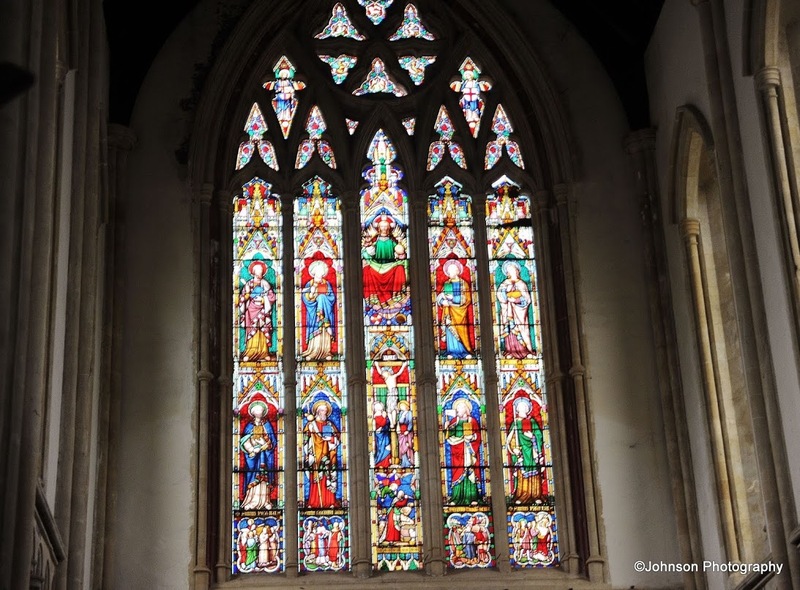 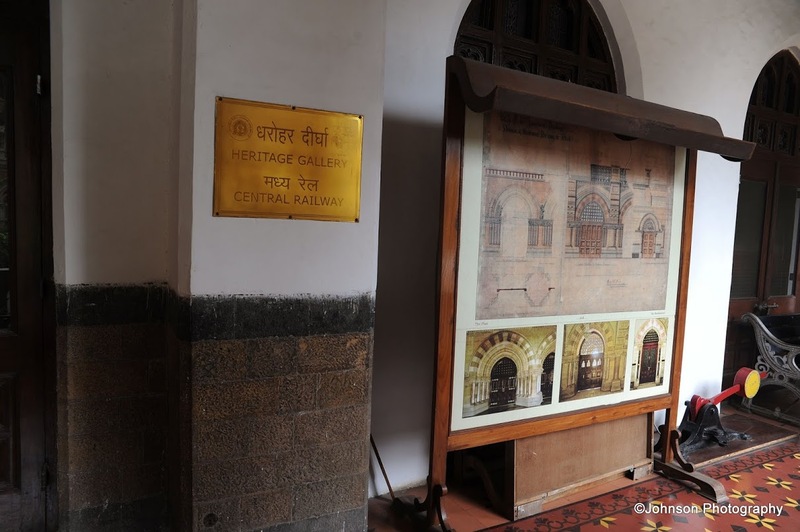 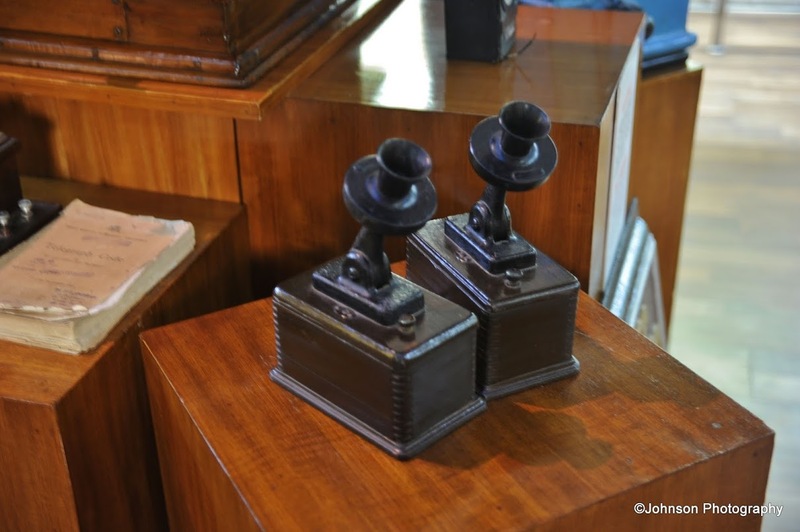 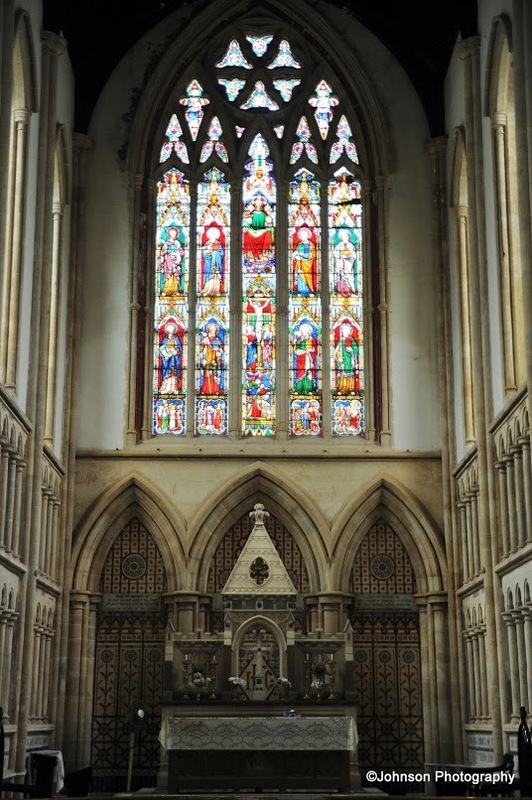 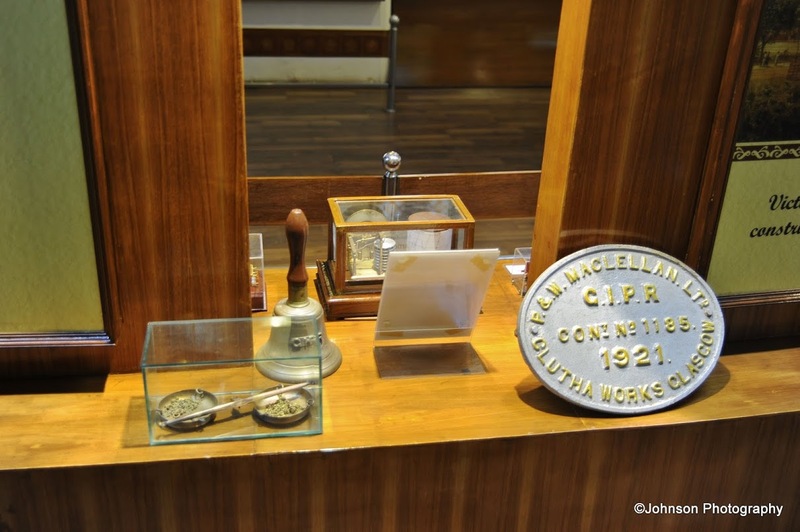 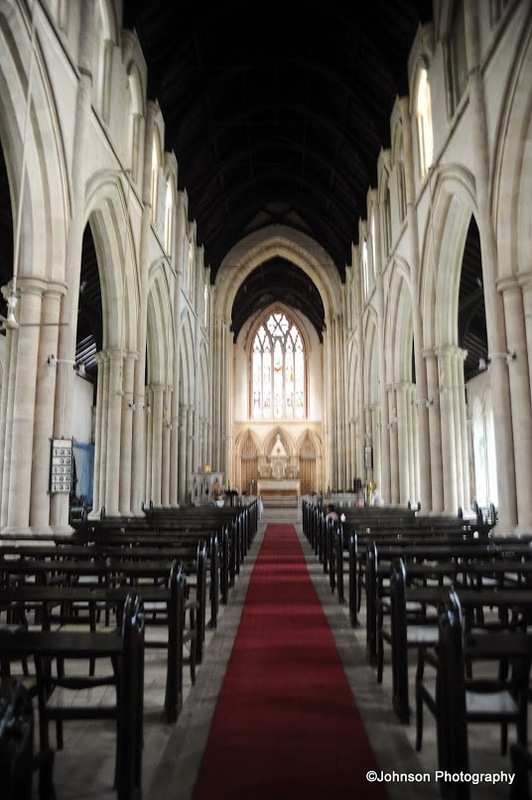 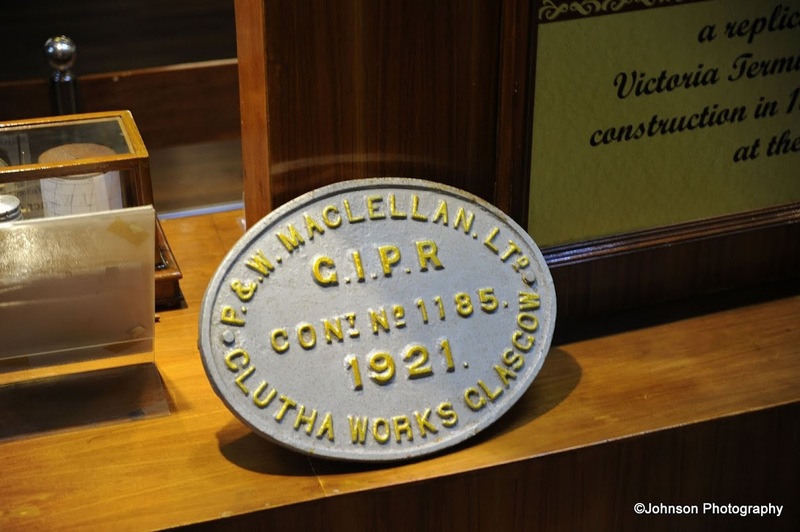 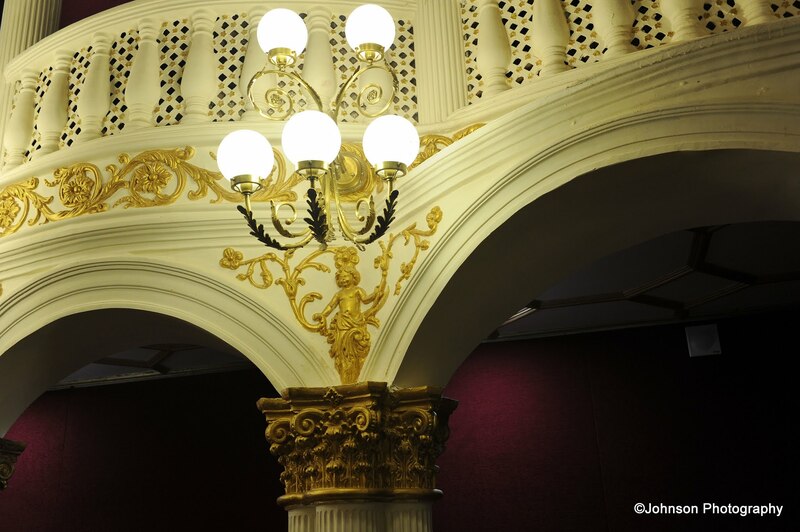 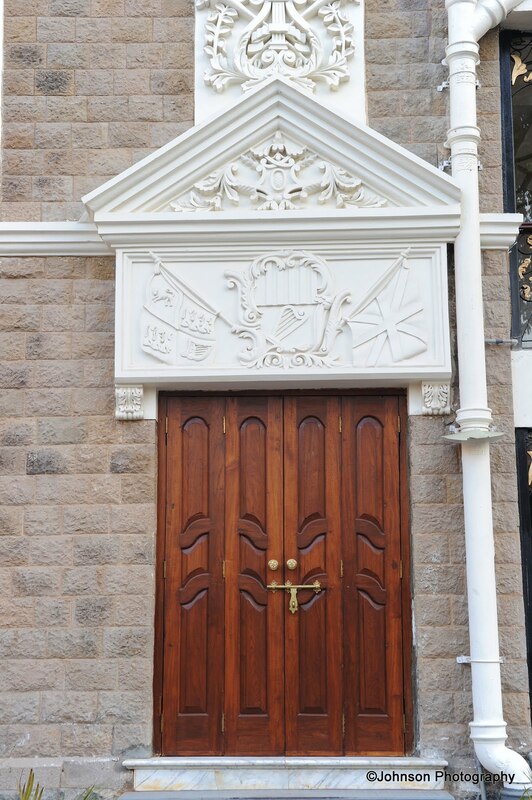 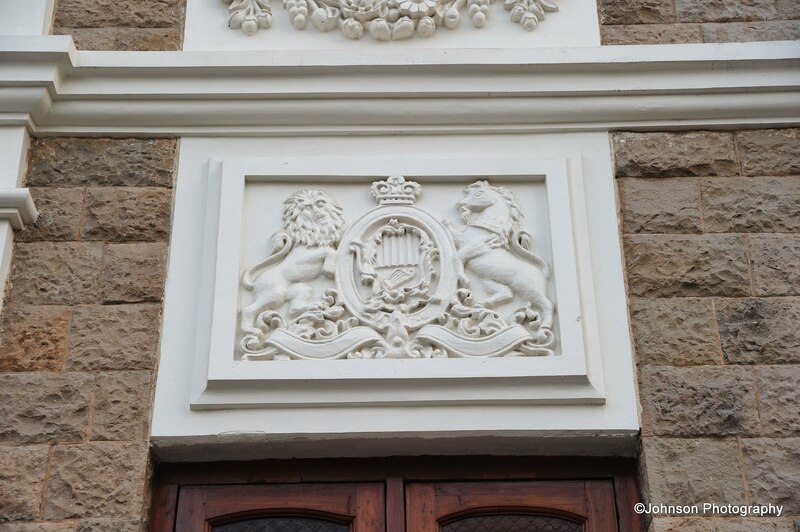 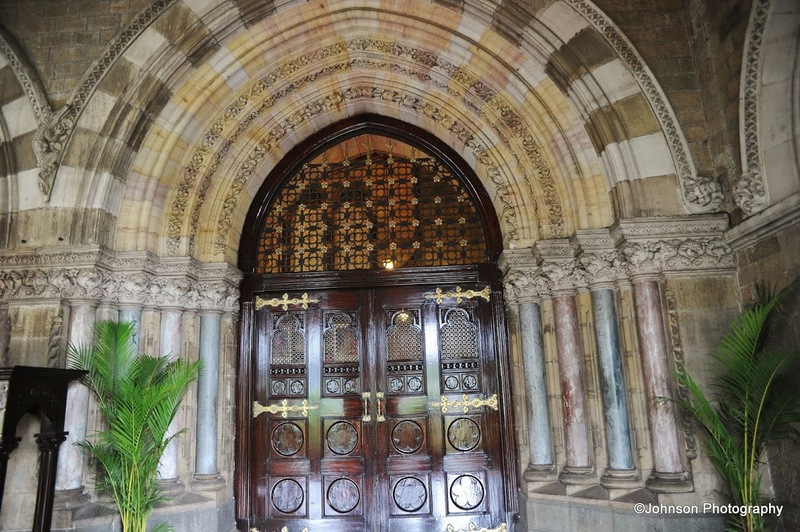 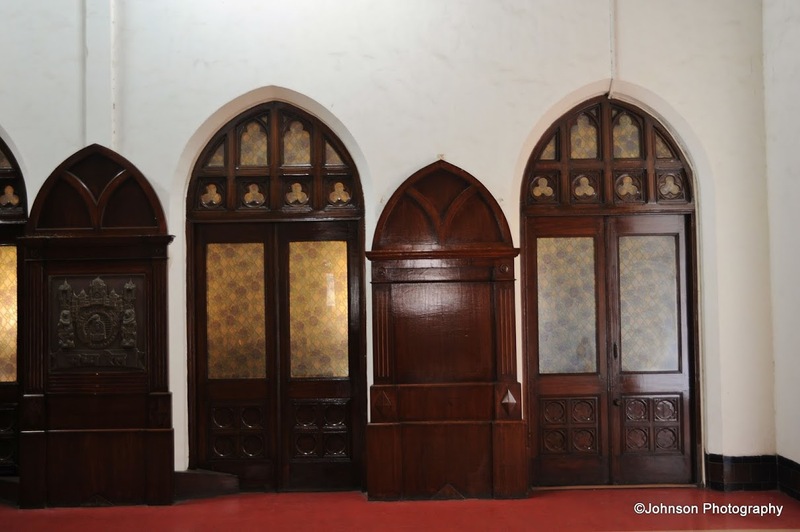 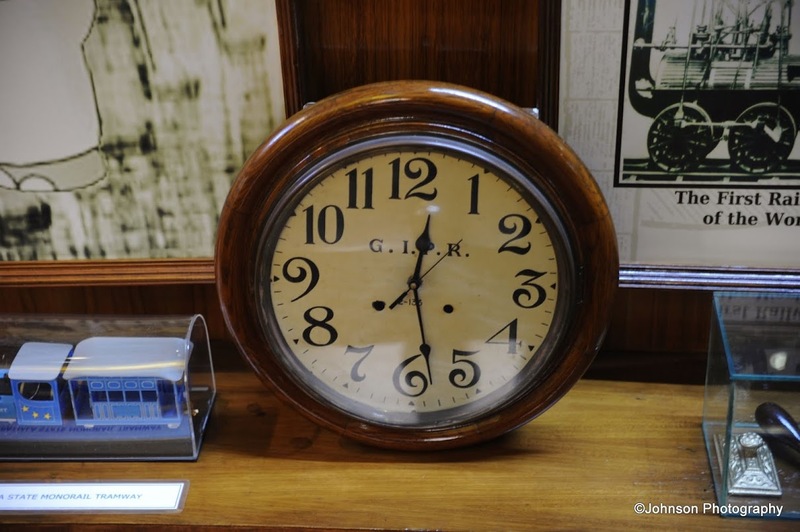 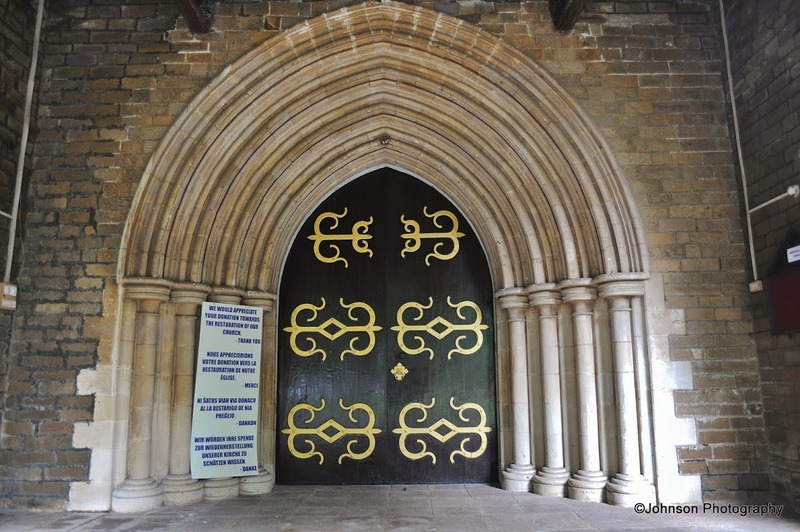 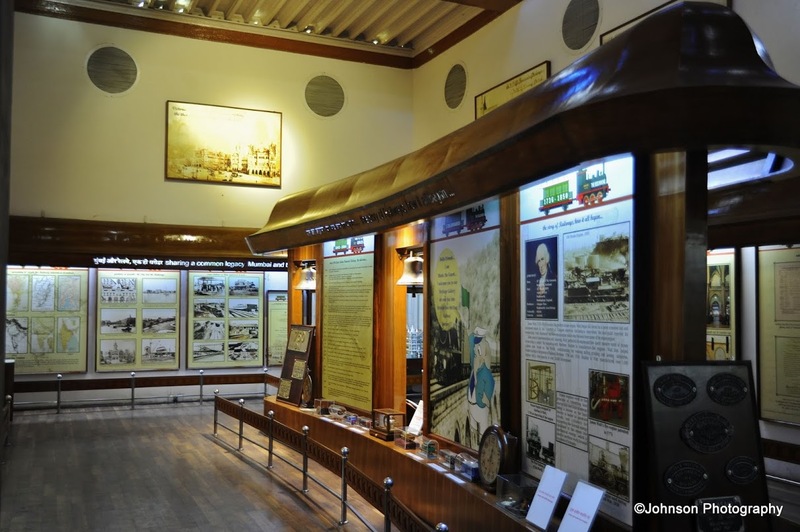 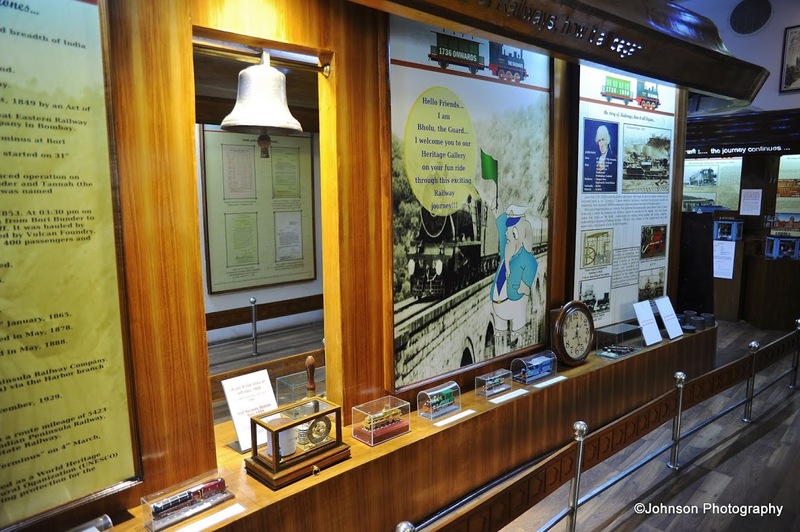 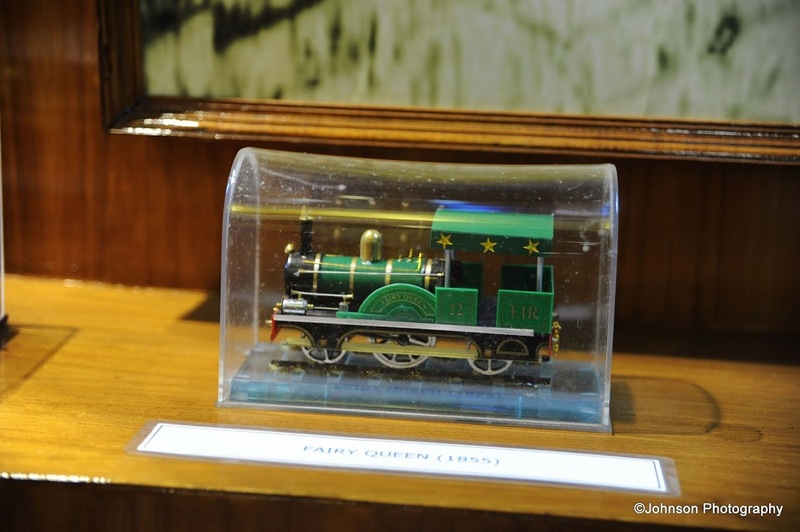 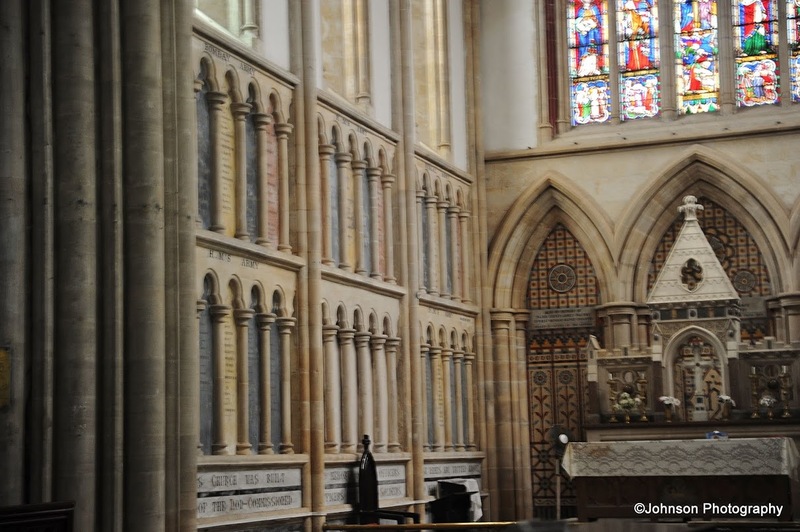 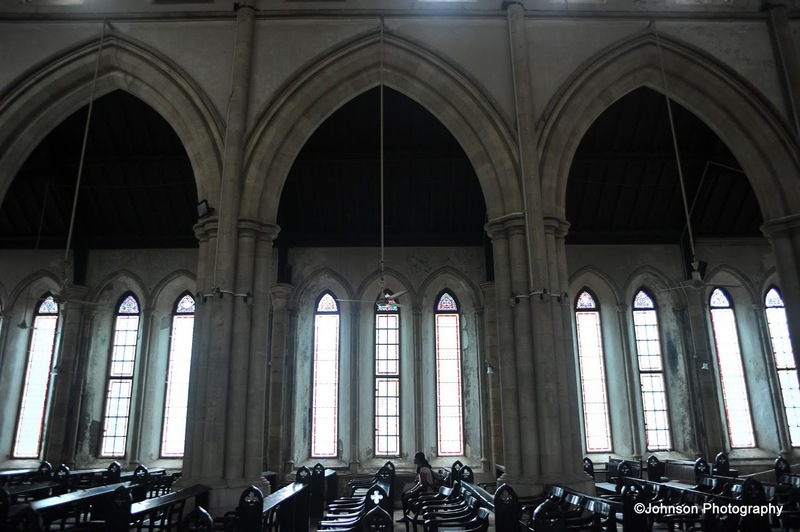 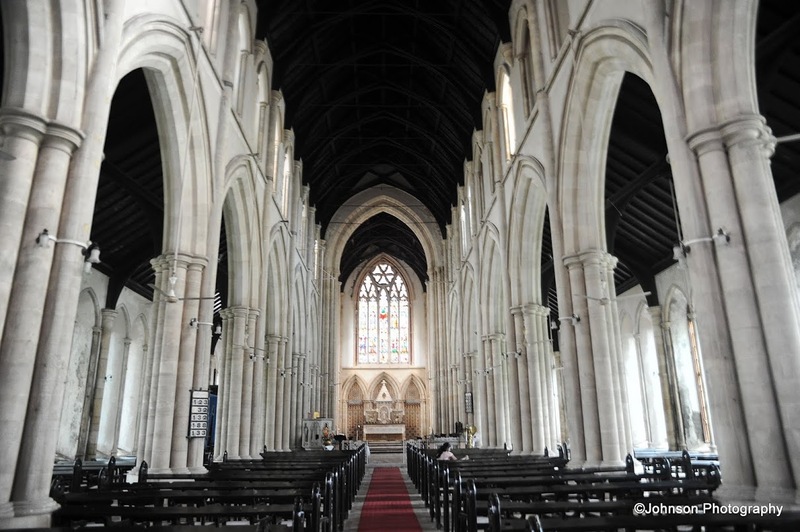 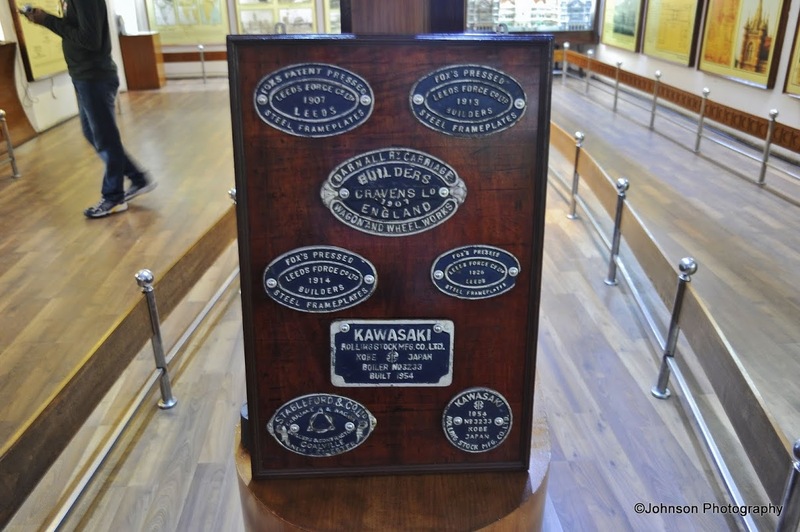 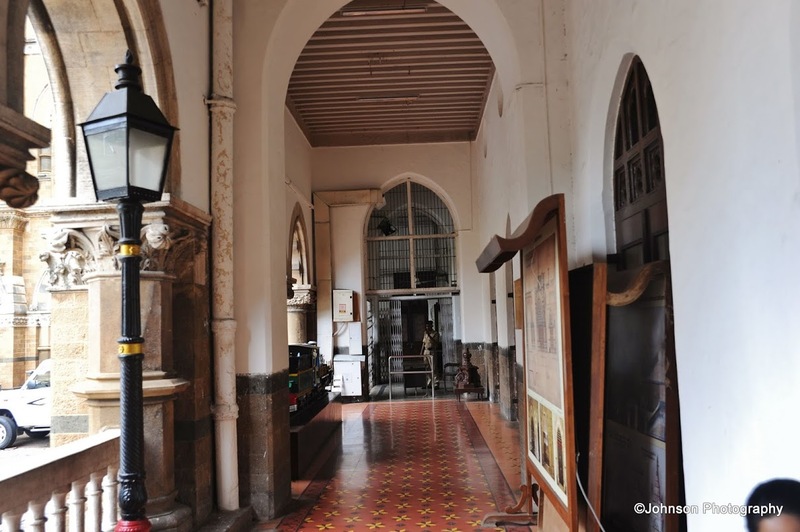 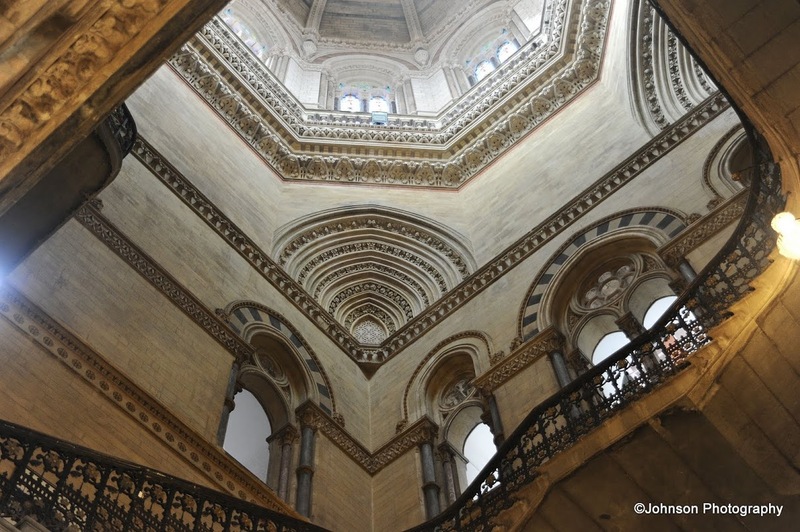 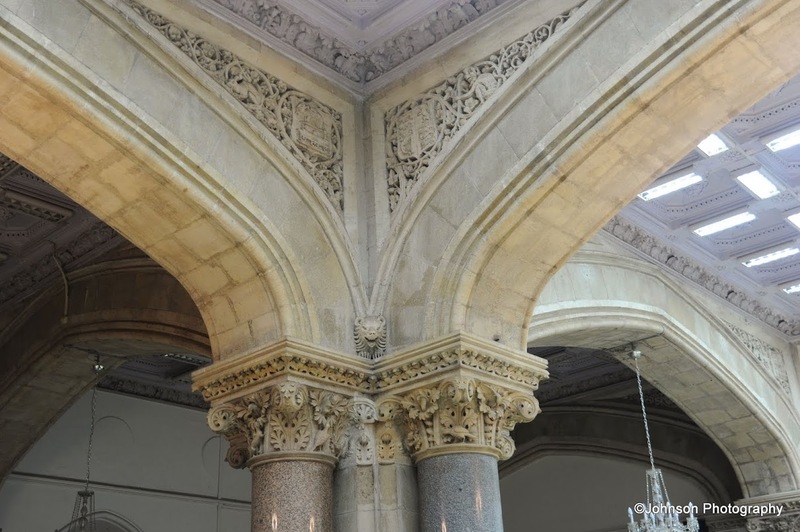 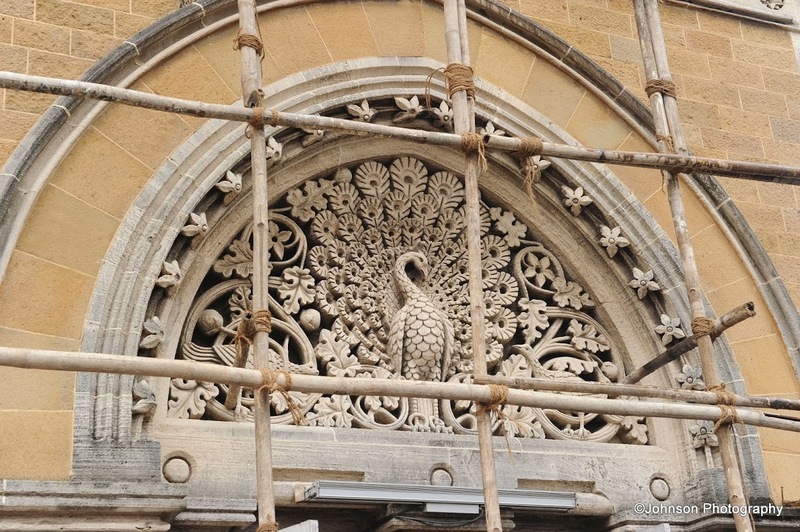 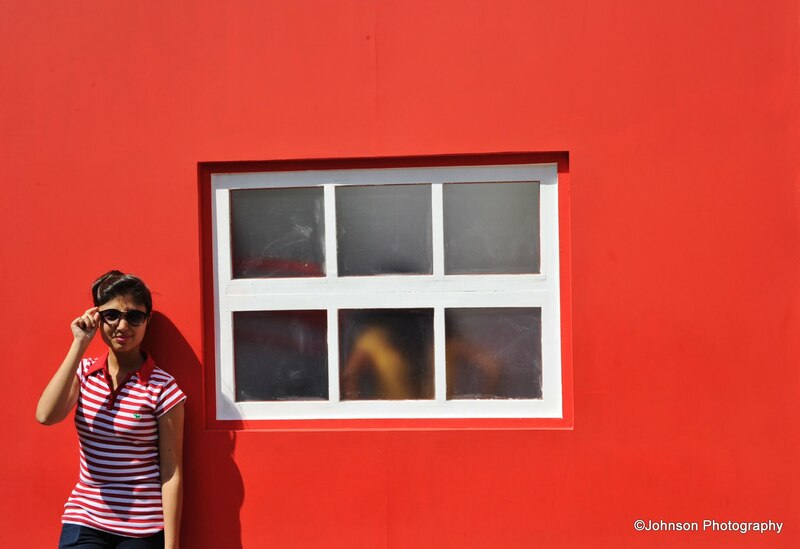 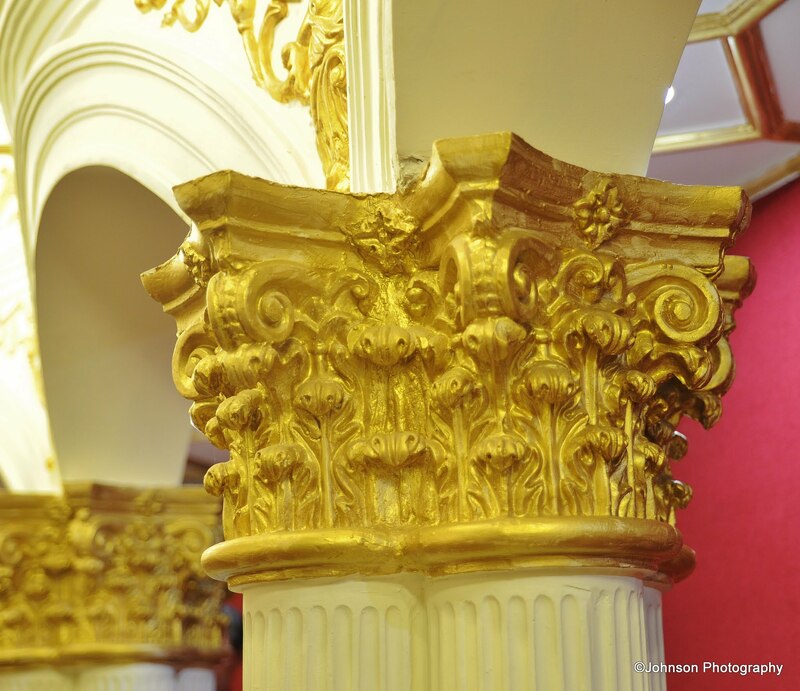 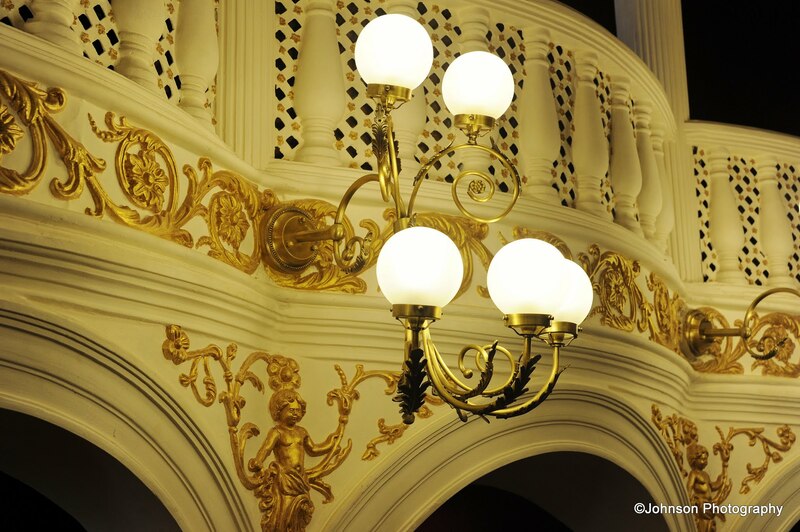 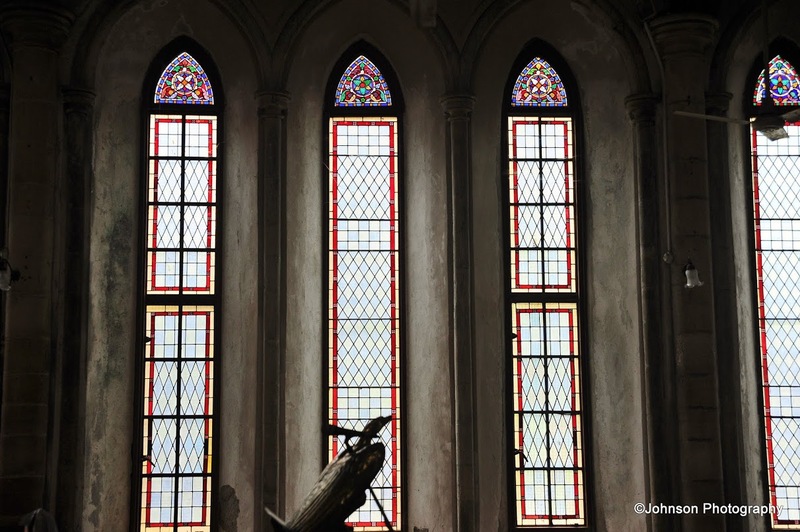 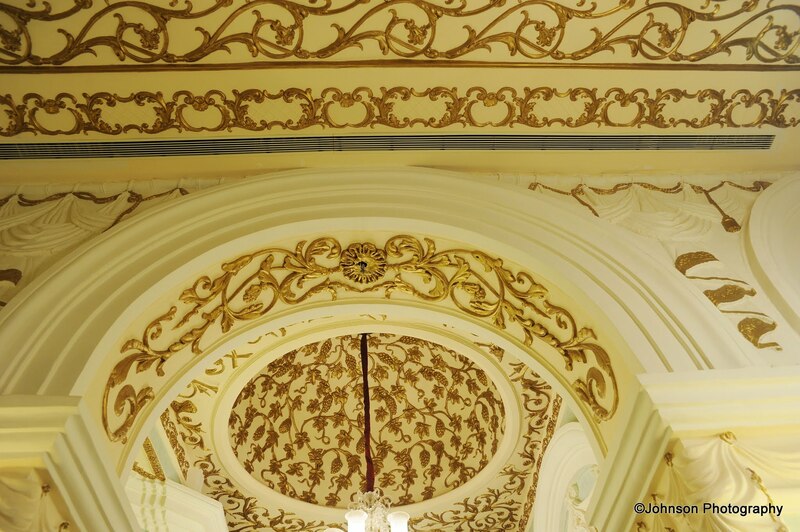 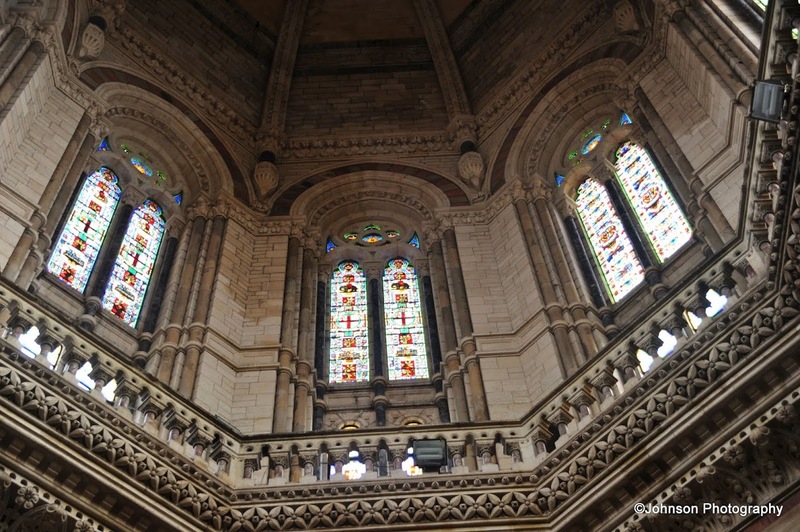 Heritage Tour Timings: 3PM to 5PM on Week days only. 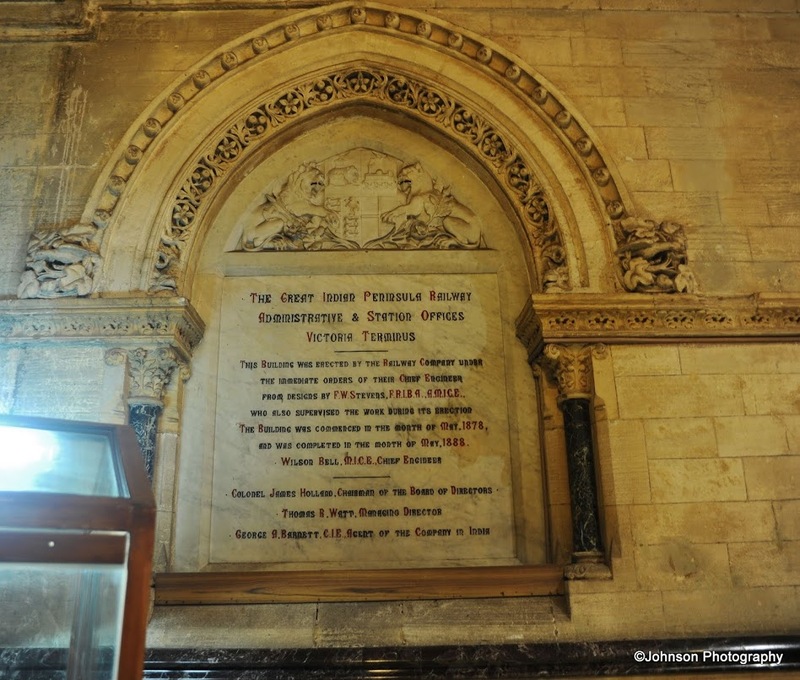 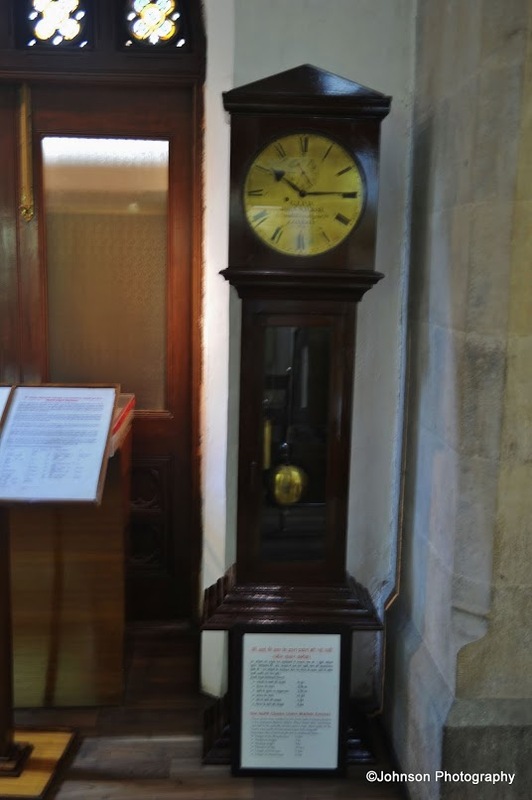 Just below the clock was a statue of Queen Victoria which was damaged by a lightning many decades ago and was never replaced. 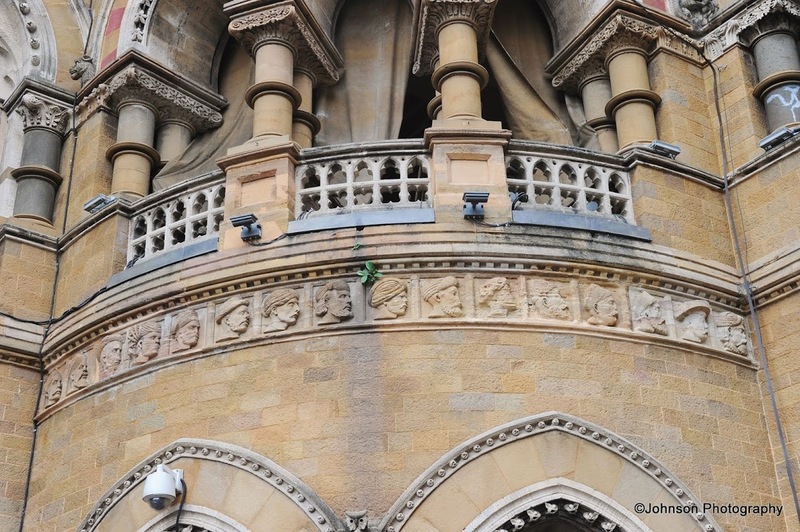 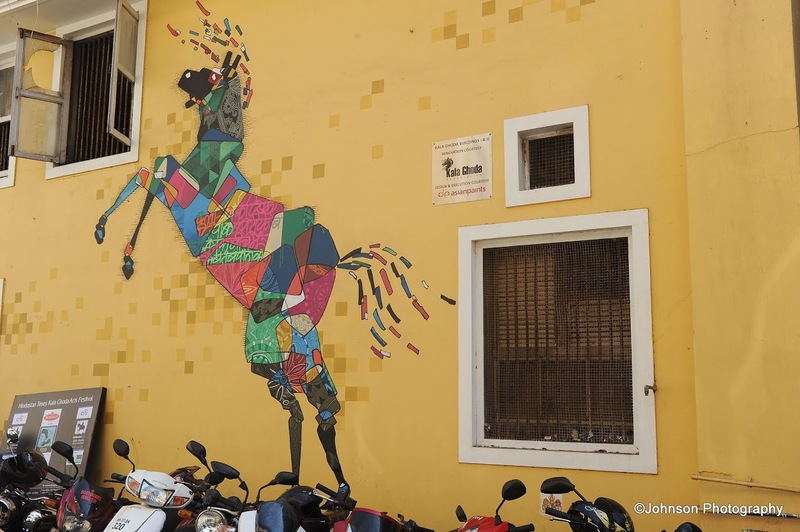 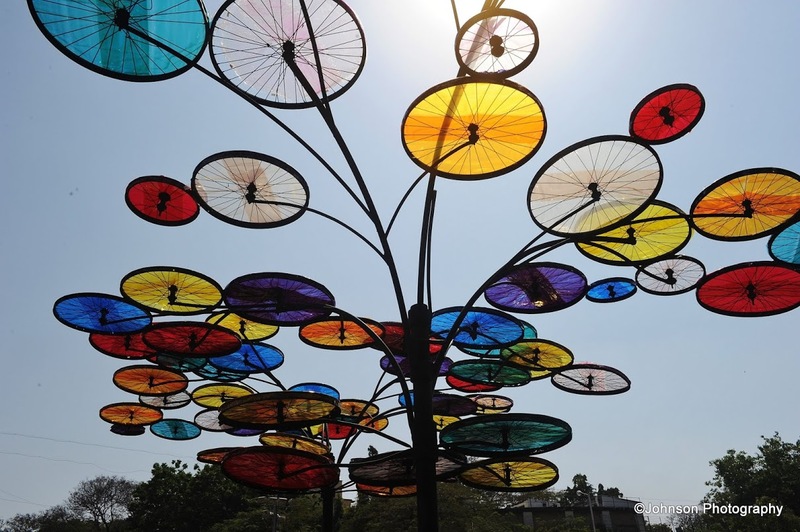 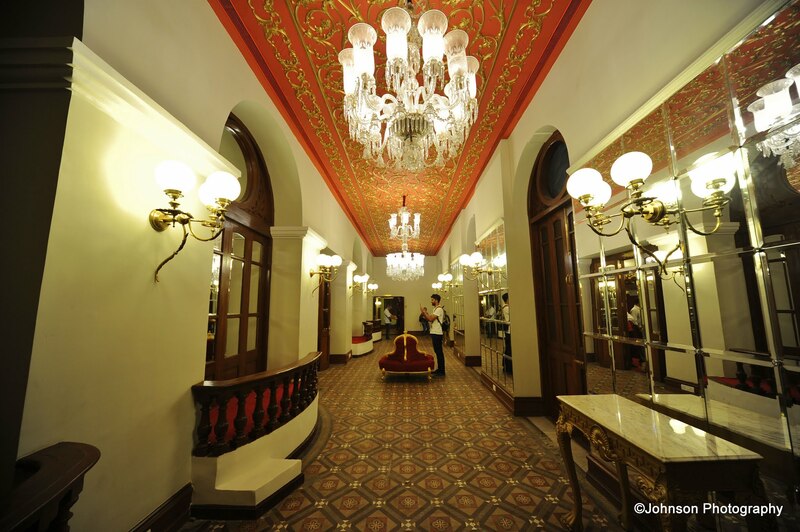 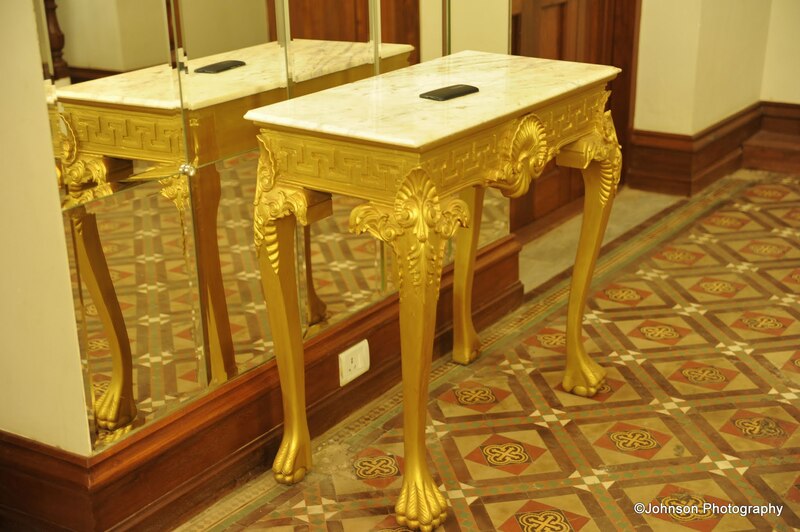 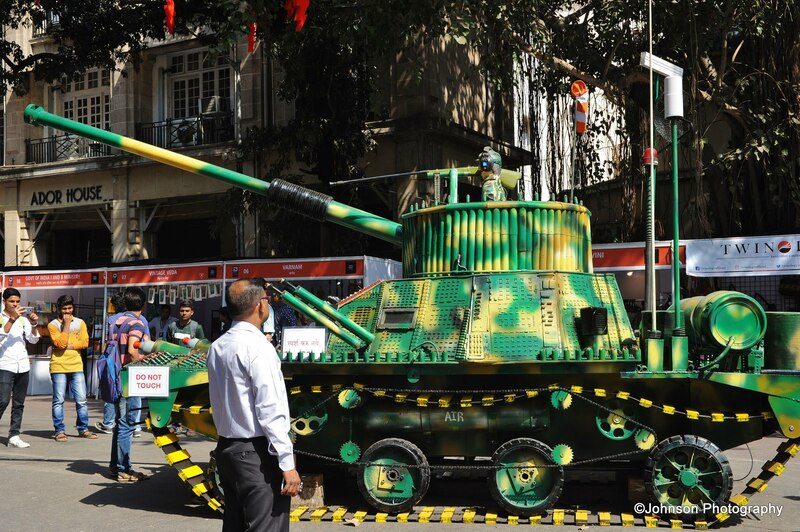 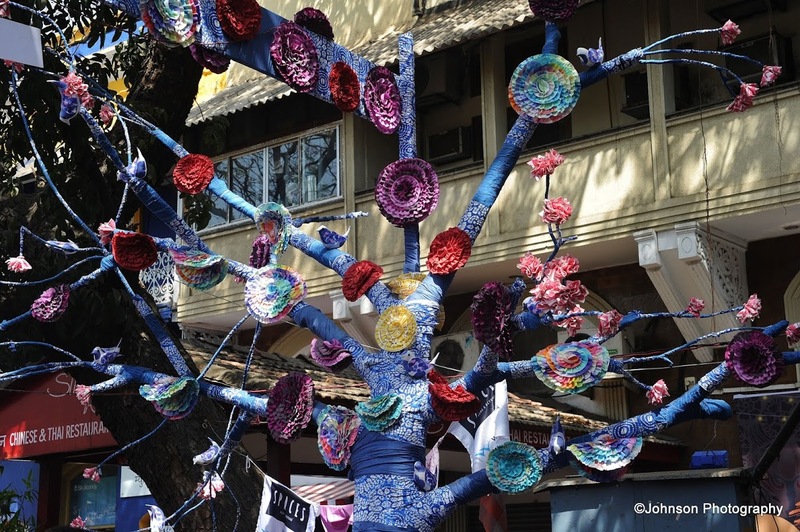 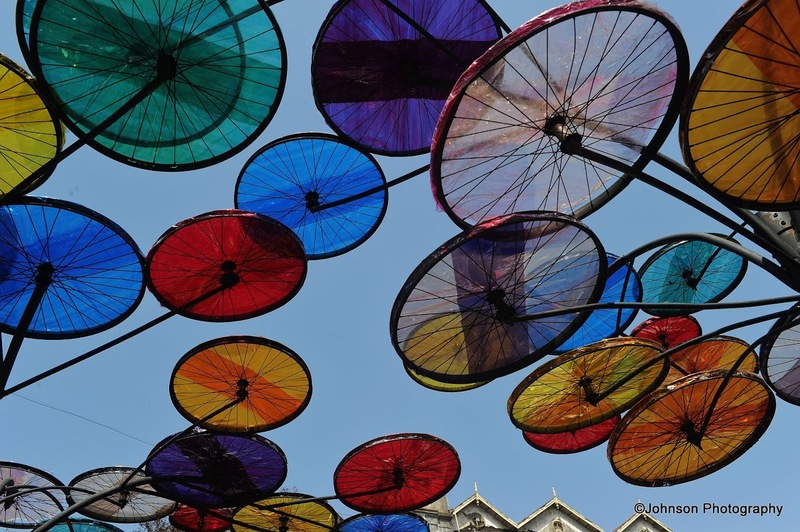 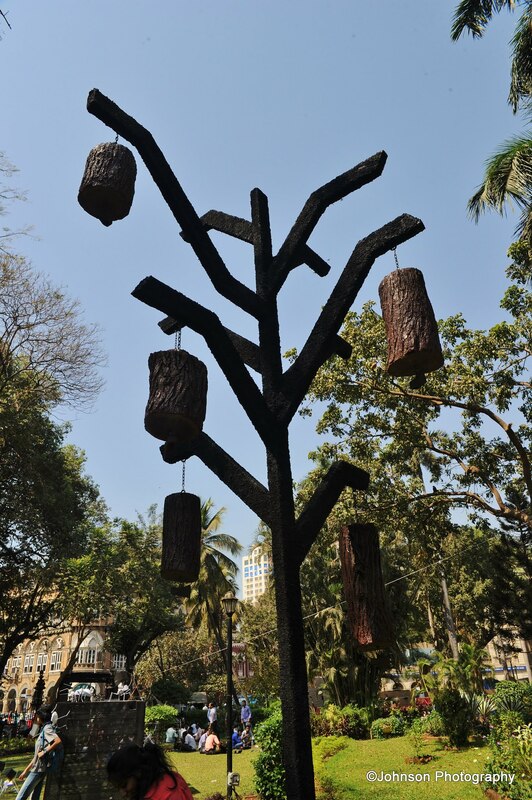 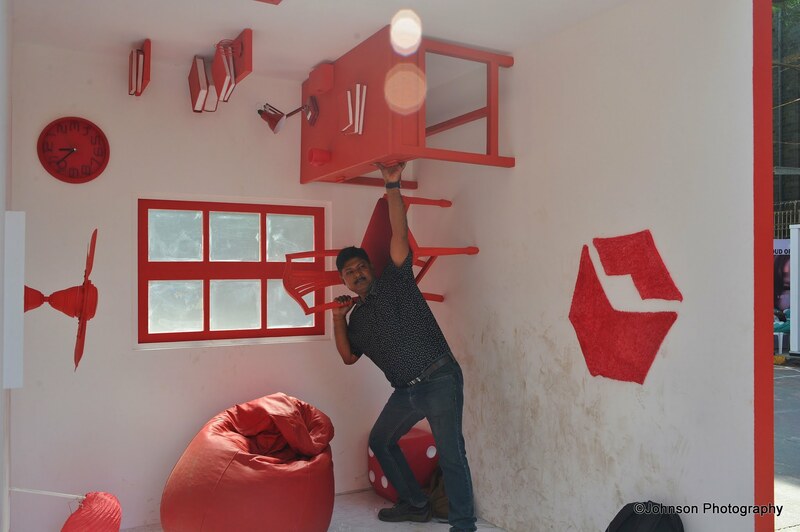 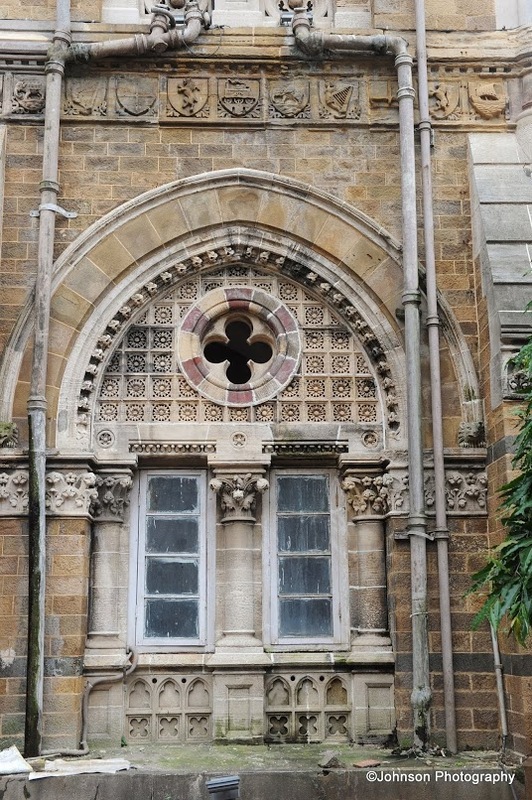 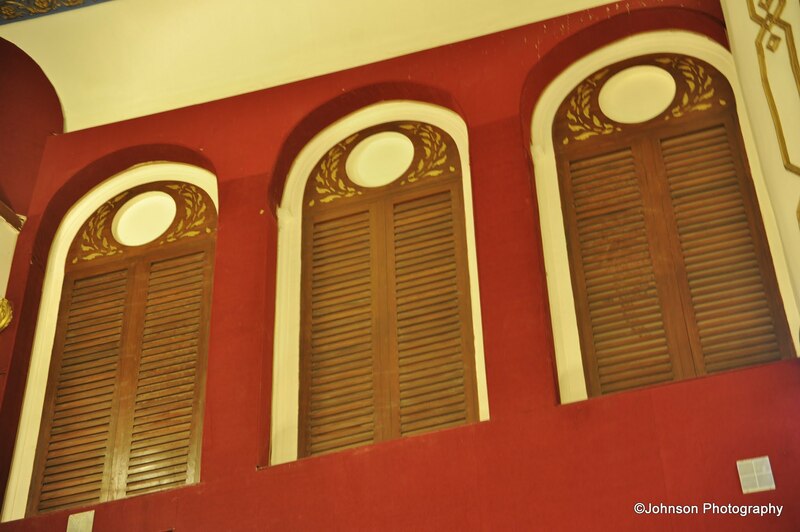 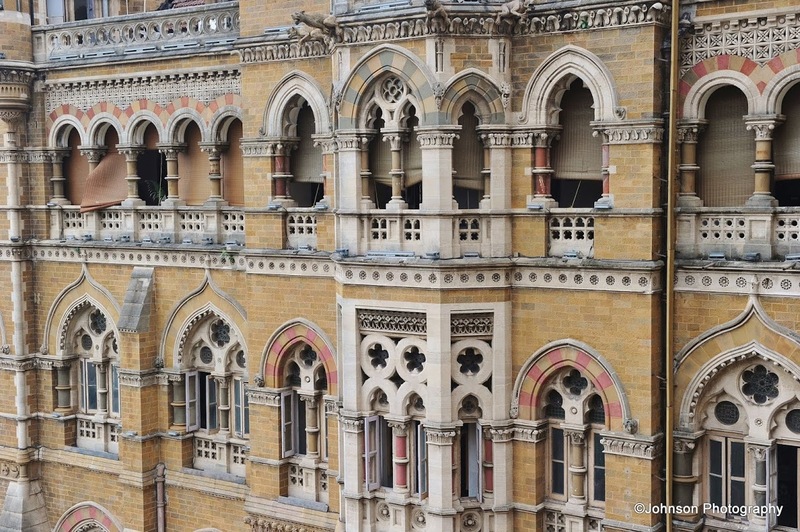 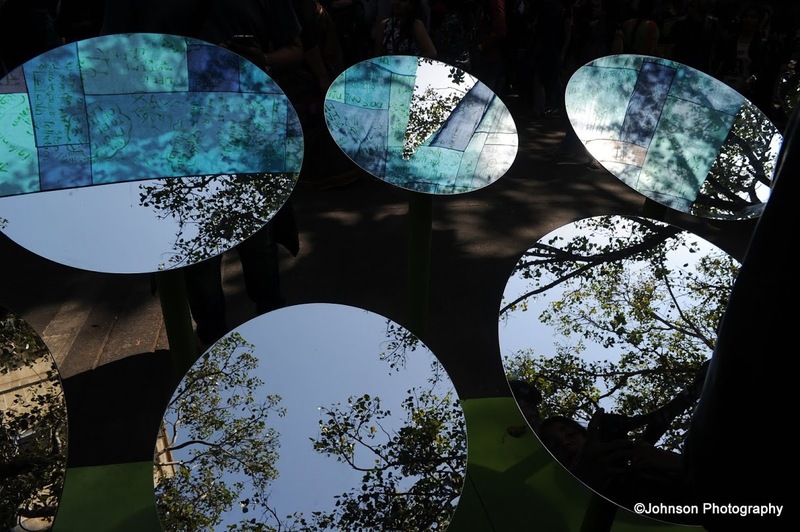 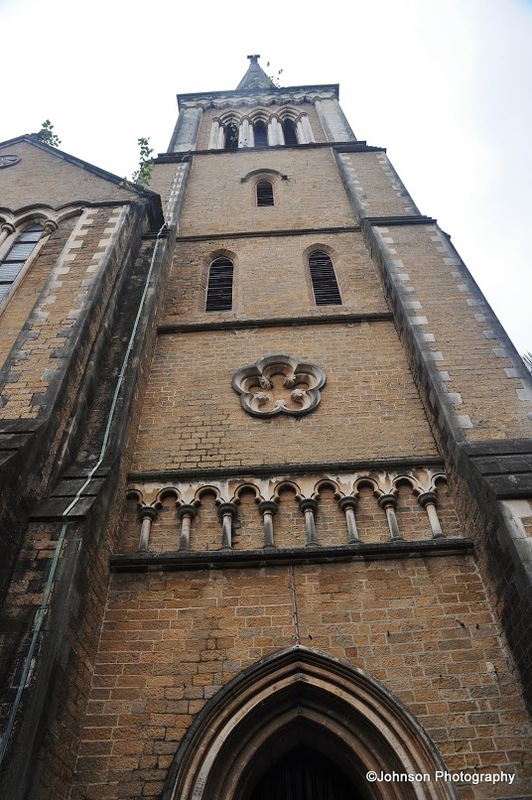 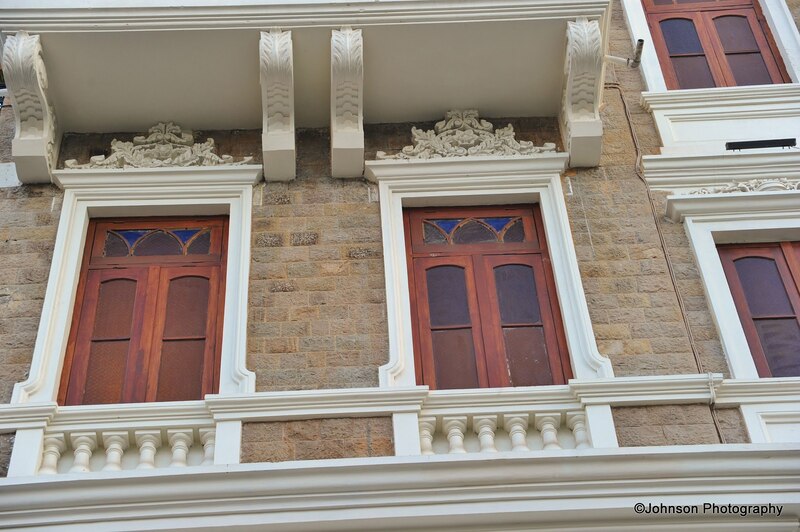 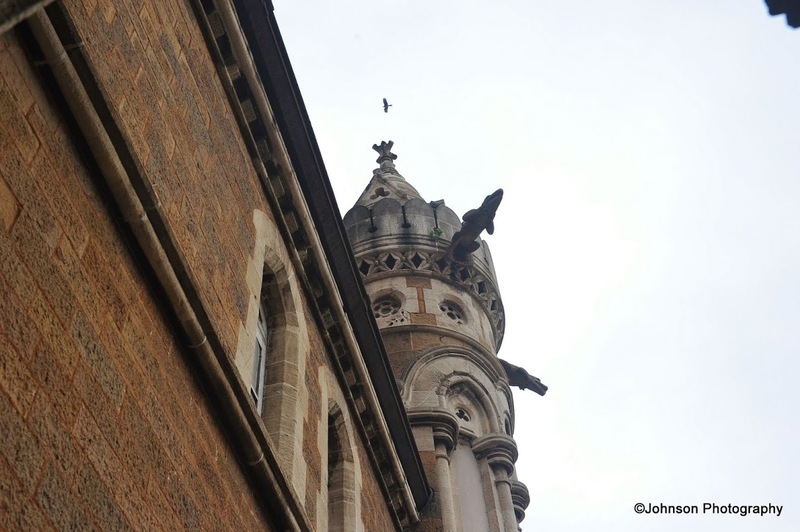 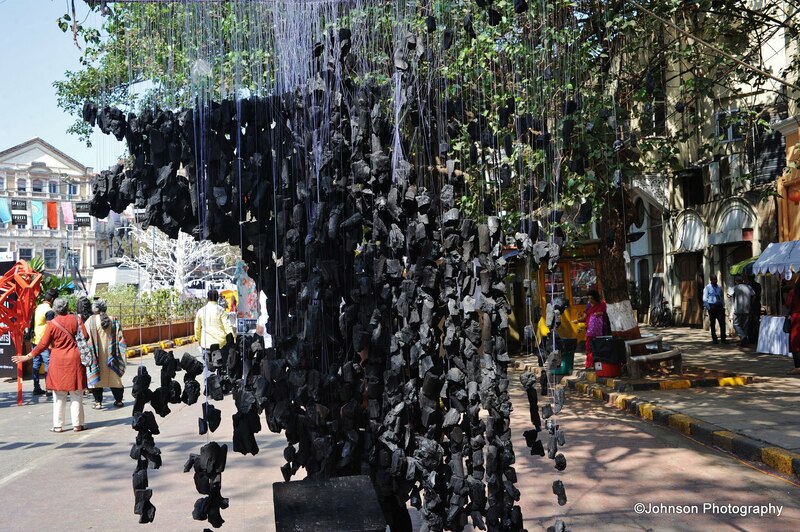 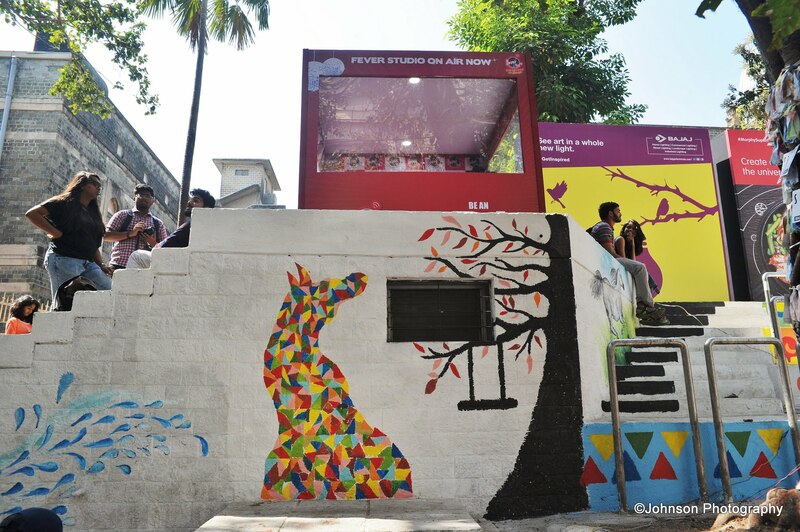 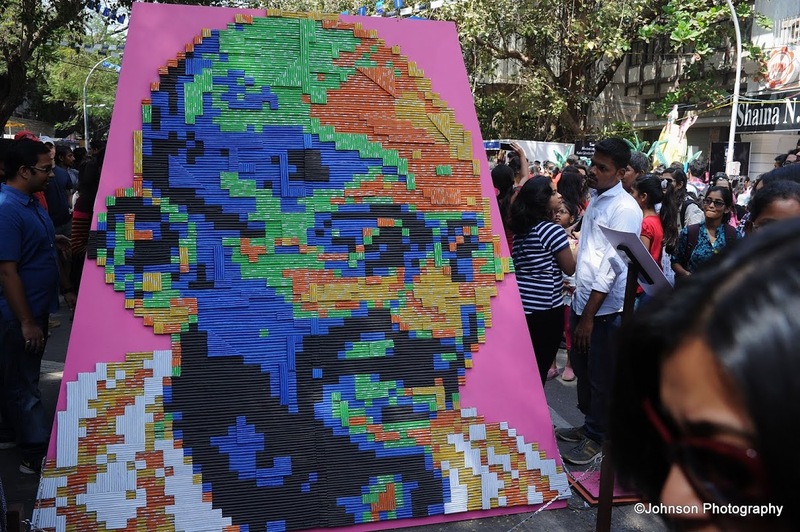 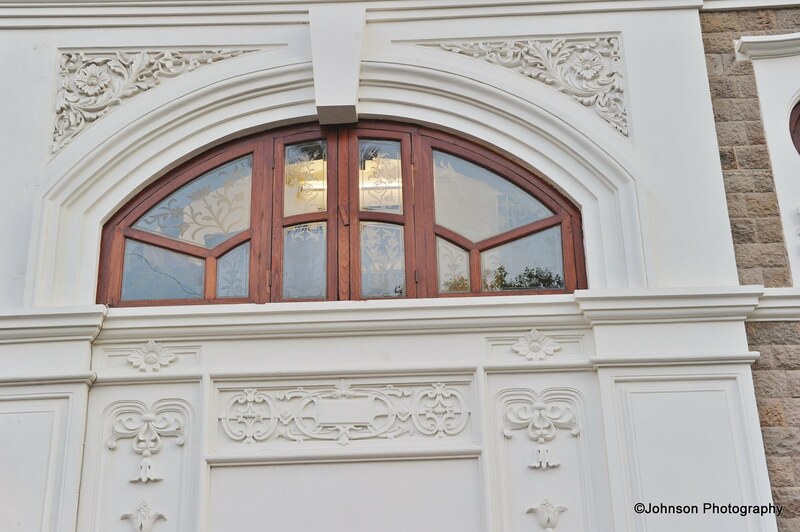 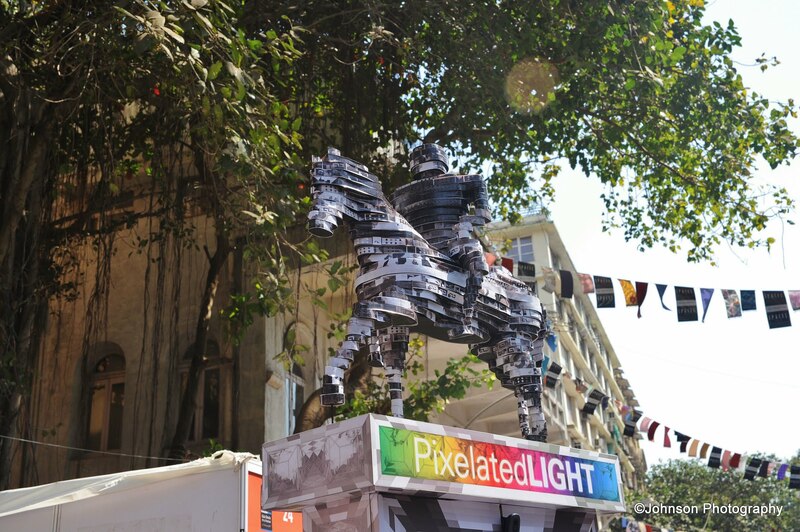 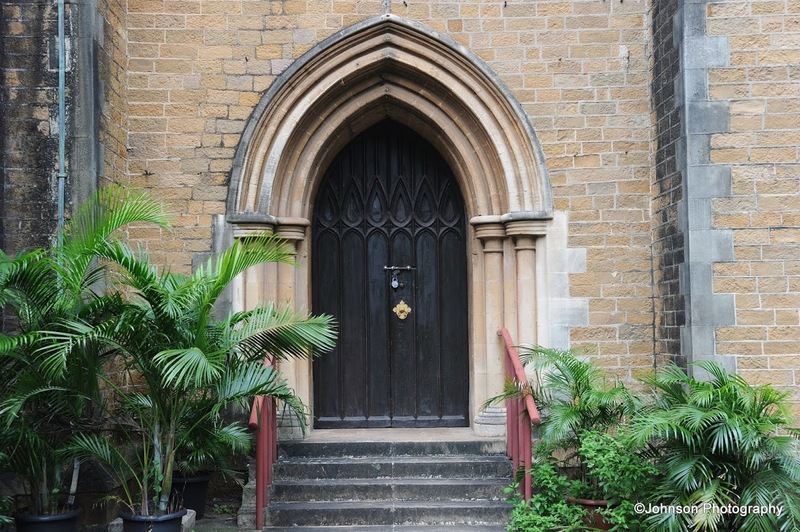 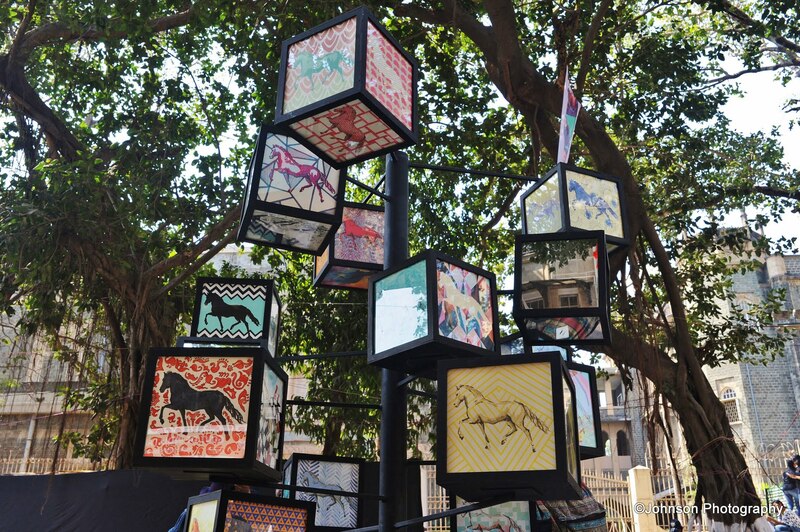 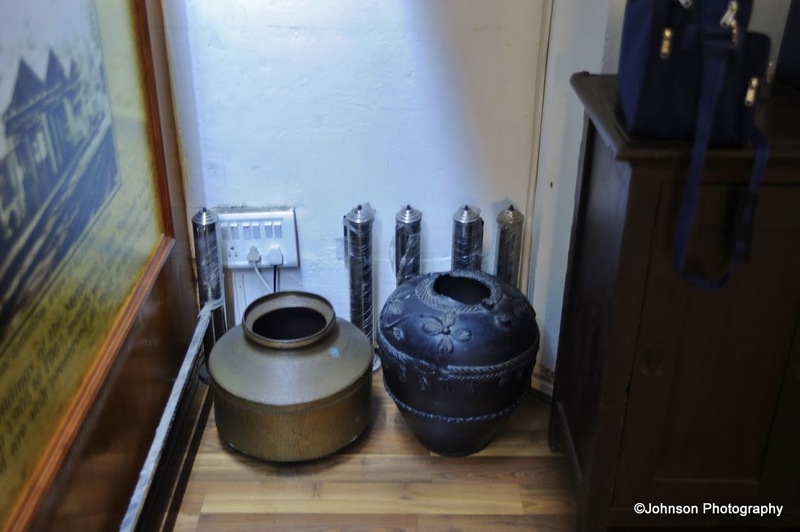 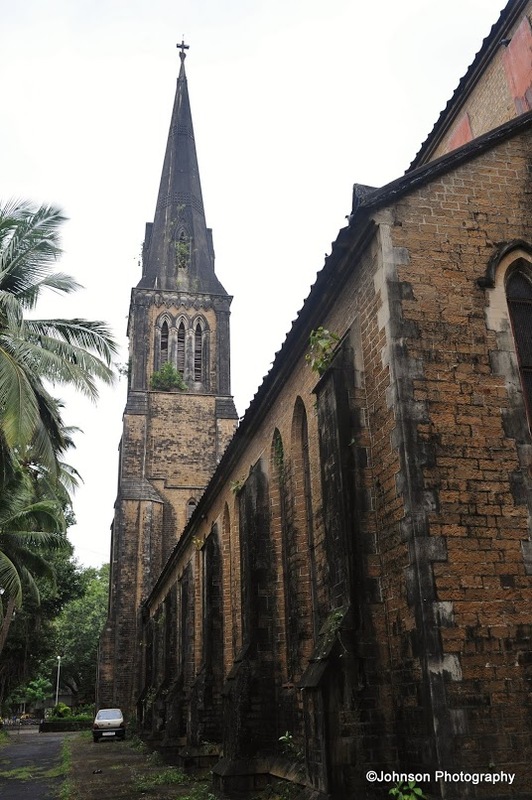 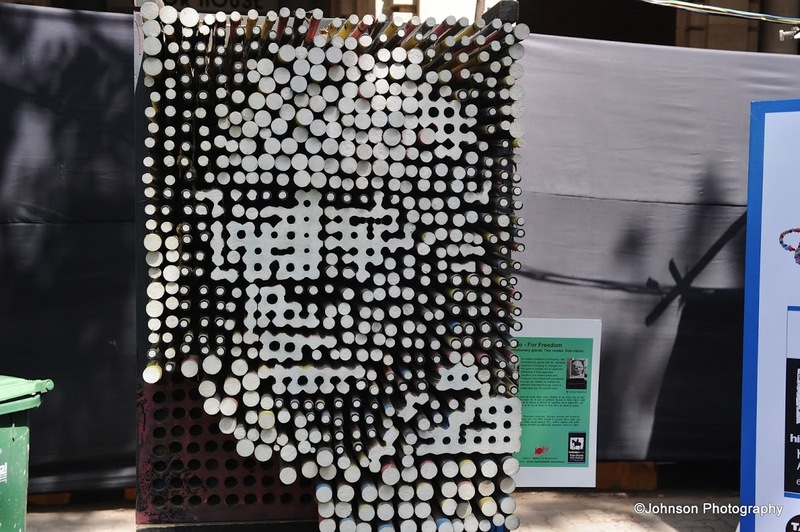 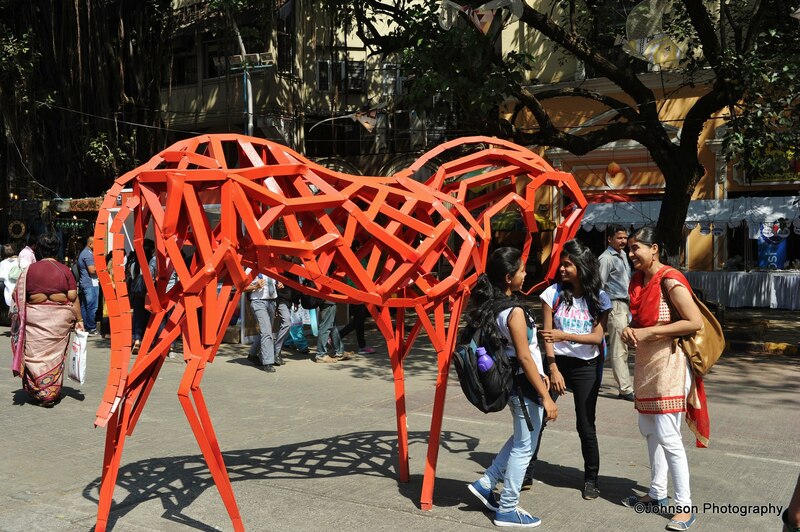 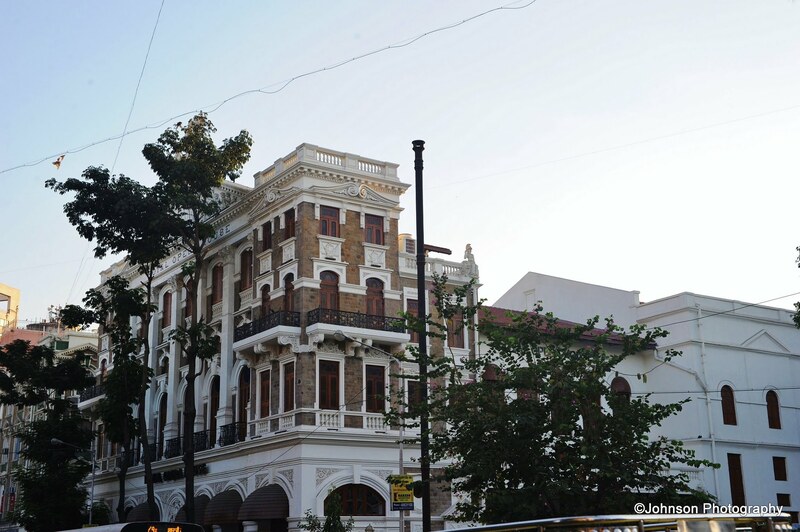 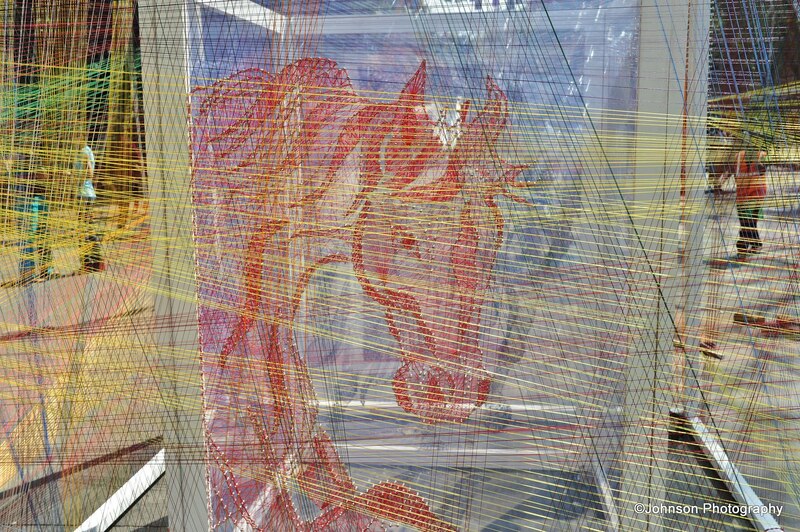 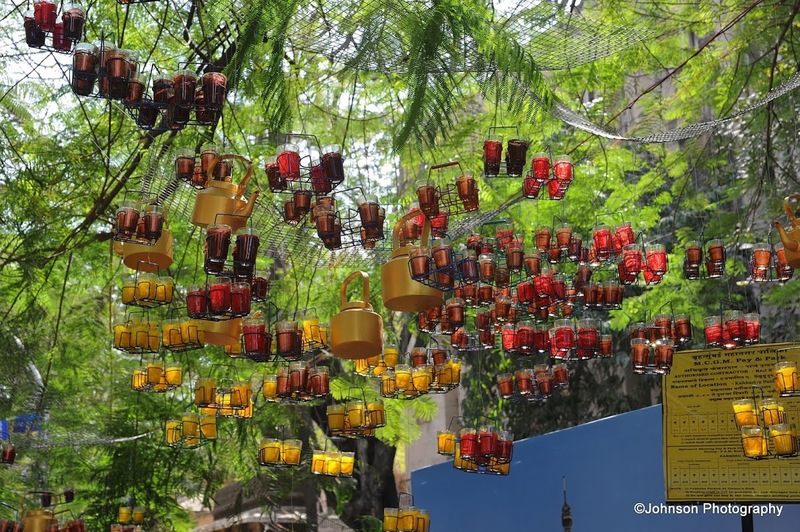 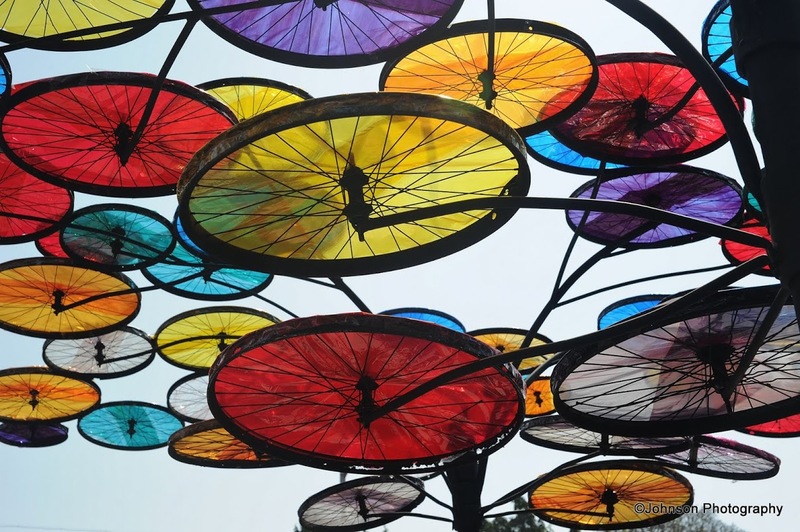 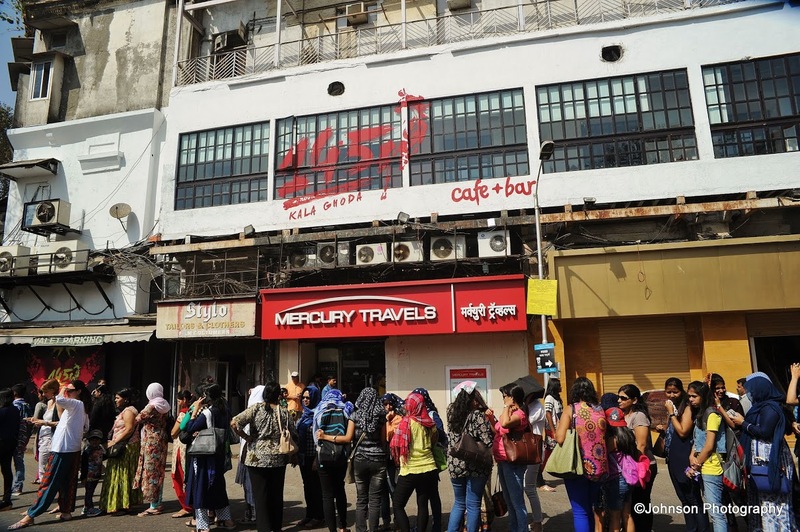 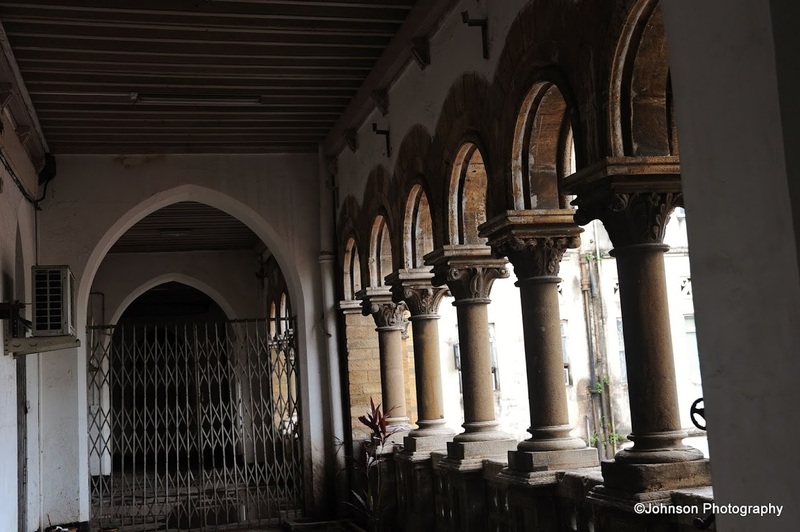 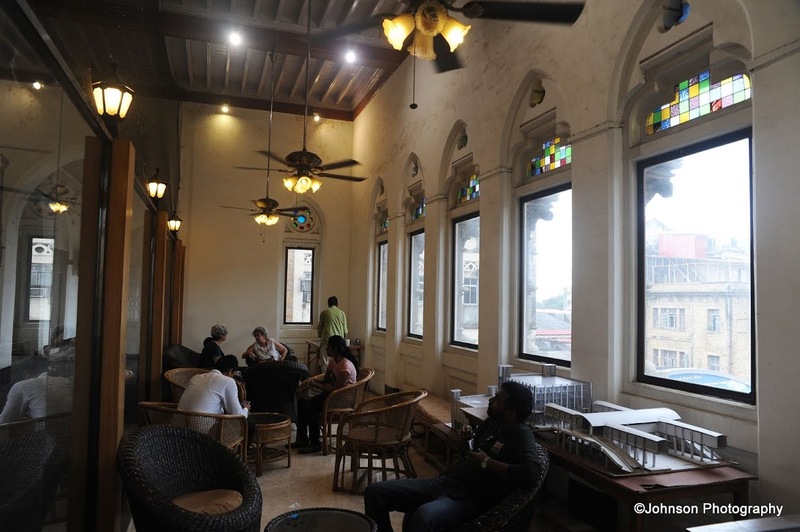 The Kala Ghoda precinct is Mumbai’s premier art district. 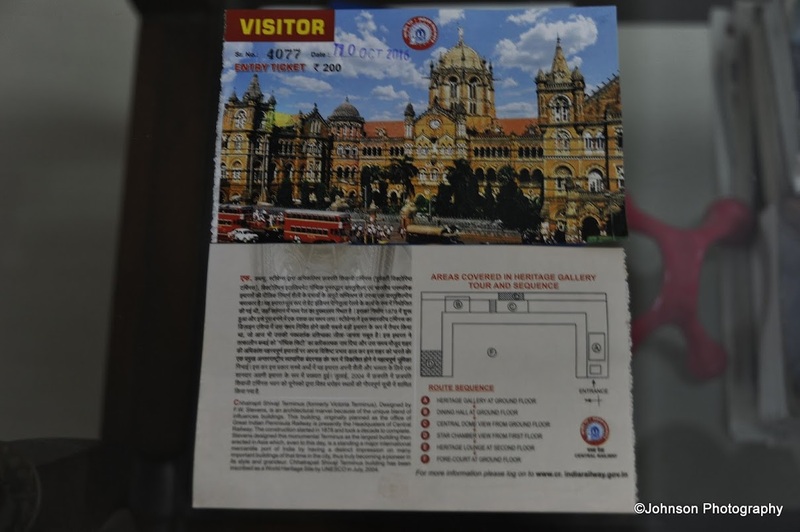 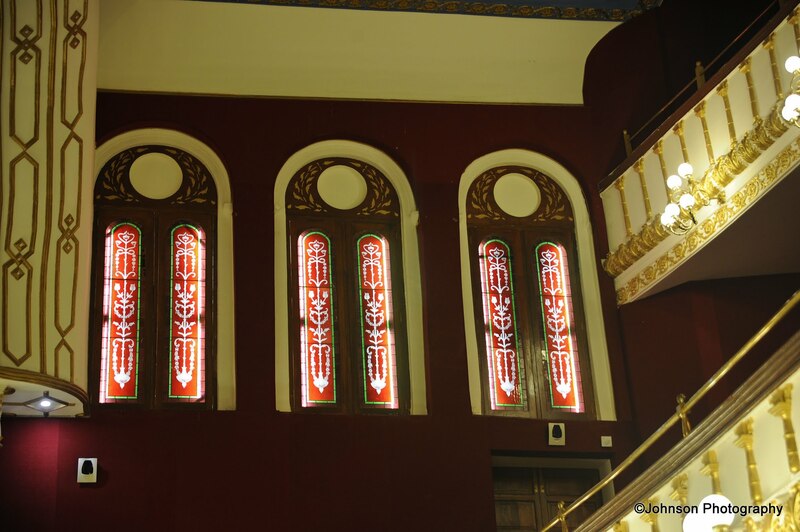 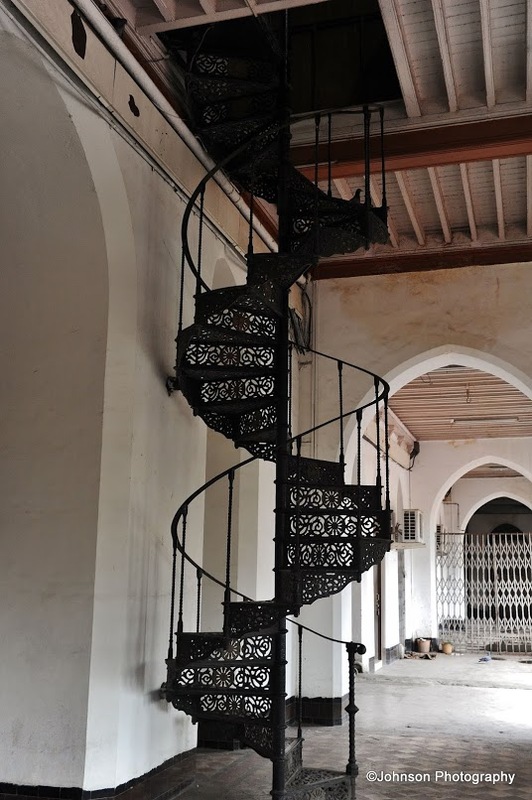 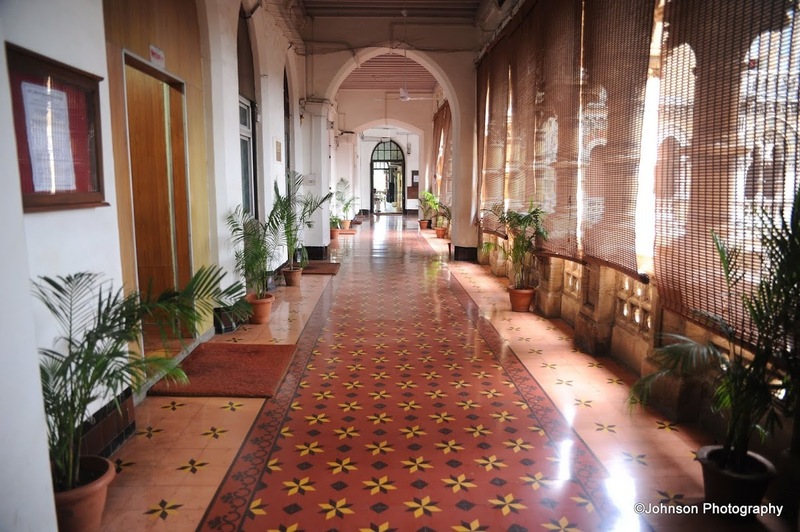 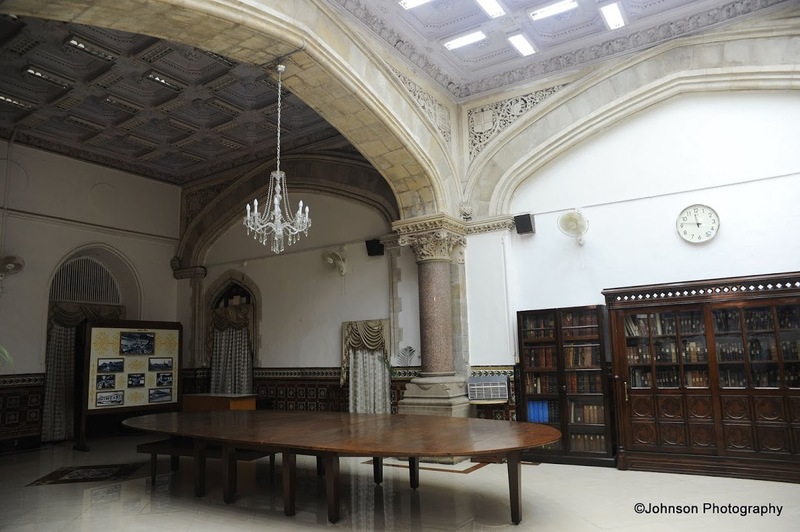 It has large number of city’s heritage buildings and art galleries like Jehangir Art Gallery, National Gallery of Modern Art etc. 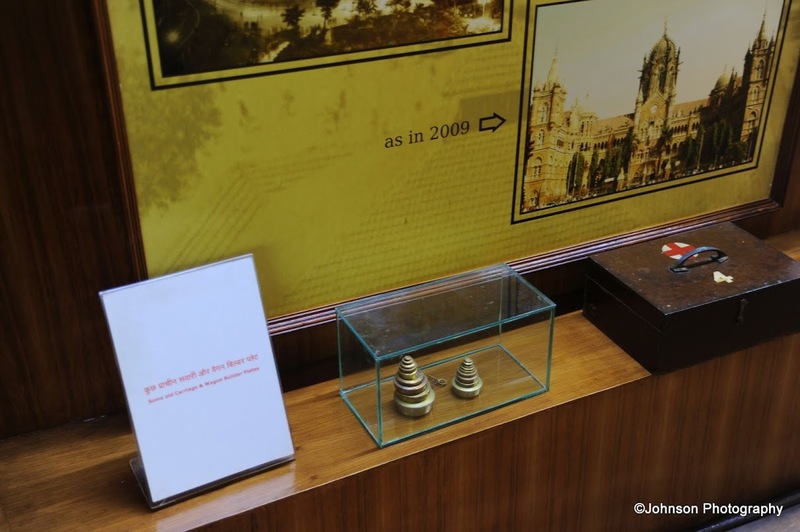 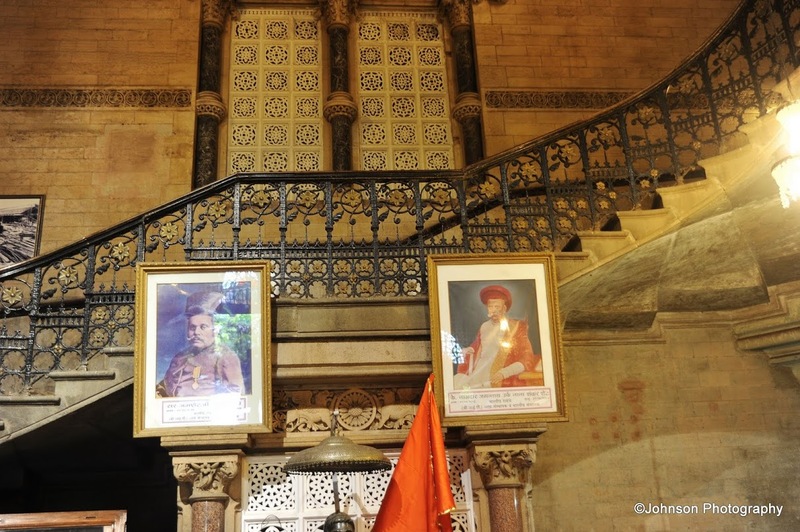 Also the Chhatrapati Shivaji Maharaj Vastu Sangrahalyaya is located in here. 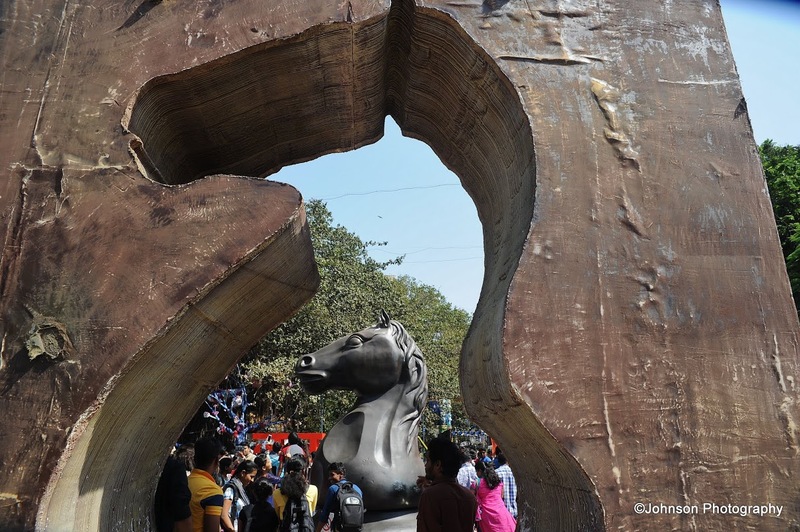 The area is sandwiched between the Lion Gate to the east, Regal Cinema to the south, Fountain to the north and Oval Maidan to the west. 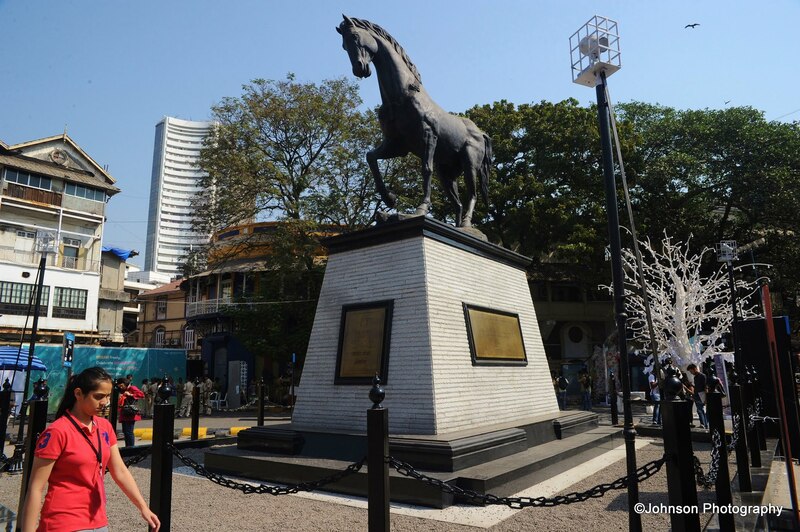 The name Kala Ghoda means Black Horse, a reference to the presence of a black equestrian statue of king Edward VII placed in the area. 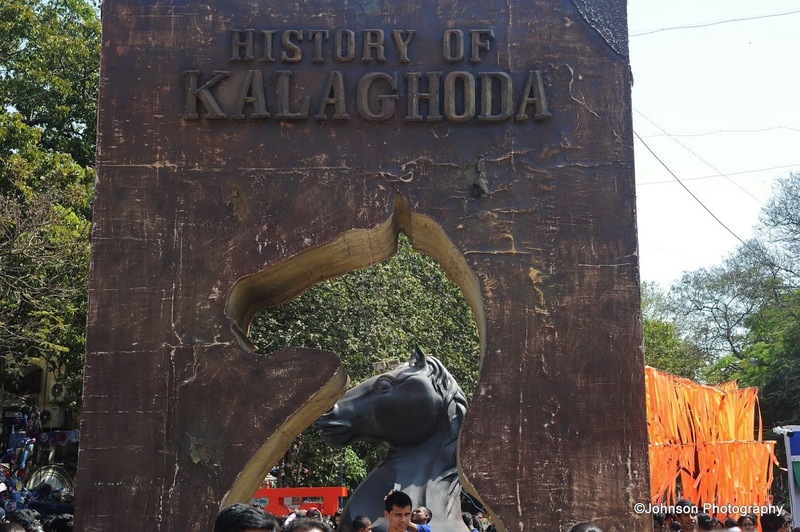 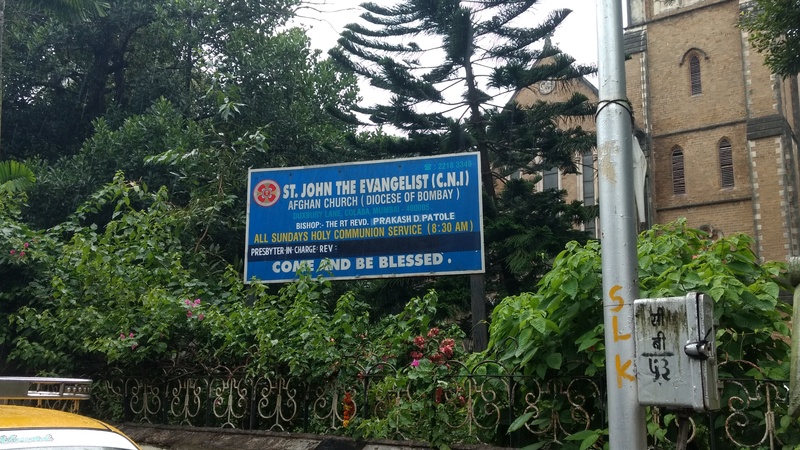 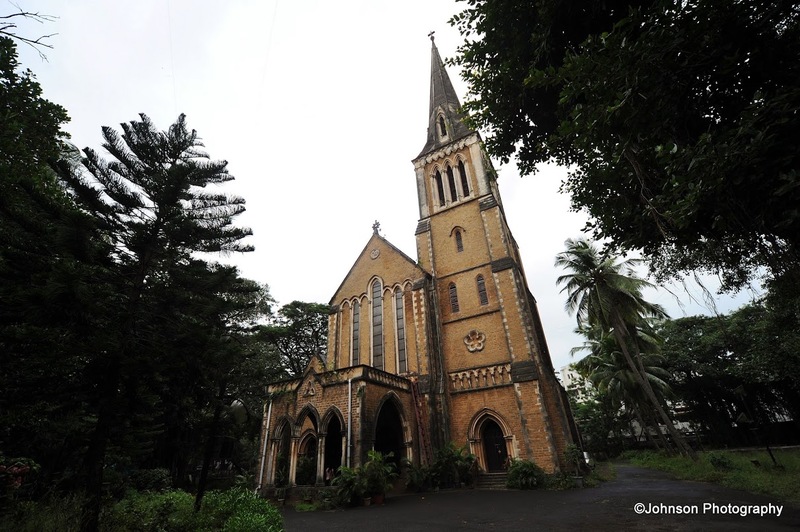 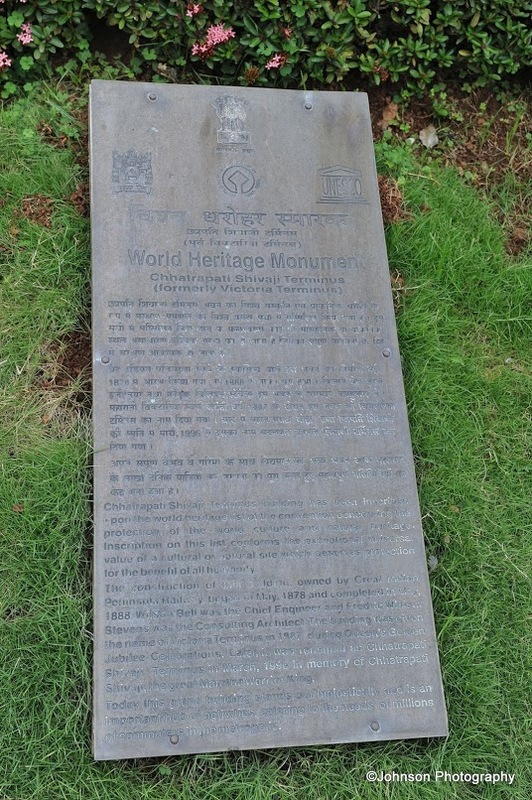 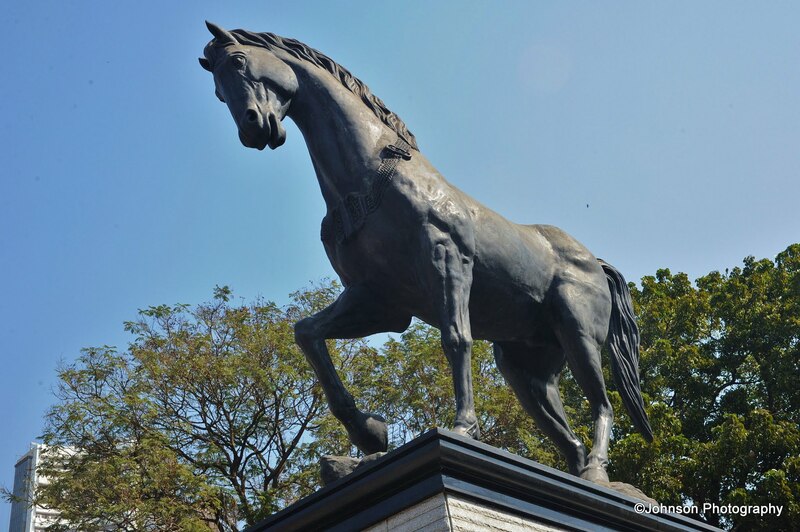 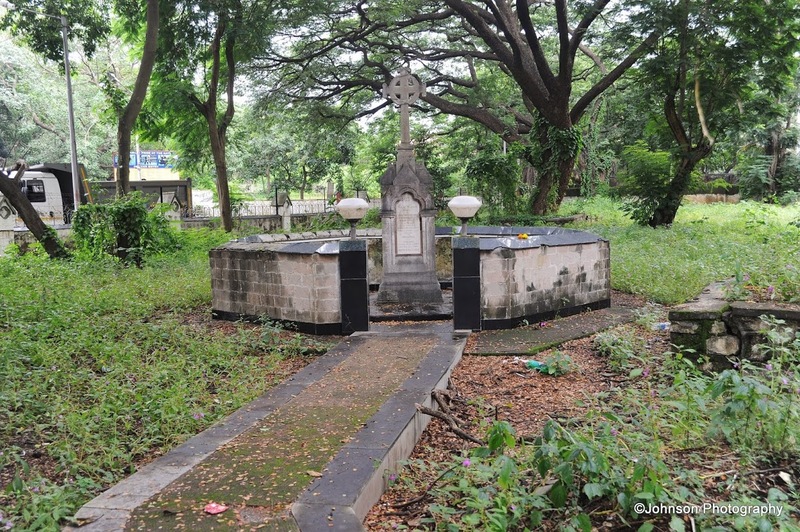 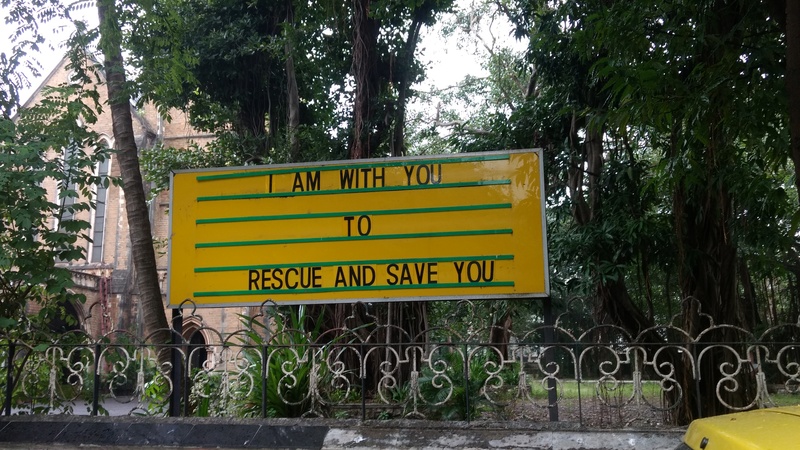 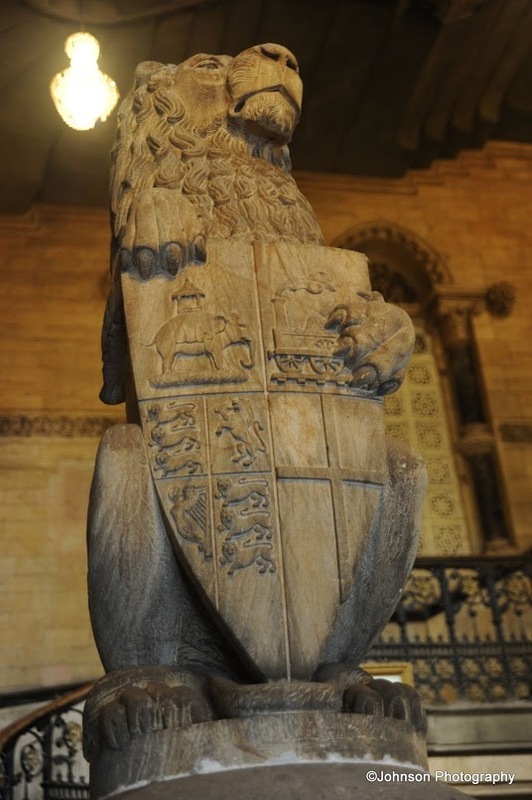 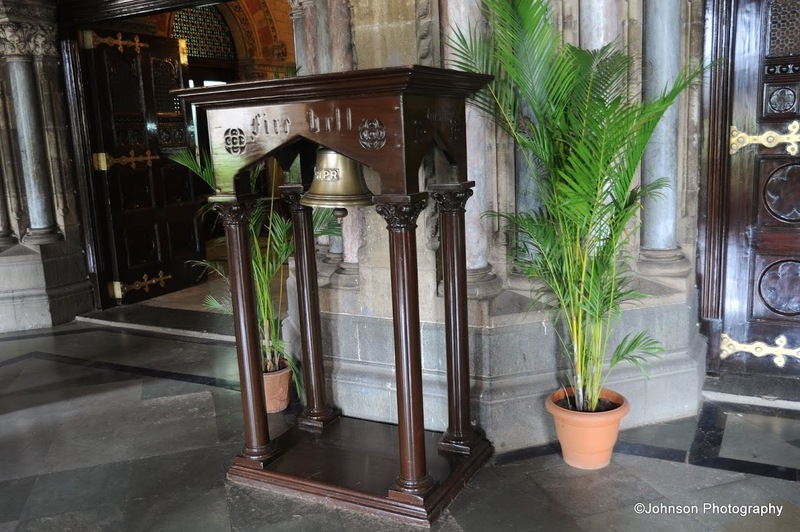 Even though the statue was removed from the precinct in 1965 and subsequently placed inside the Byculla Zoo, the area was continued to be called as Kala Ghoda (but alas without the black horse). 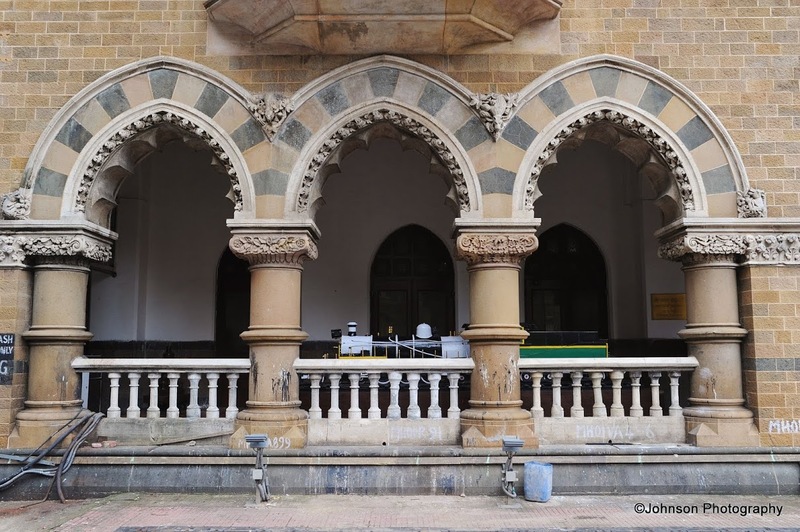 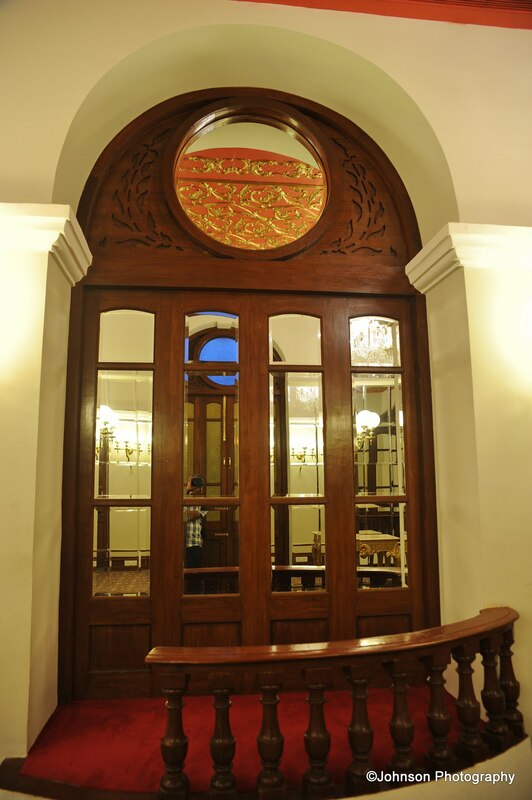 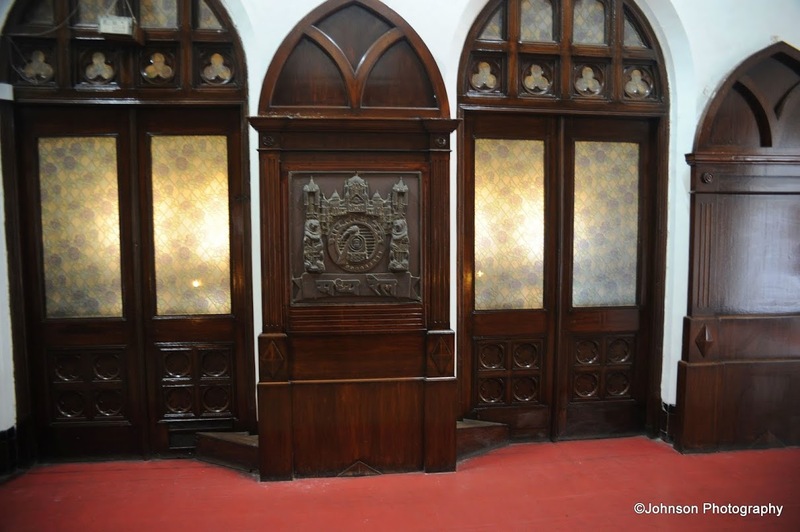 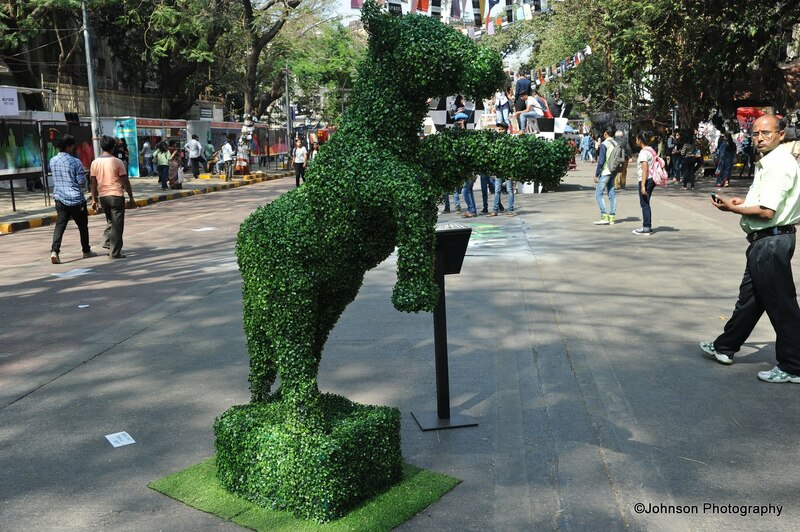 The Kala Ghoda Association was formed on 30th October 1998 with the object of maintaining and preserving this art district of south Mumbai. 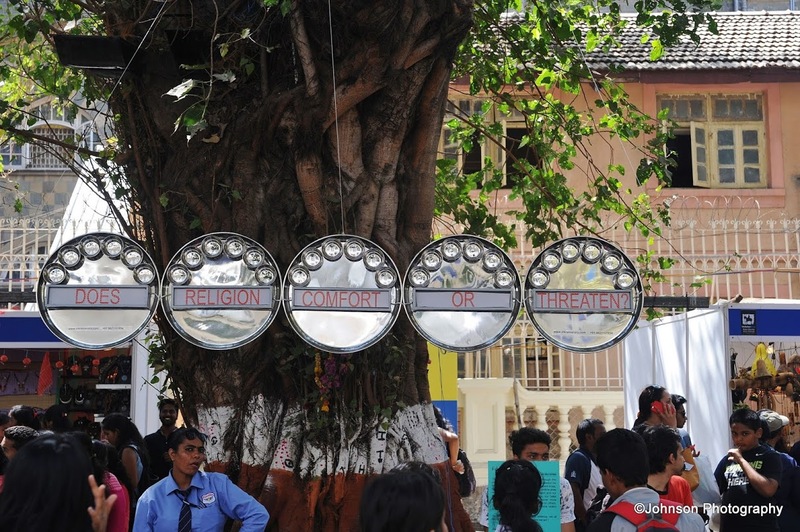 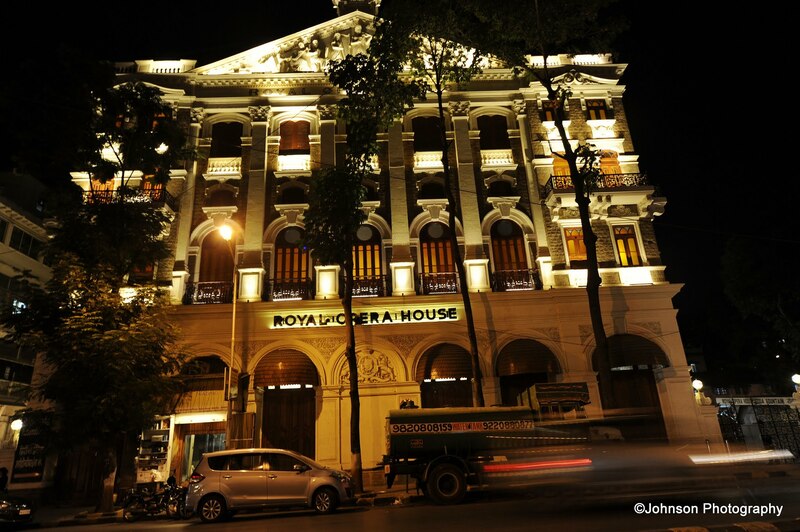 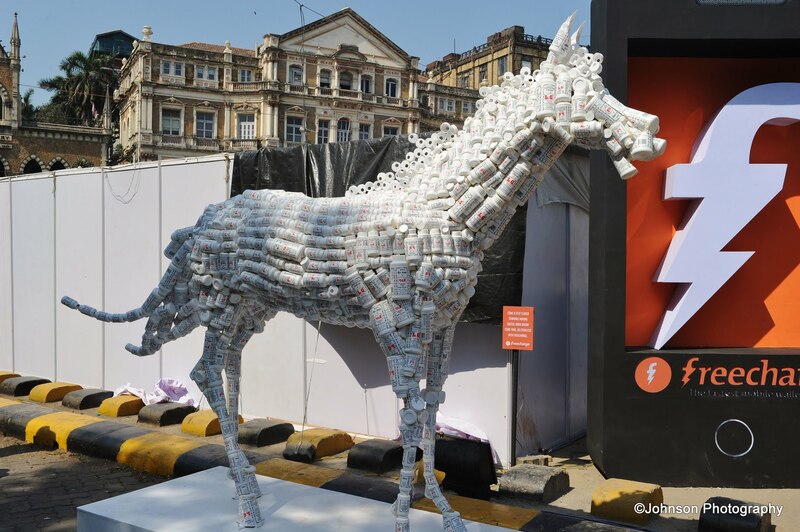 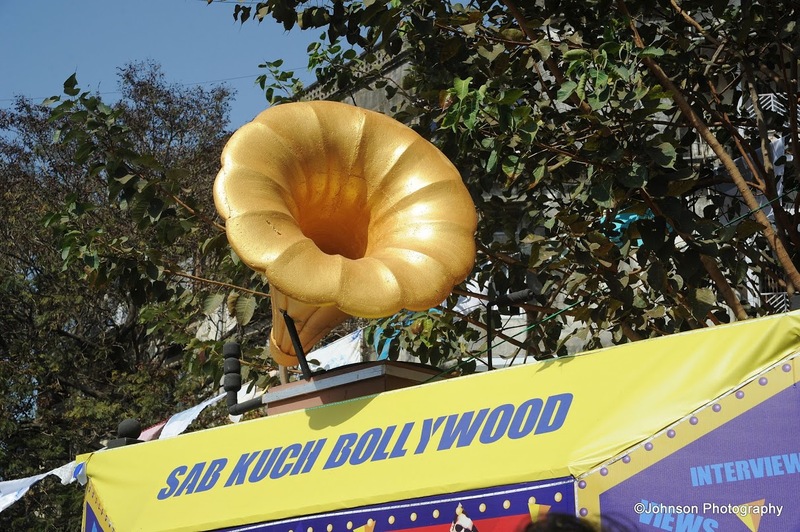 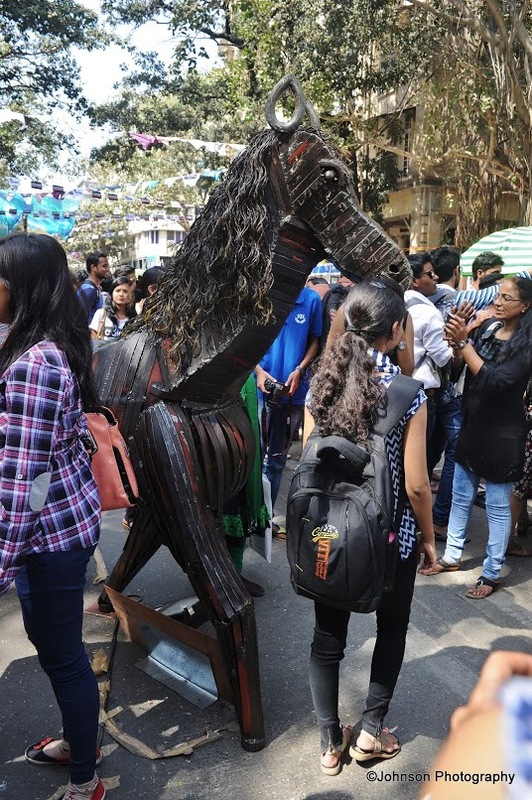 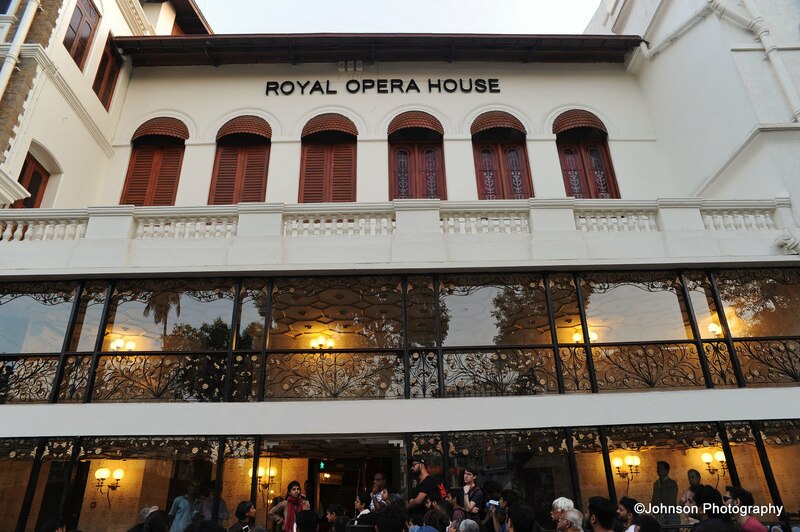 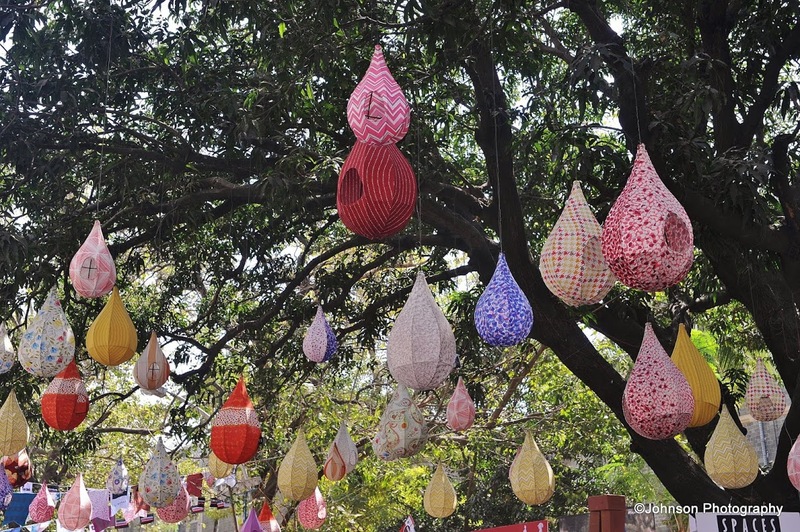 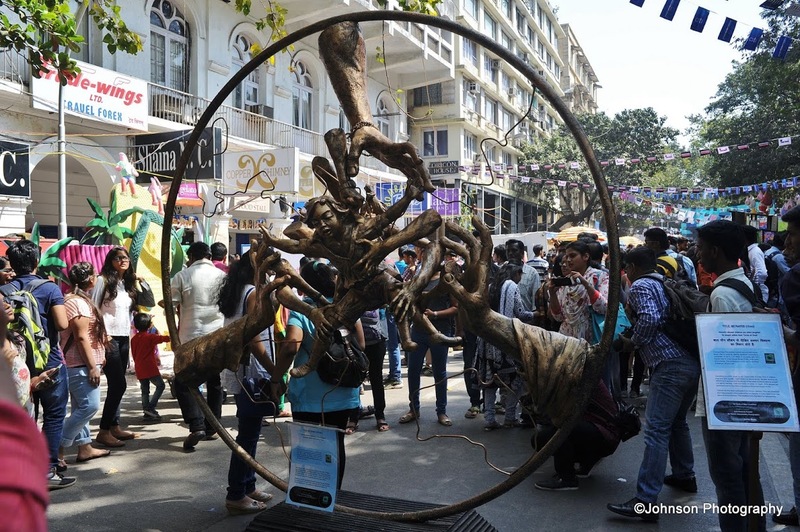 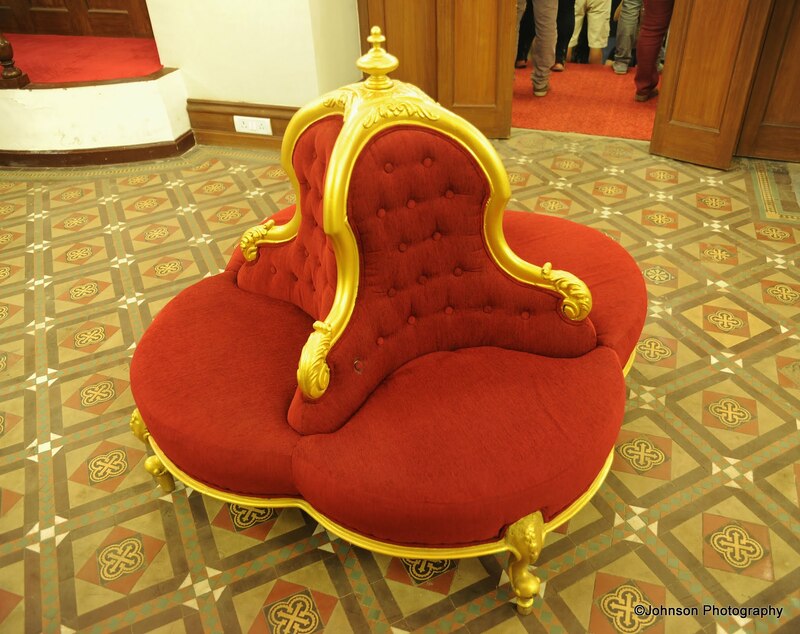 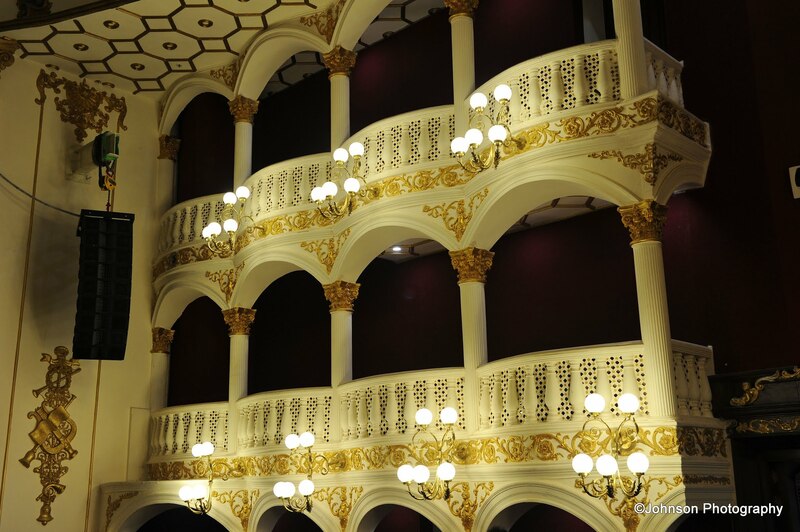 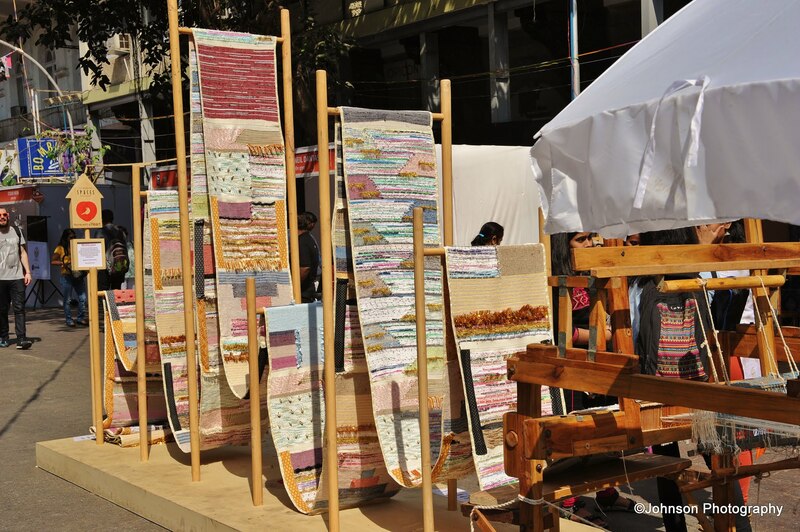 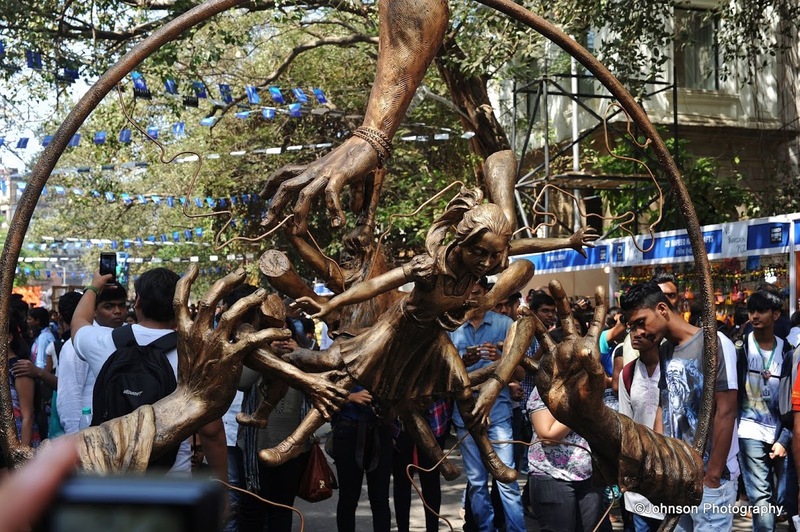 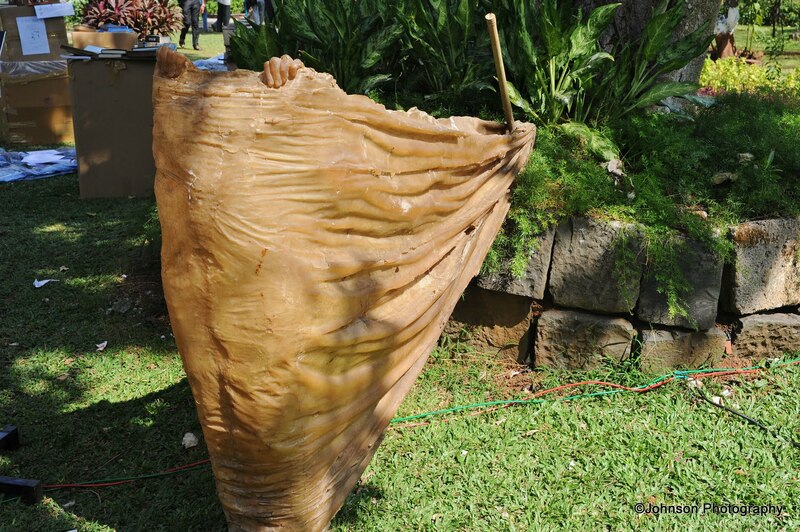 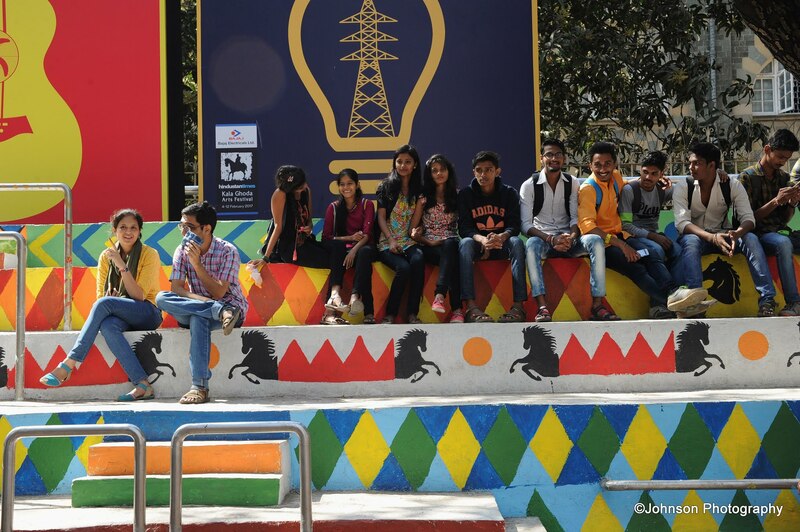 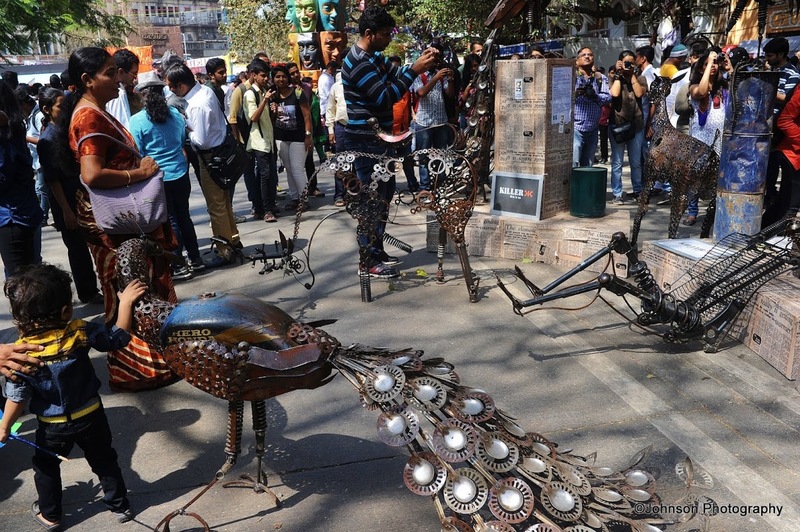 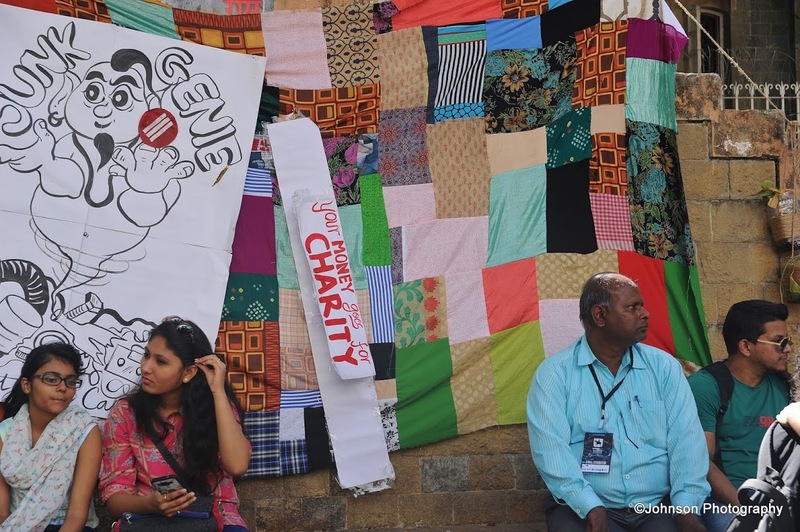 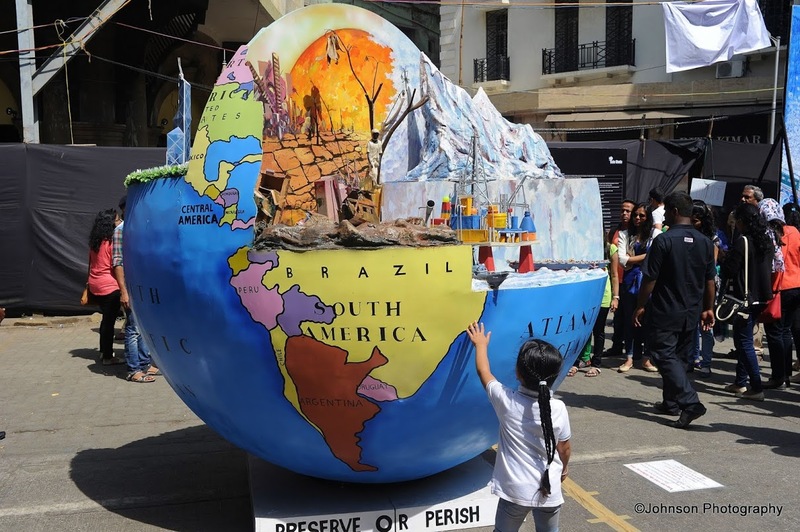 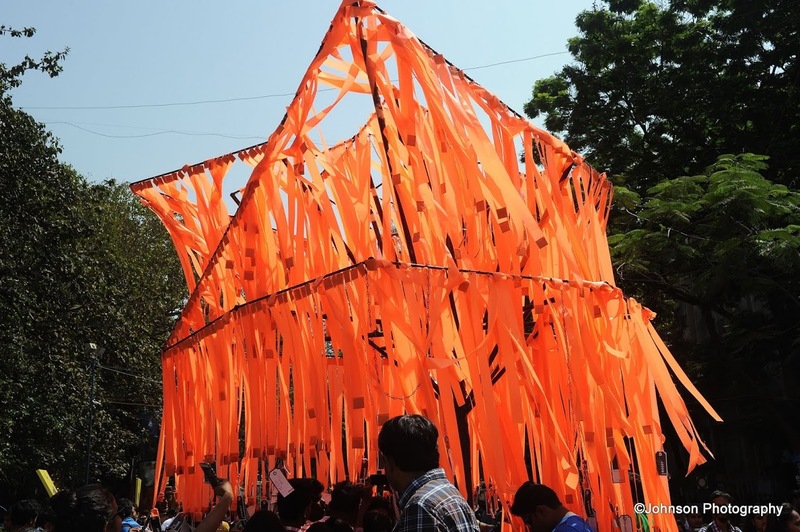 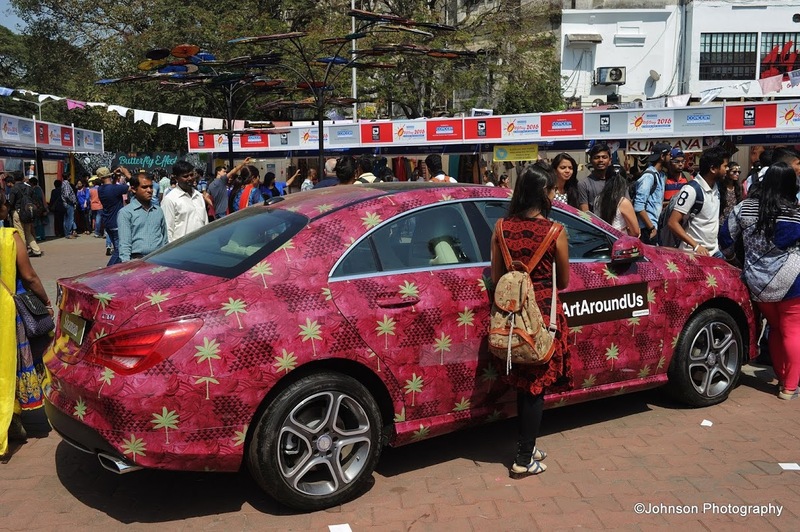 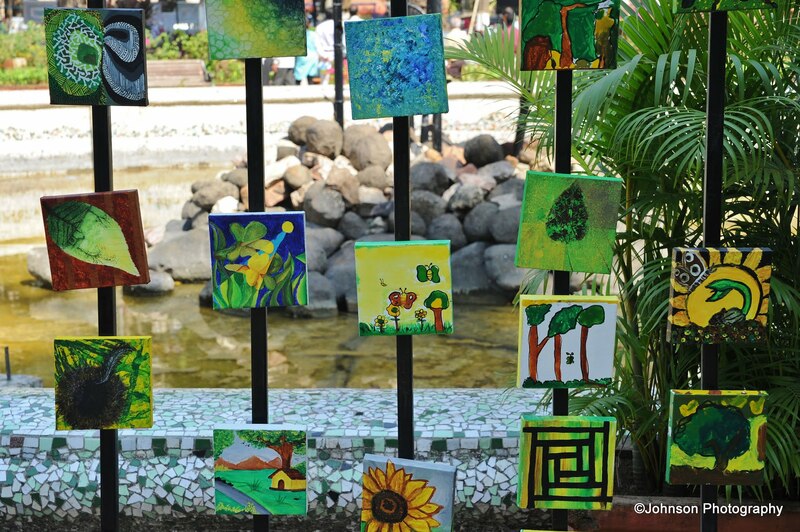 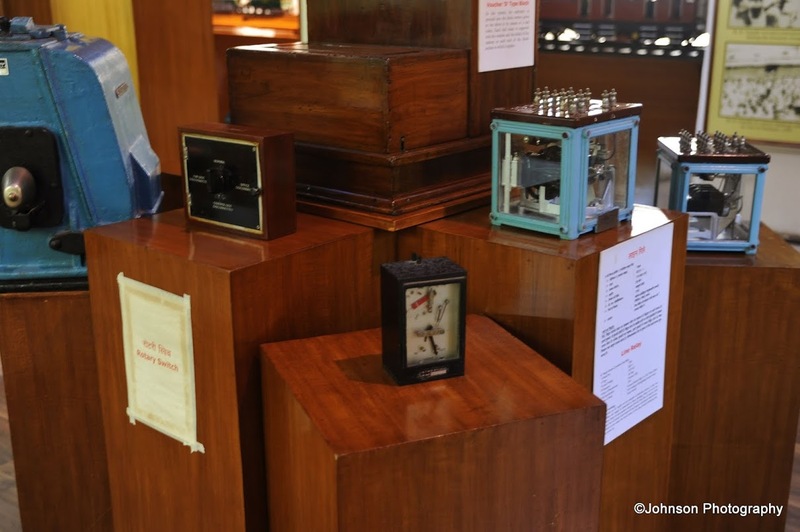 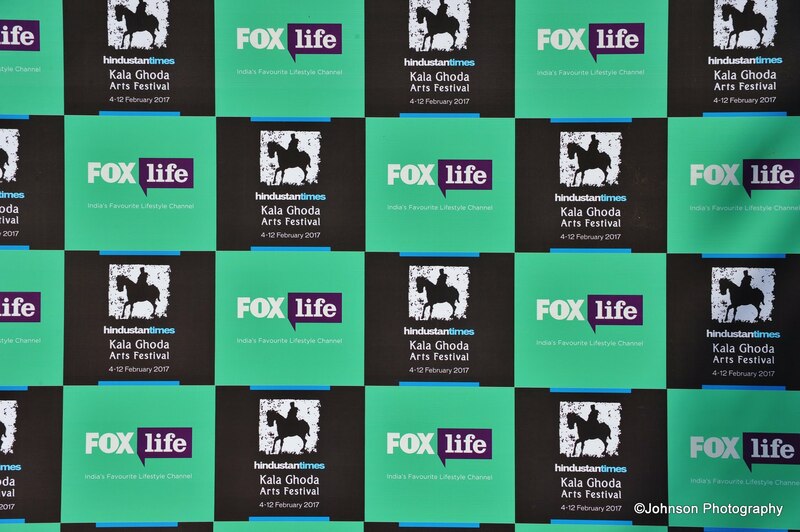 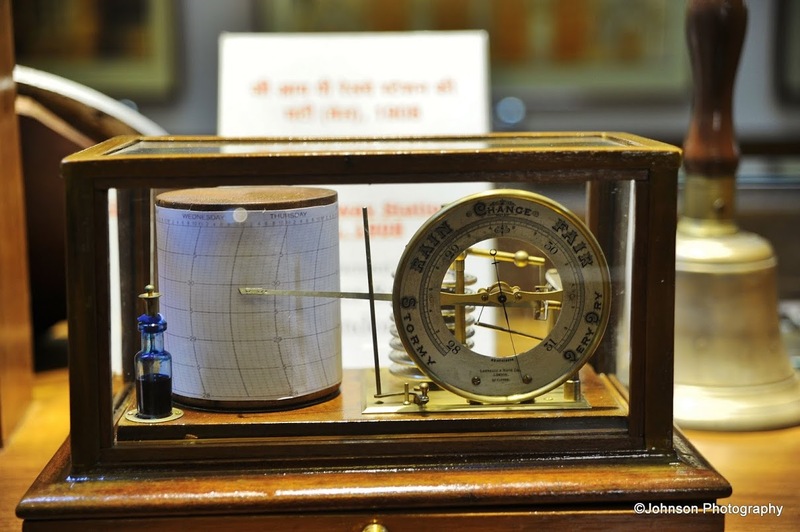 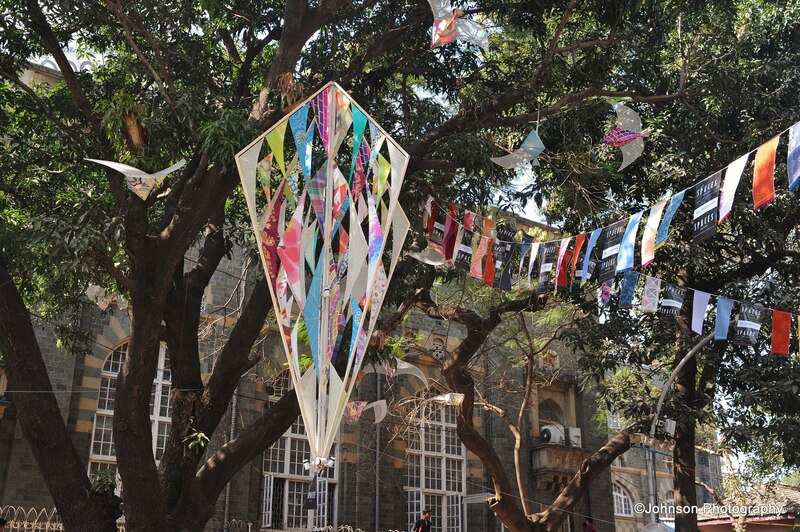 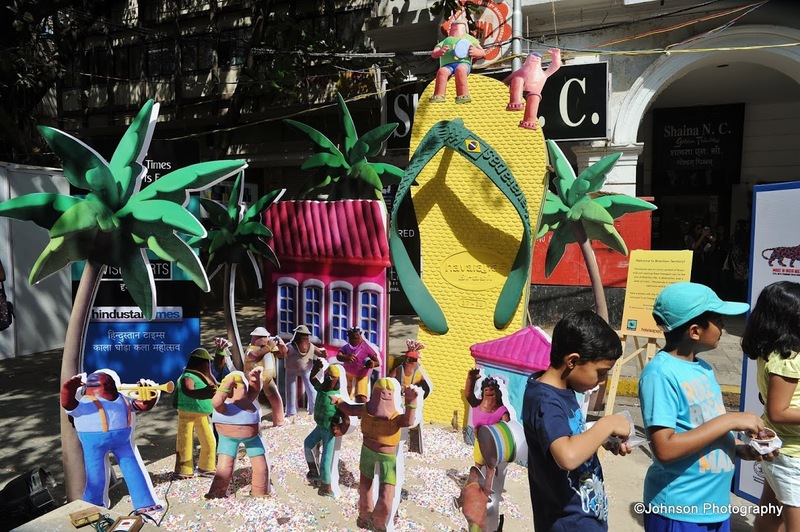 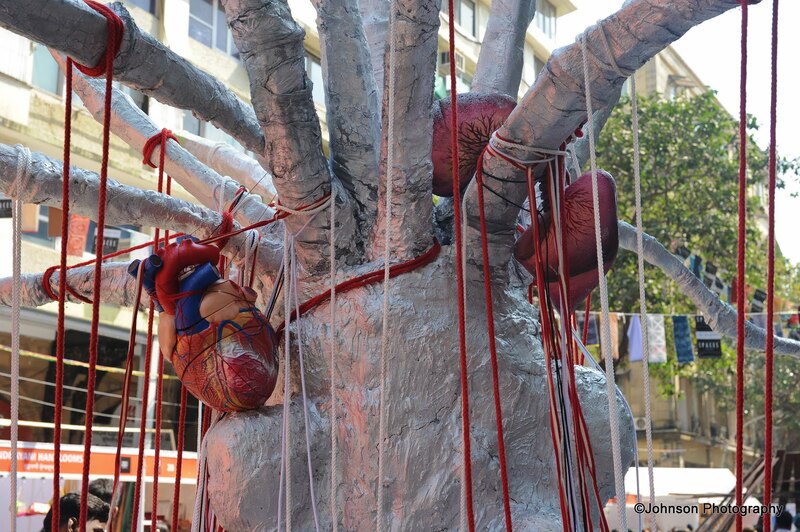 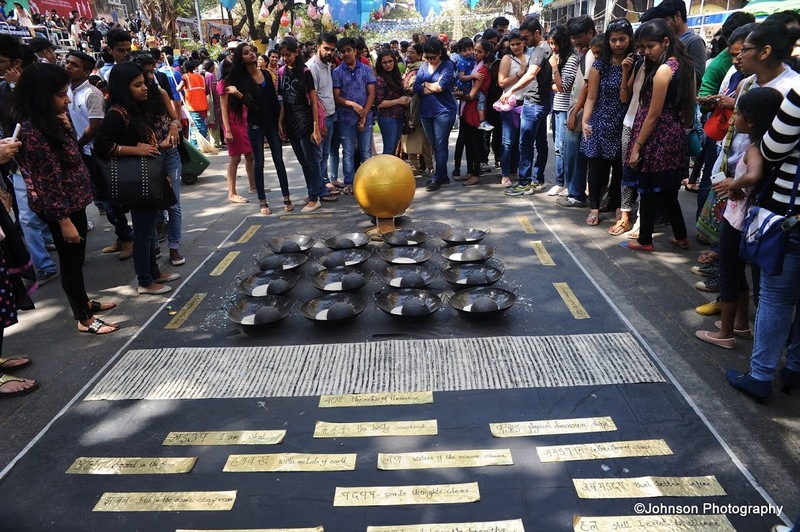 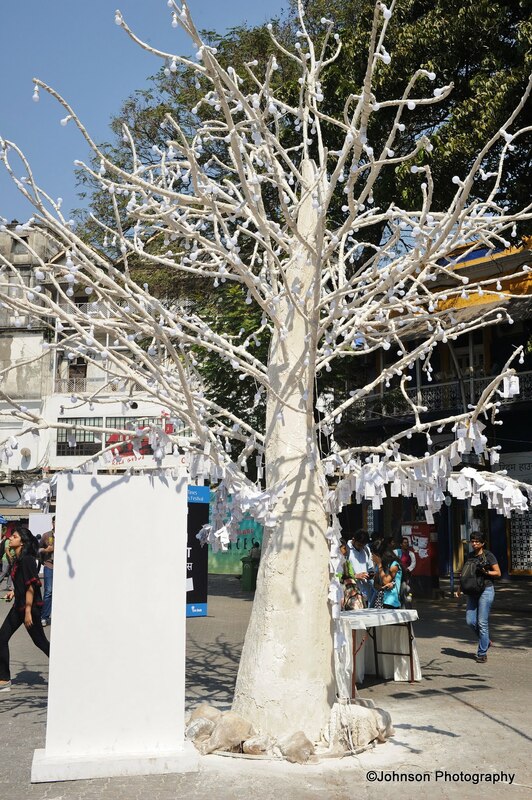 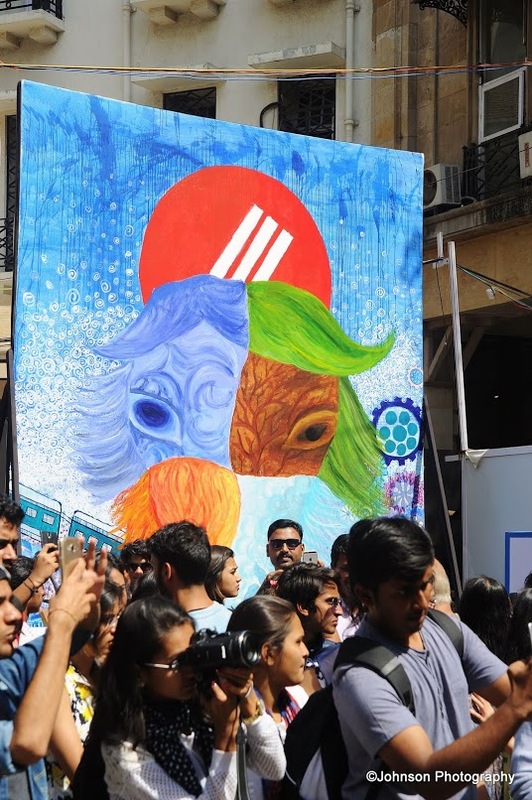 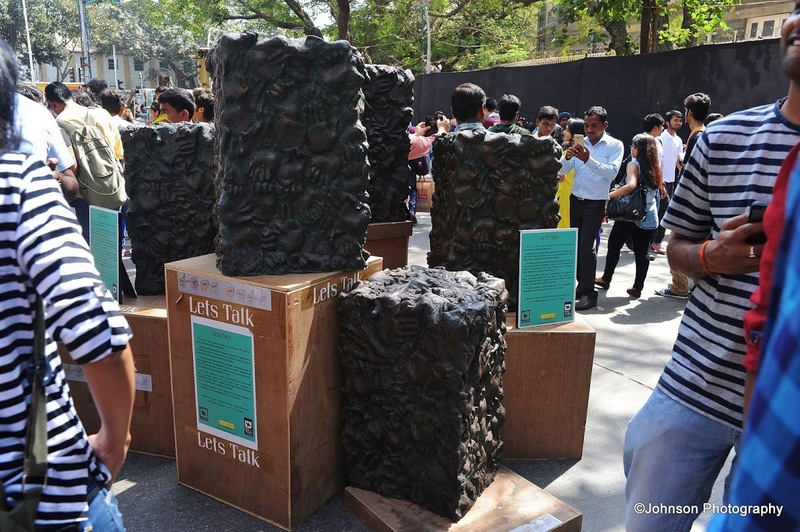 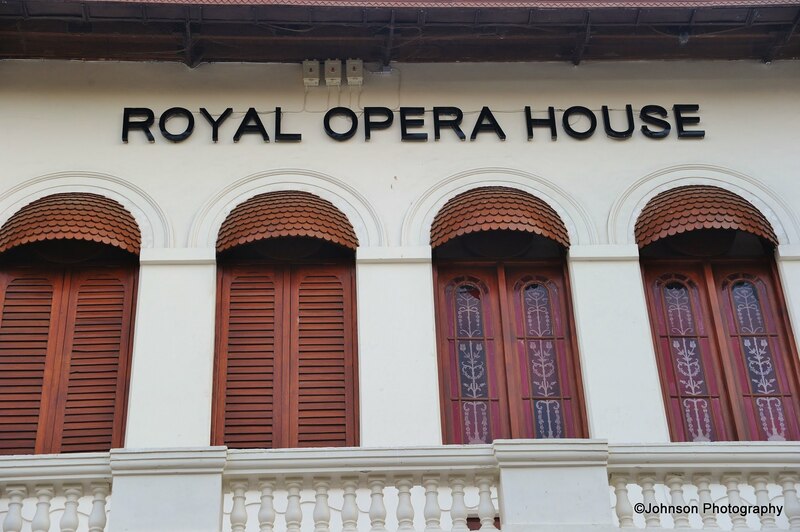 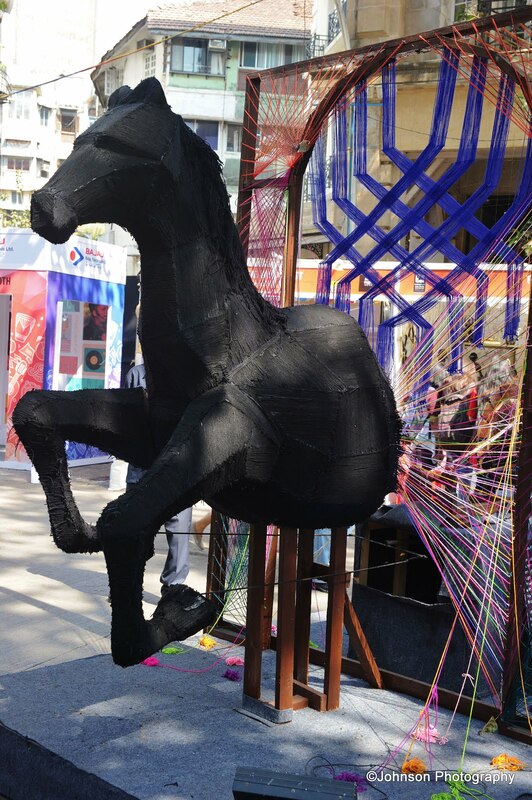 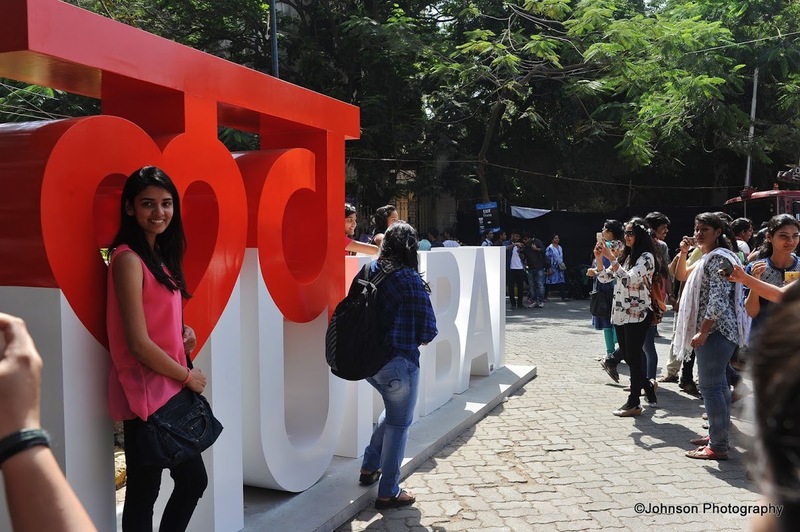 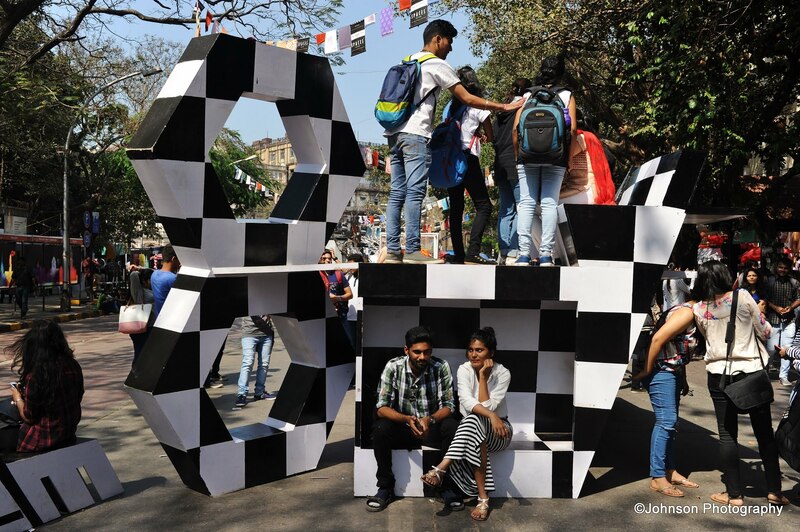 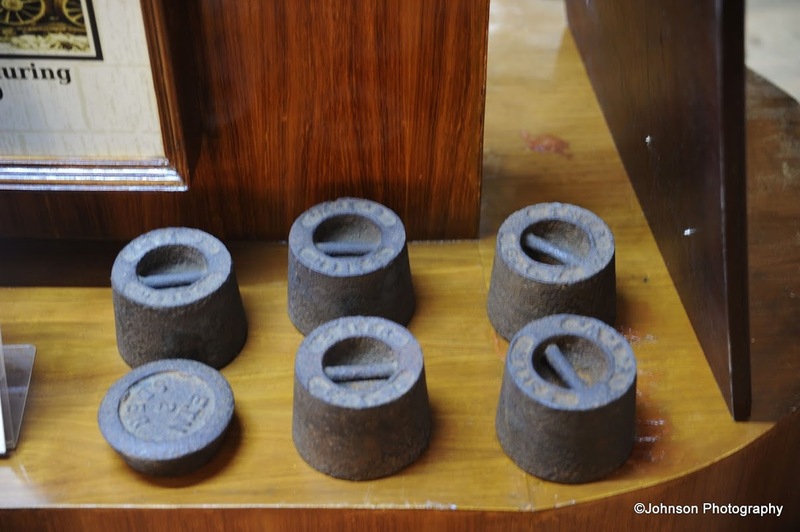 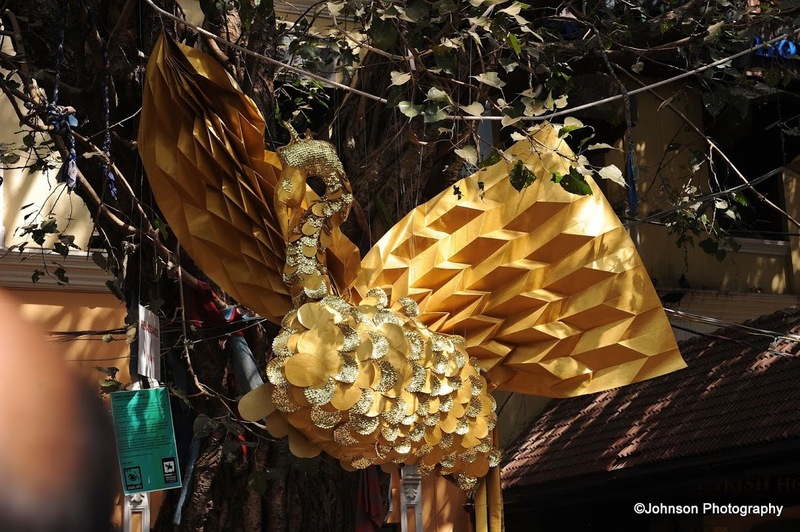 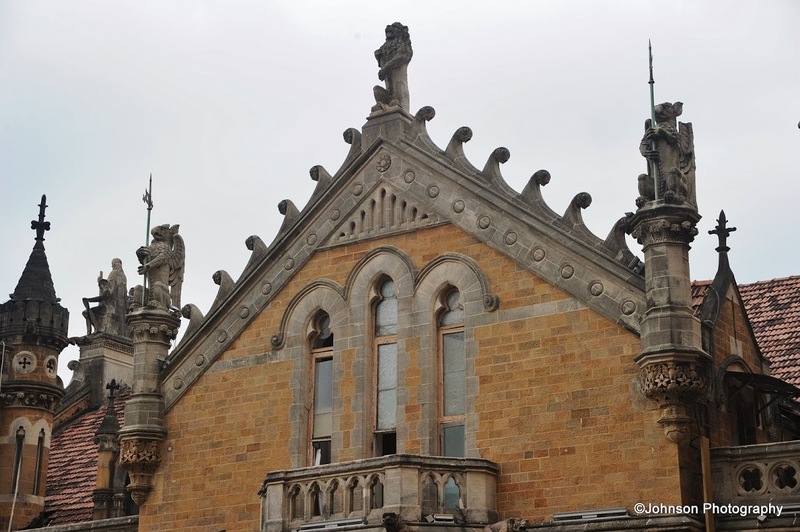 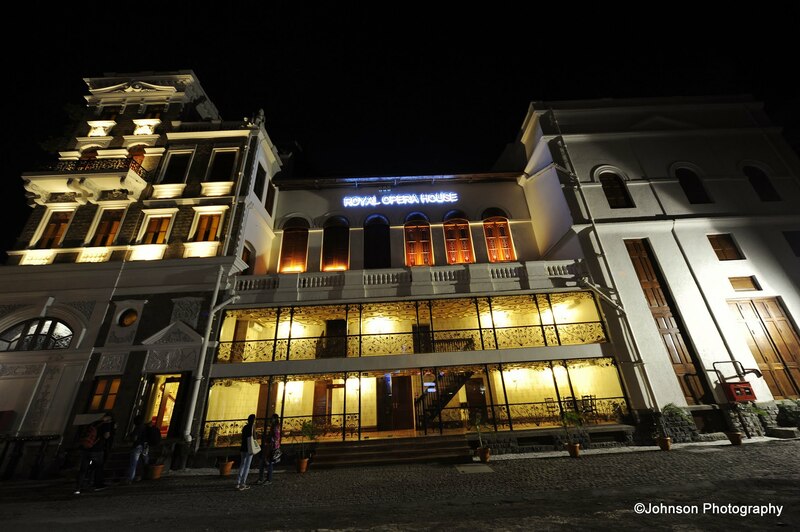 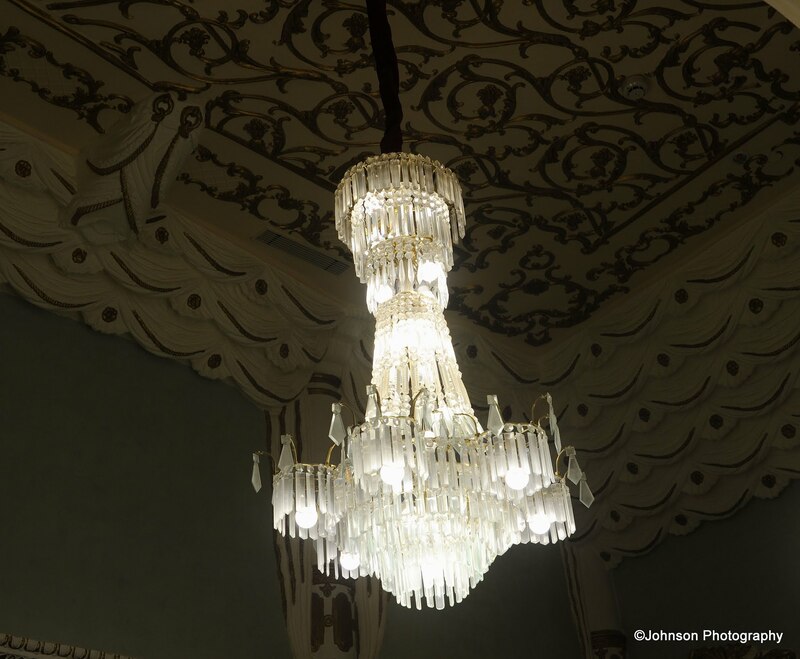 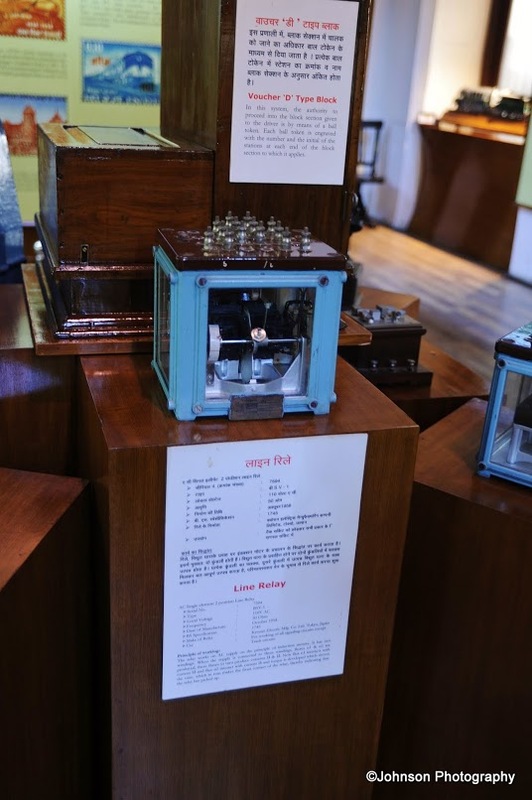 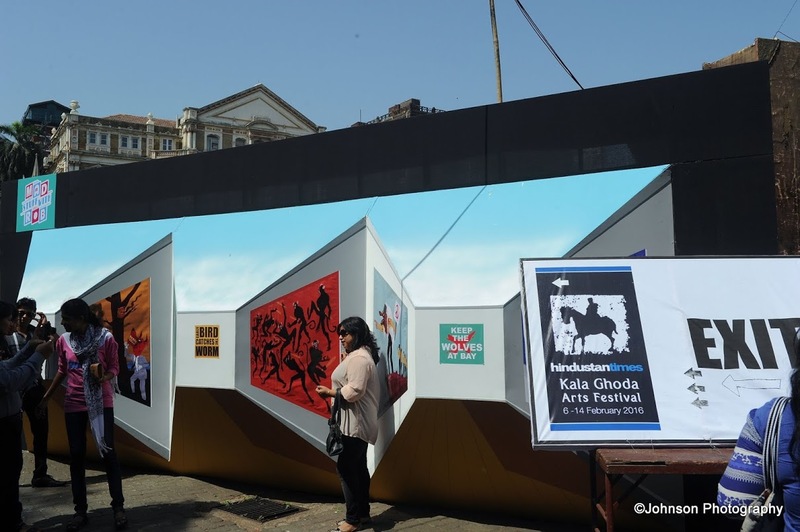 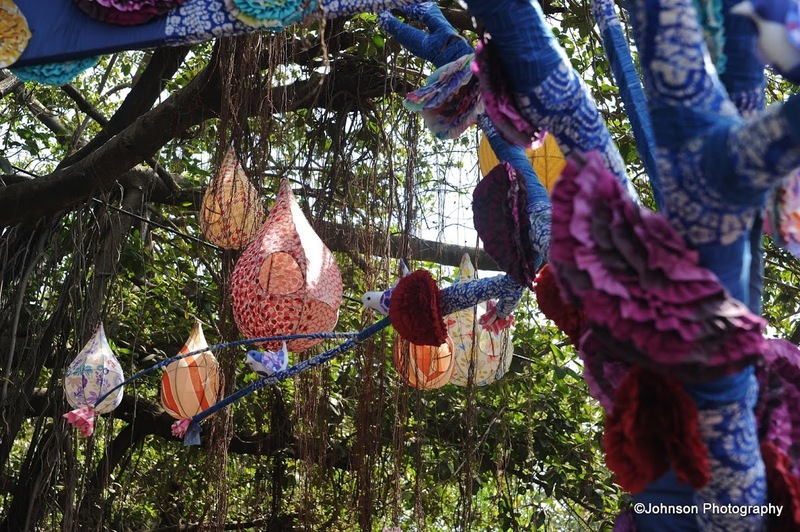 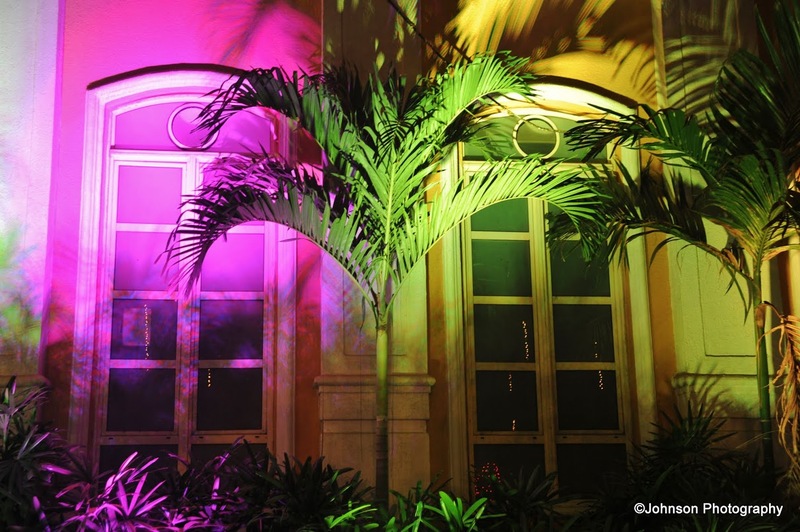 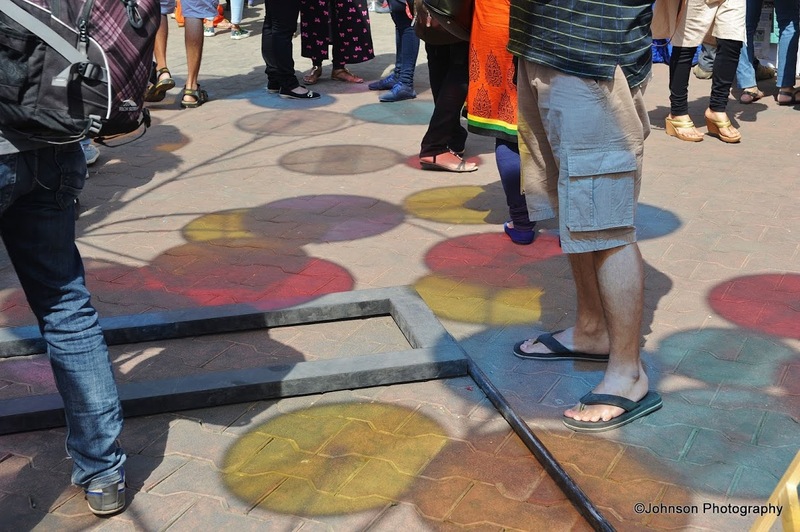 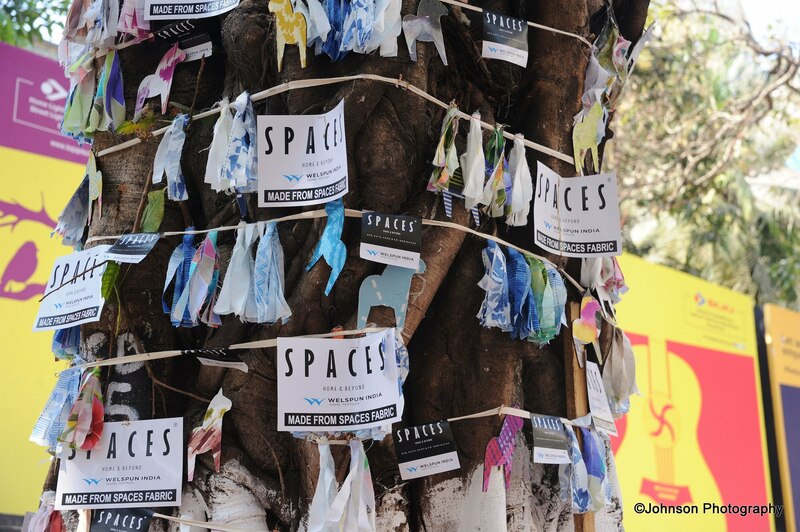 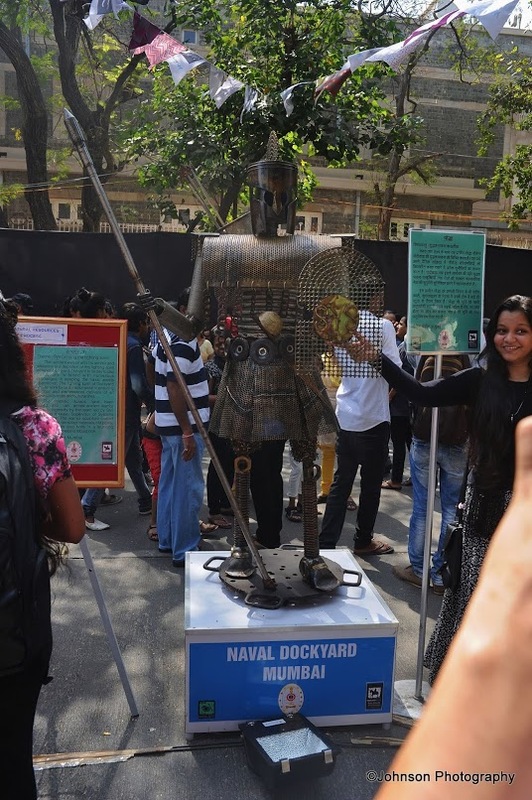 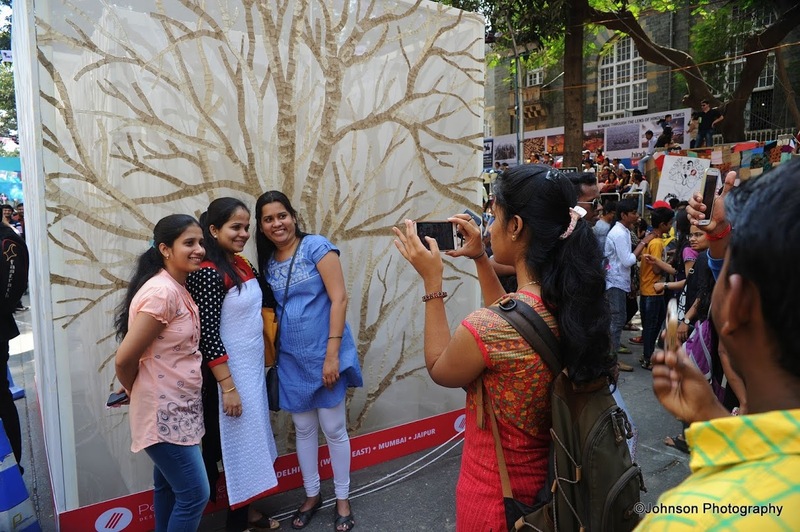 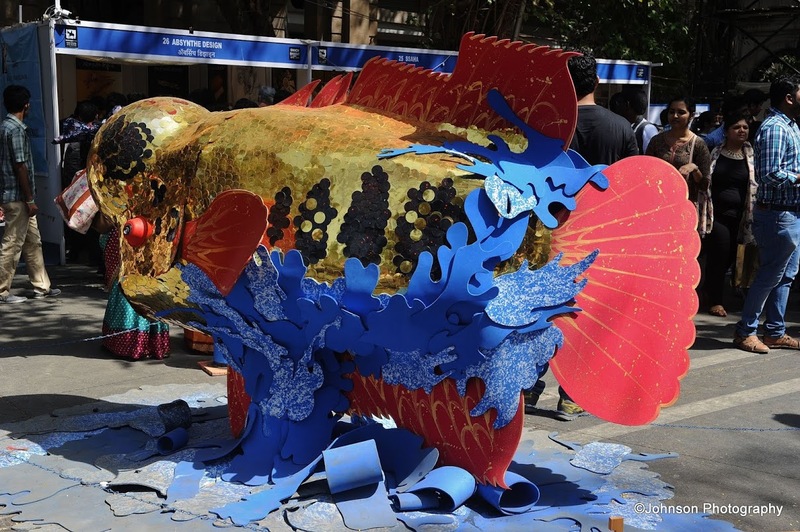 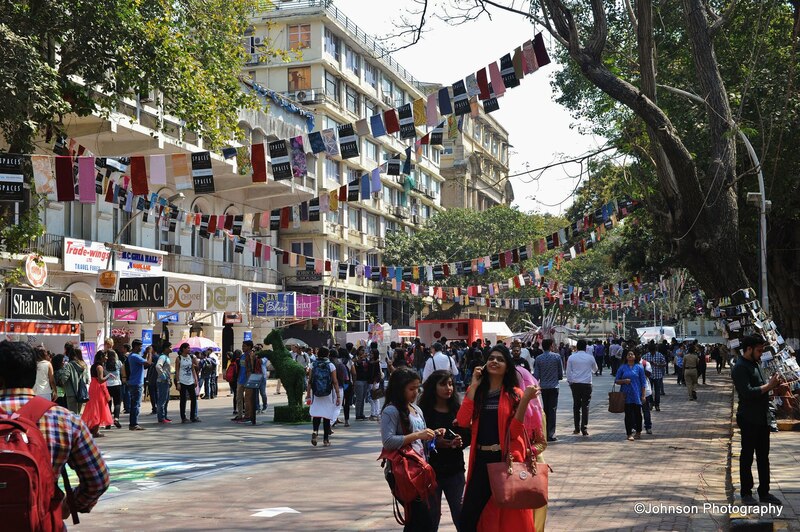 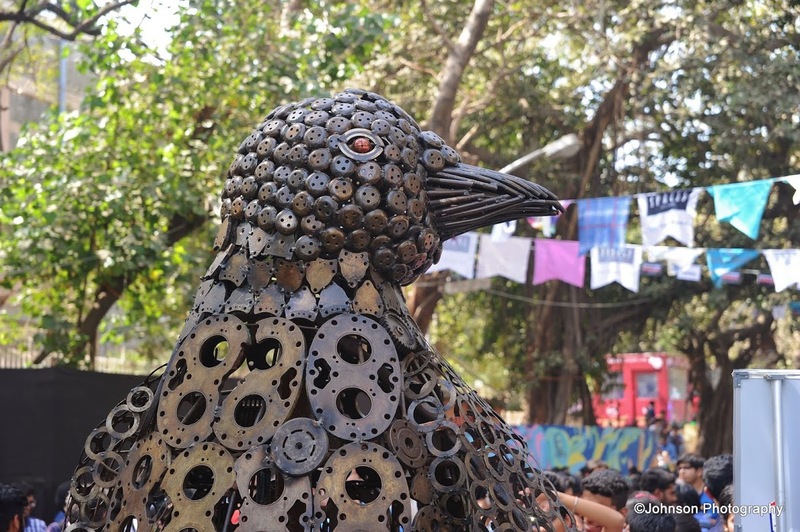 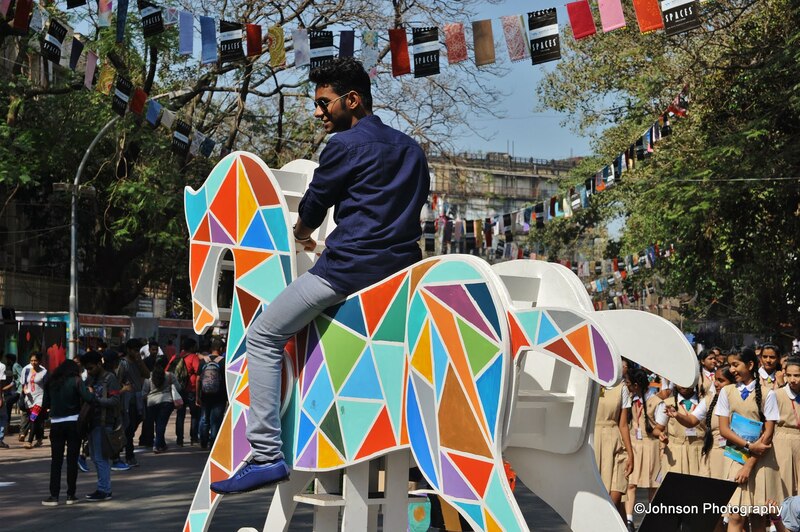 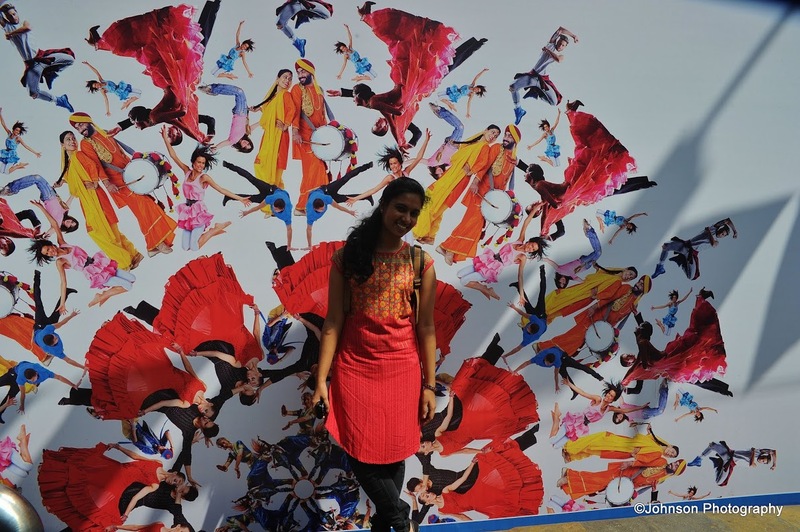 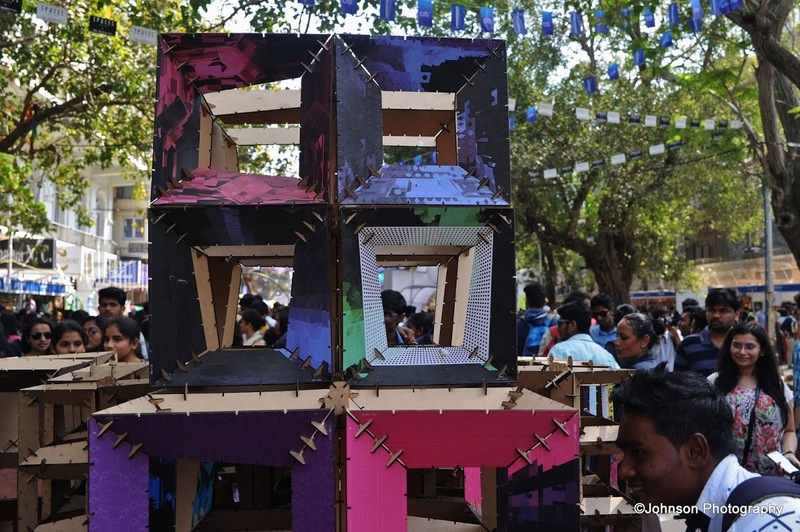 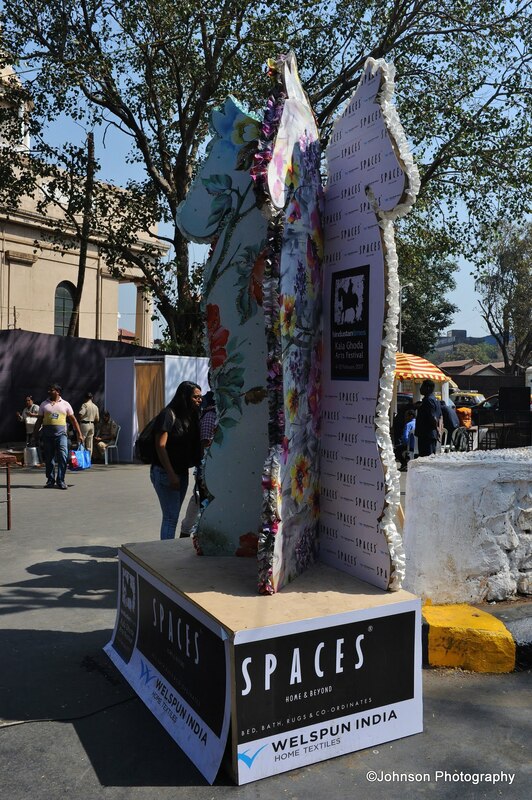 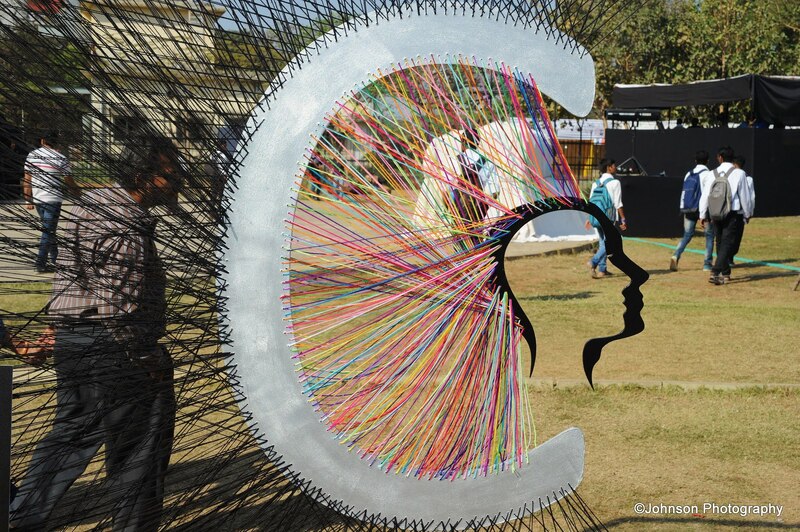 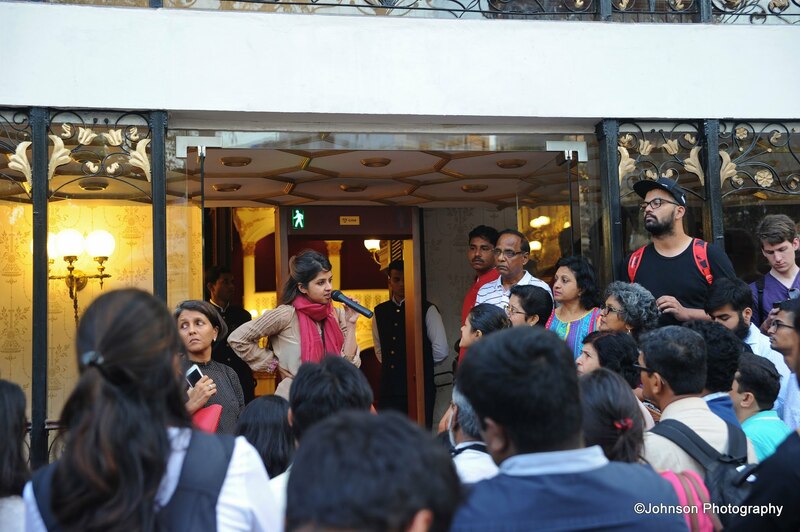 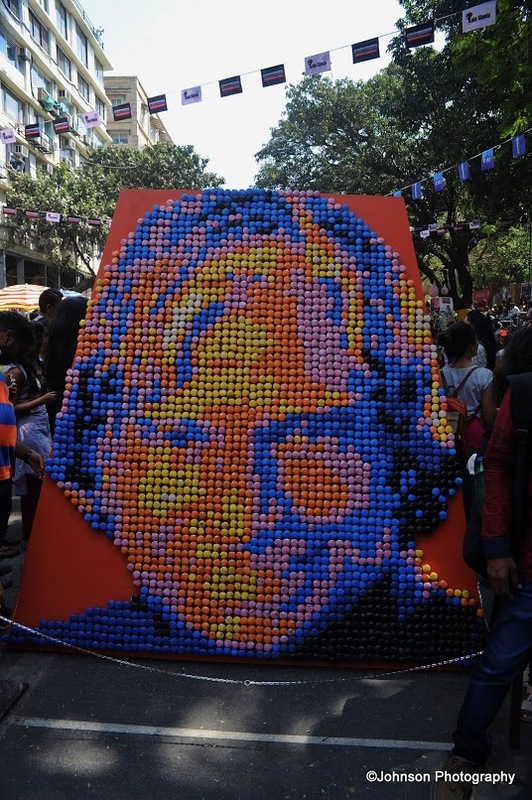 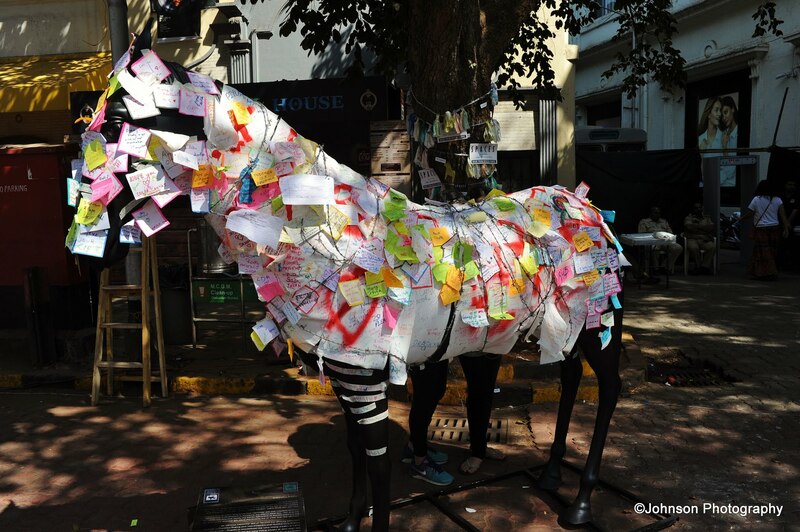 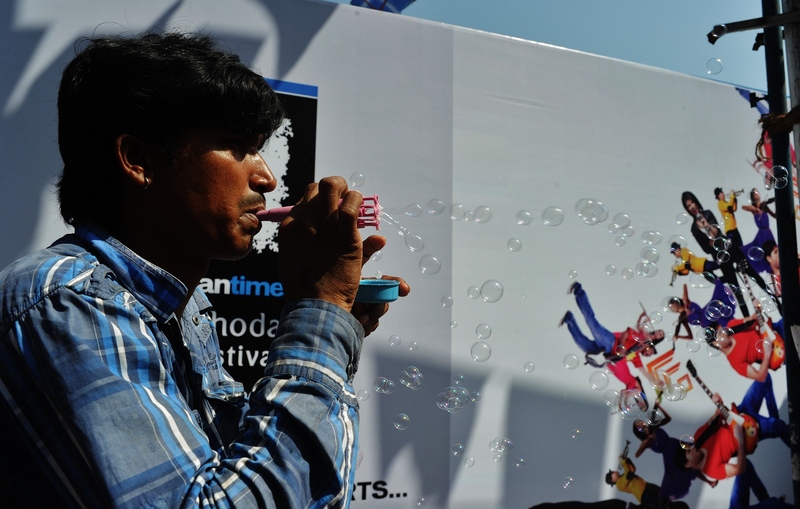 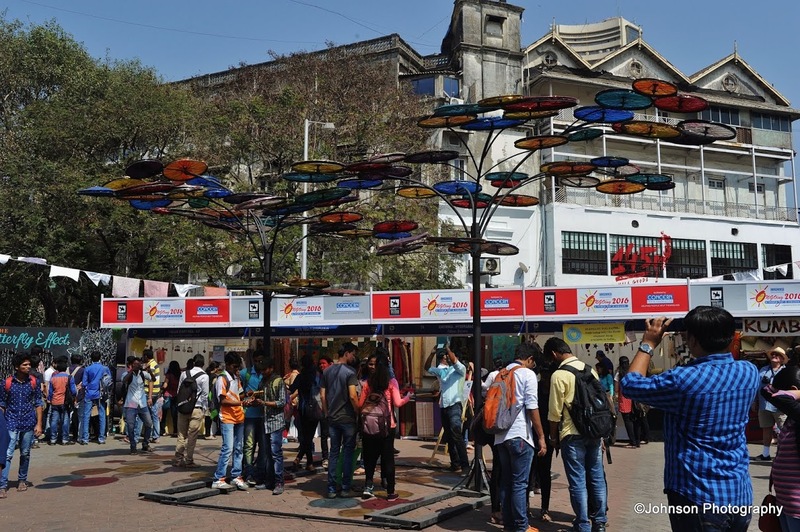 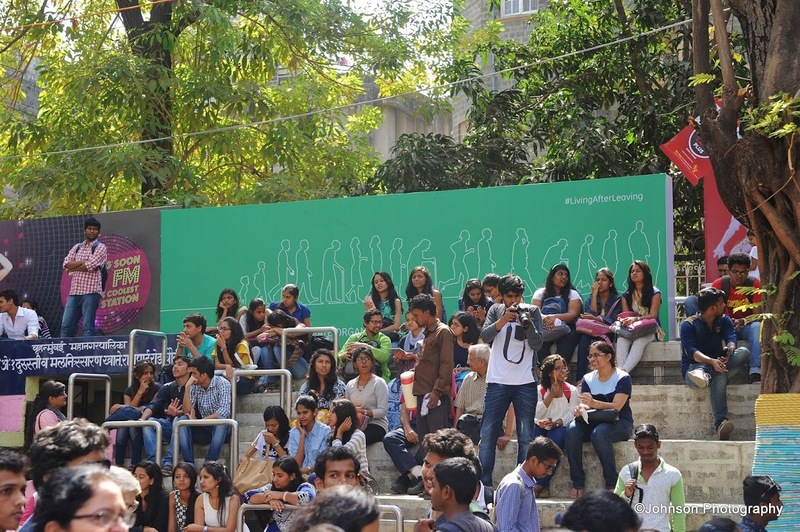 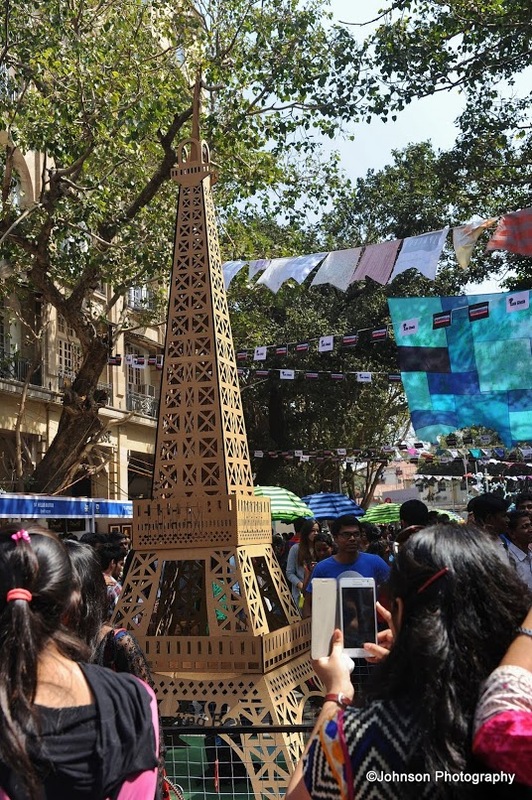 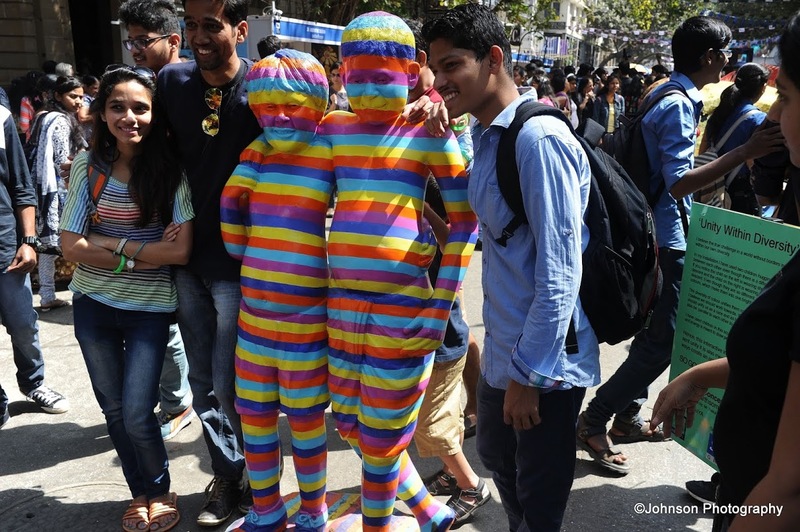 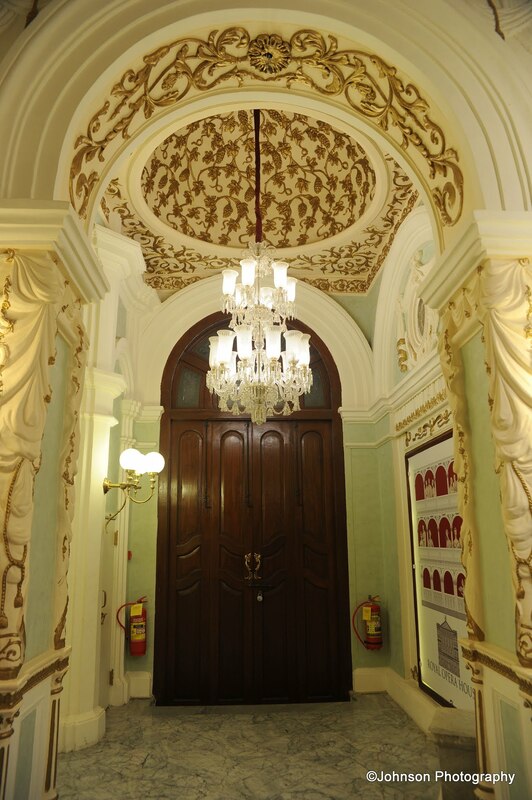 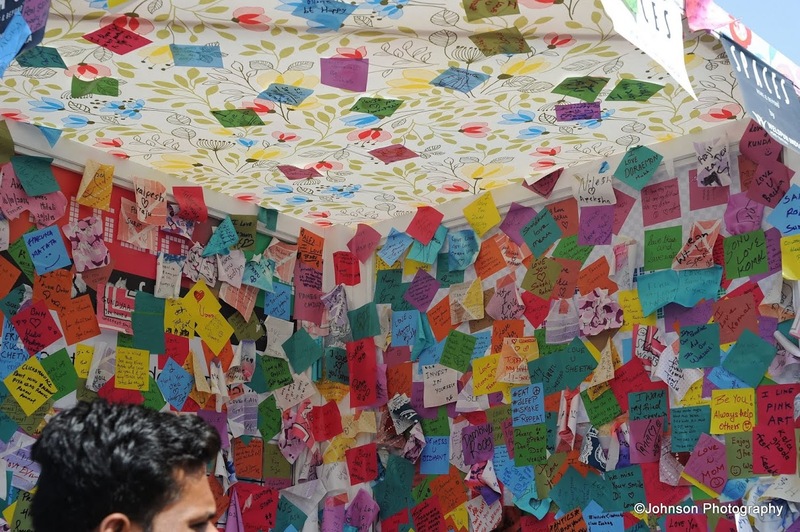 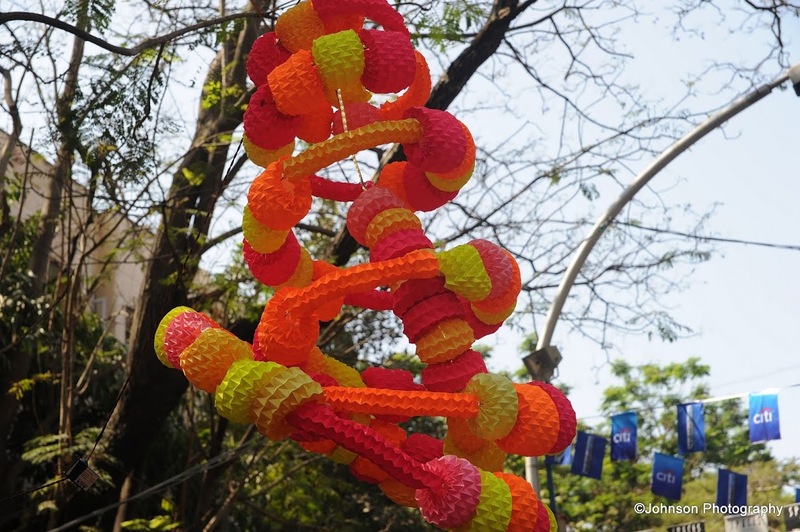 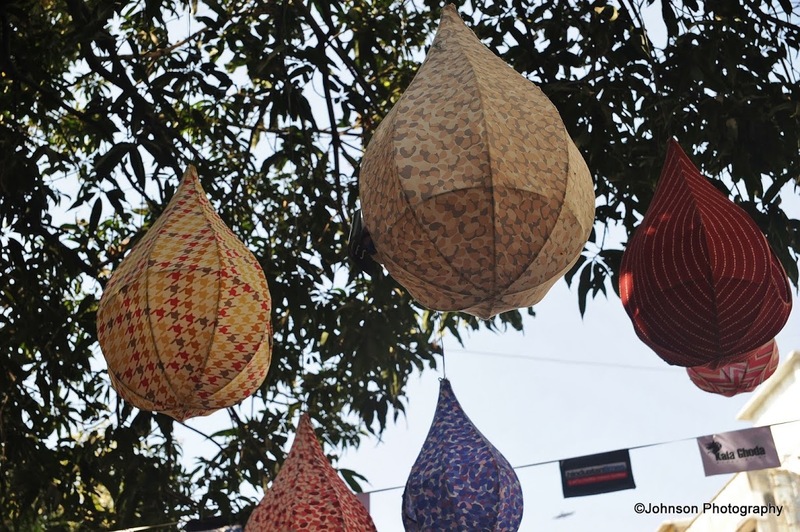 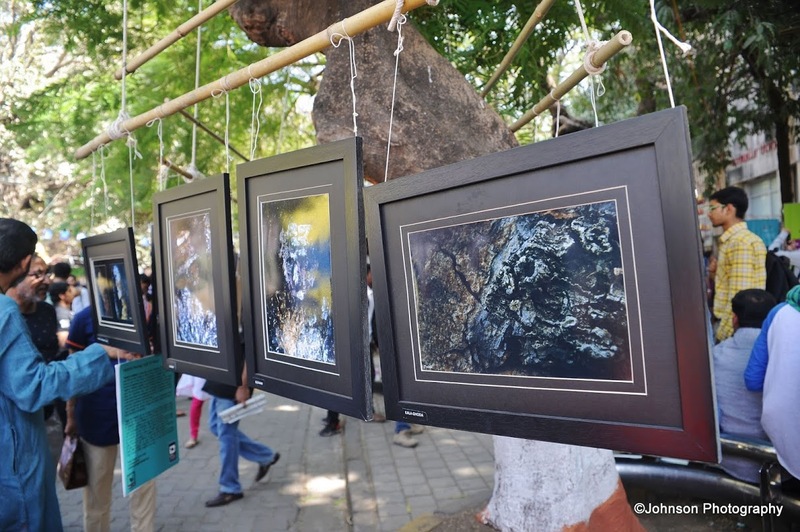 Every year, since 1999 the association hosts the Kala Ghoda Arts Festival. 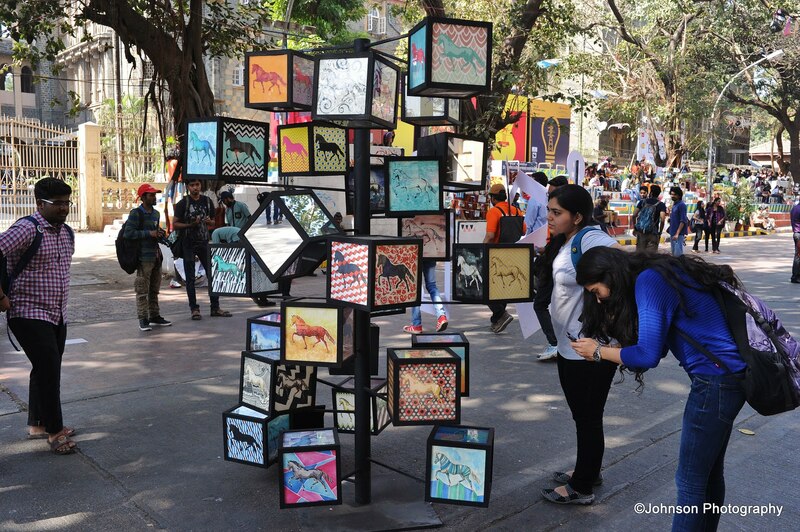 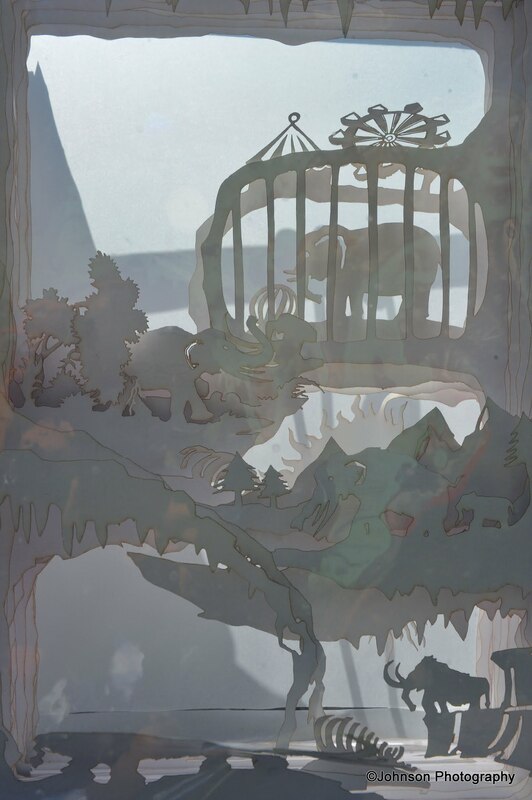 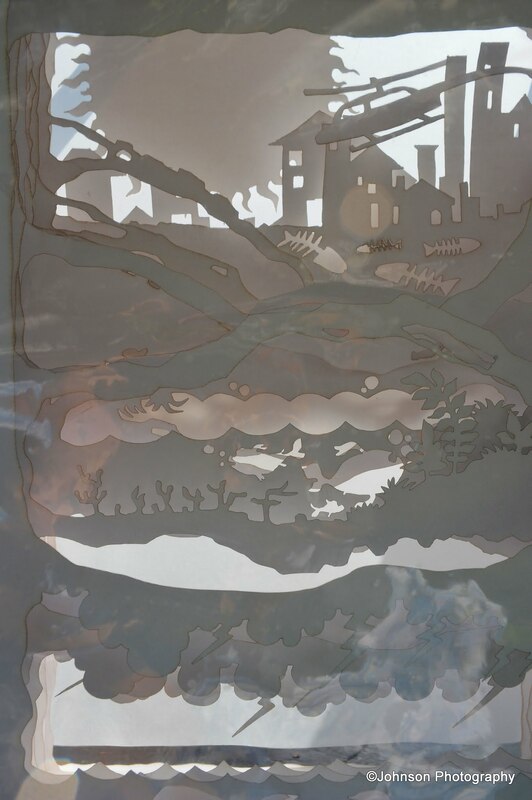 The nine days long festival commences on the first Saturday of February and closing on the second Sunday of February. 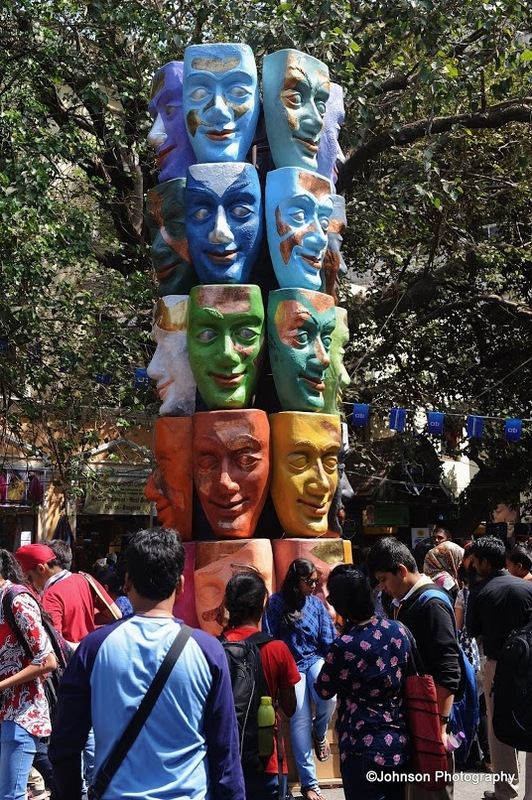 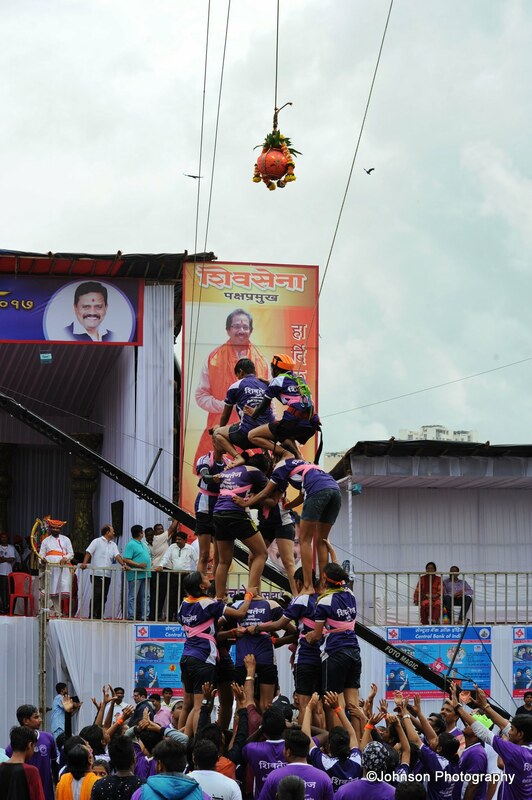 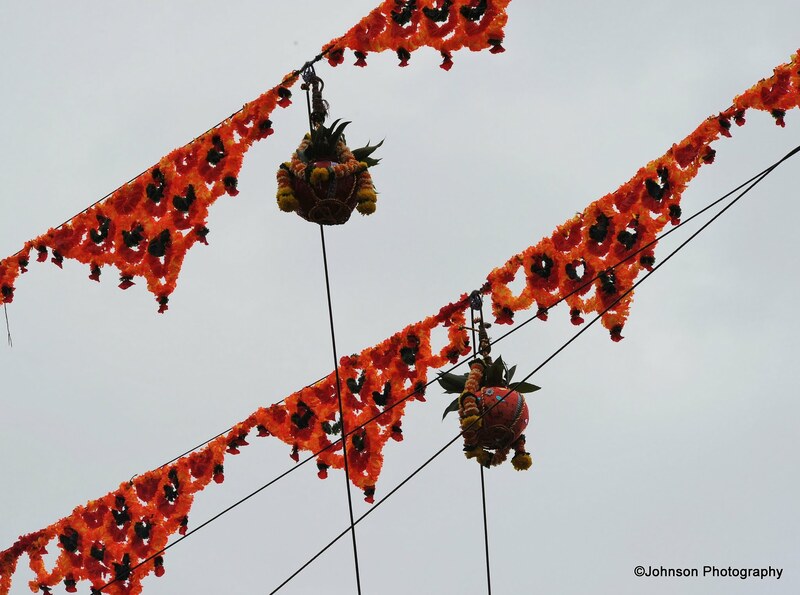 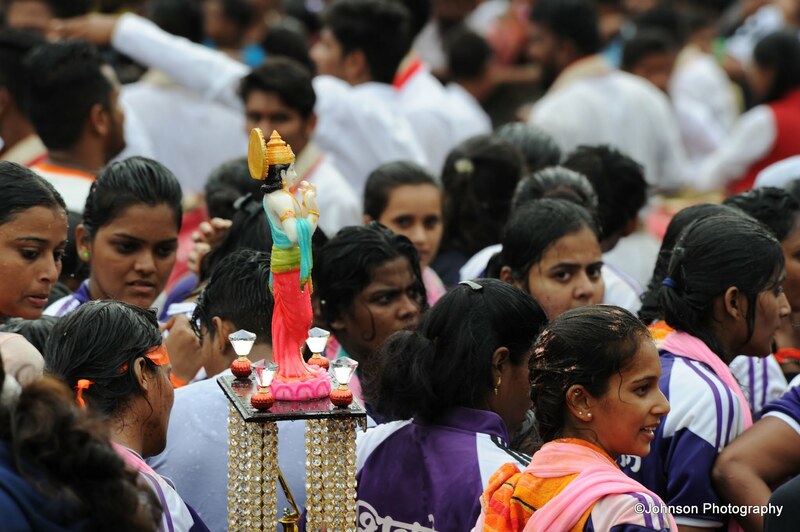 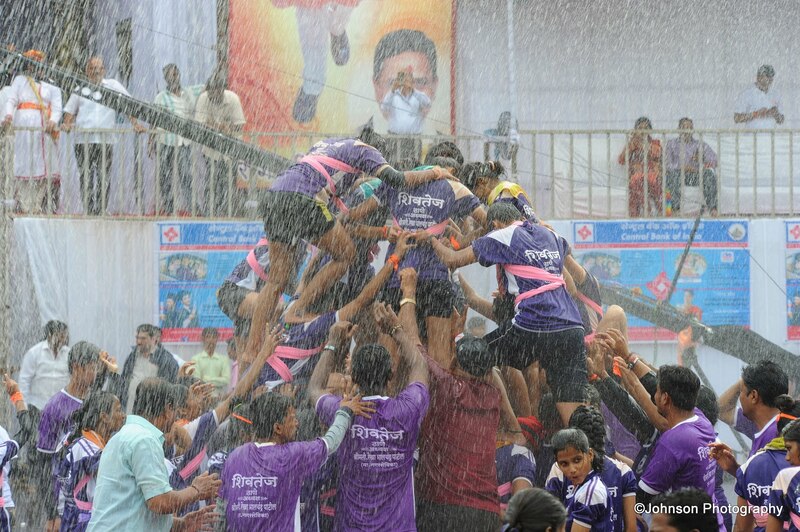 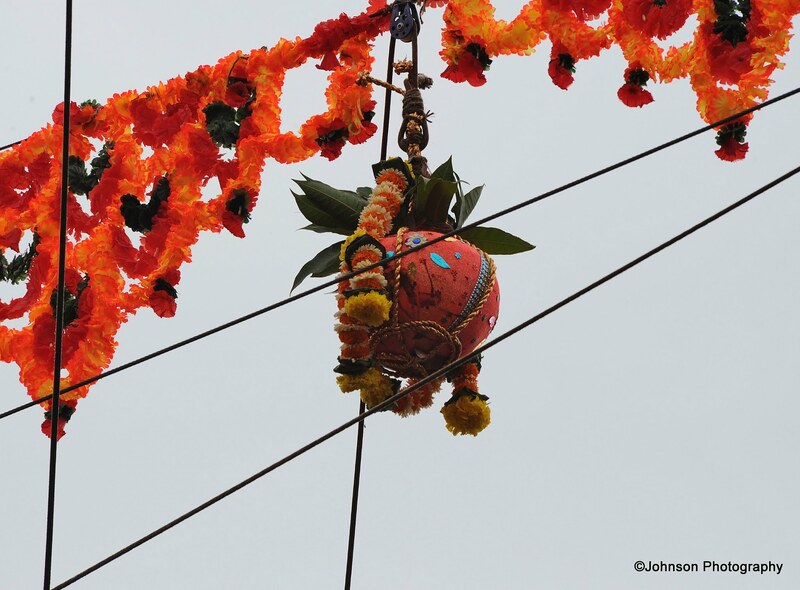 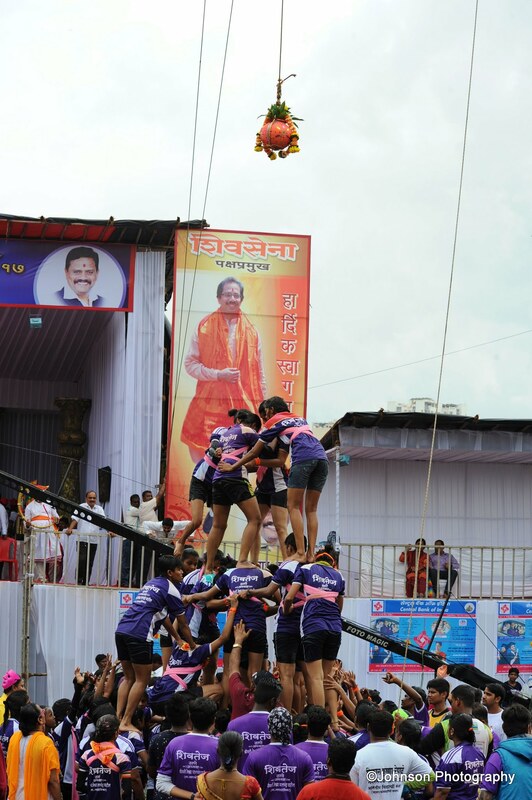 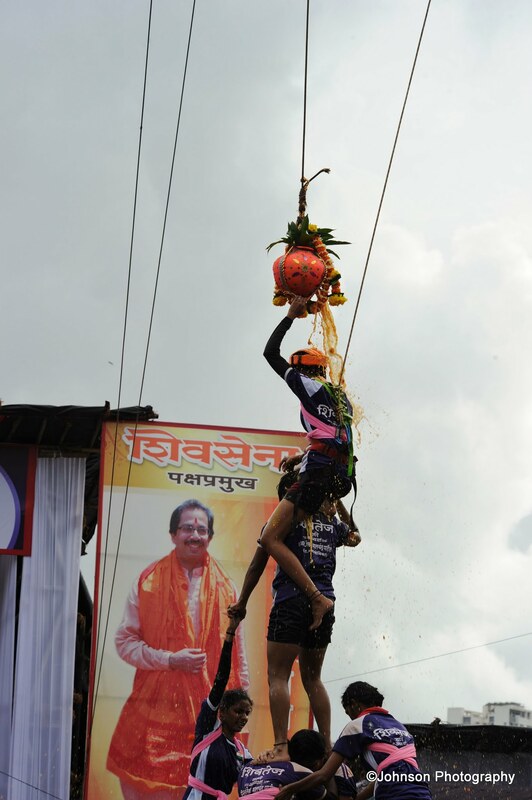 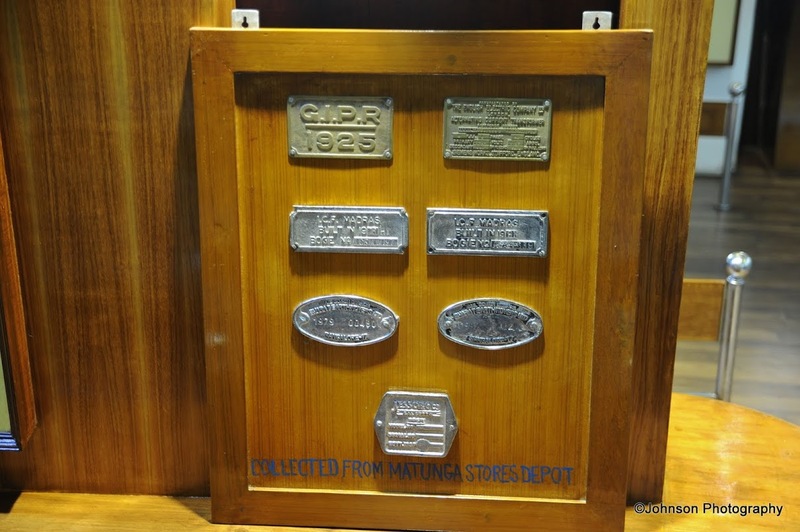 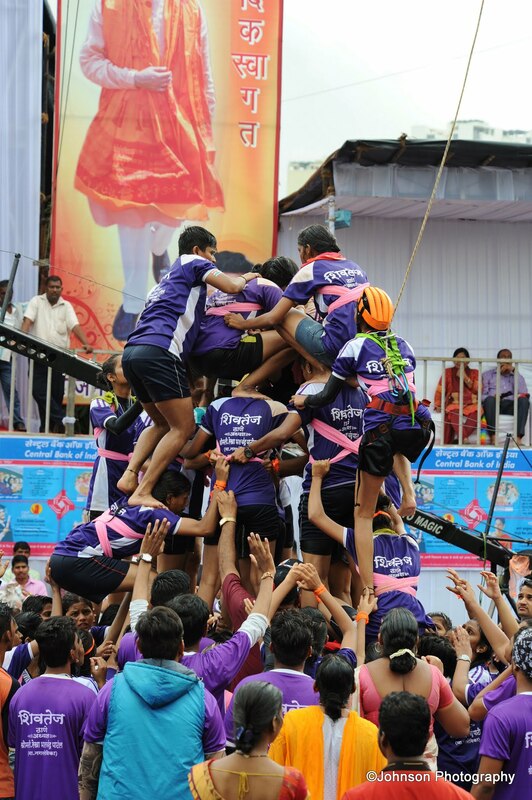 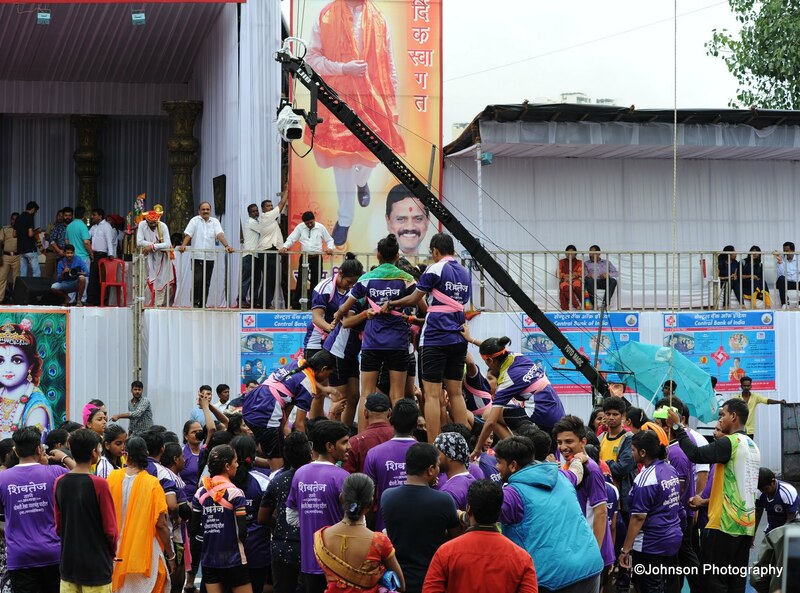 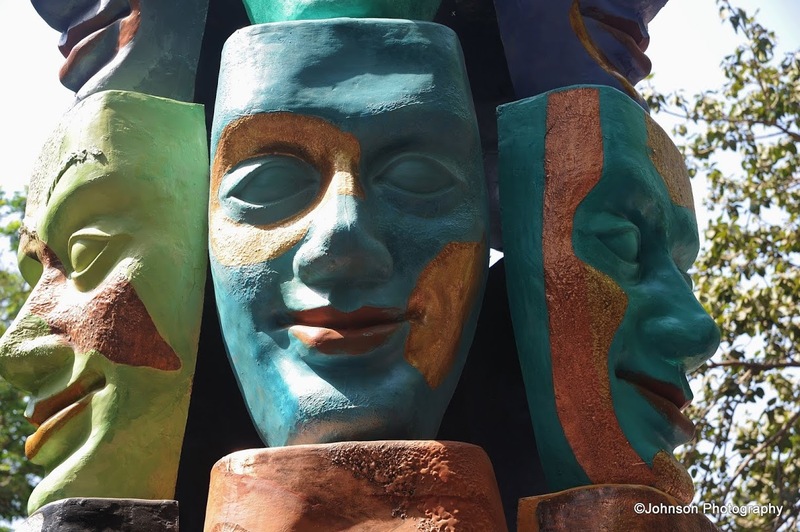 Over the years, the festival has grown in stature and popularity attracting visitors and participants from other parts of the country and the world. 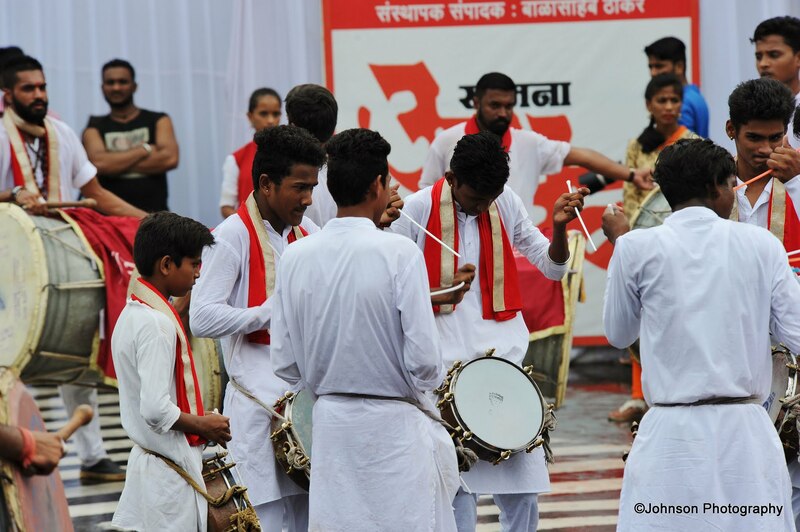 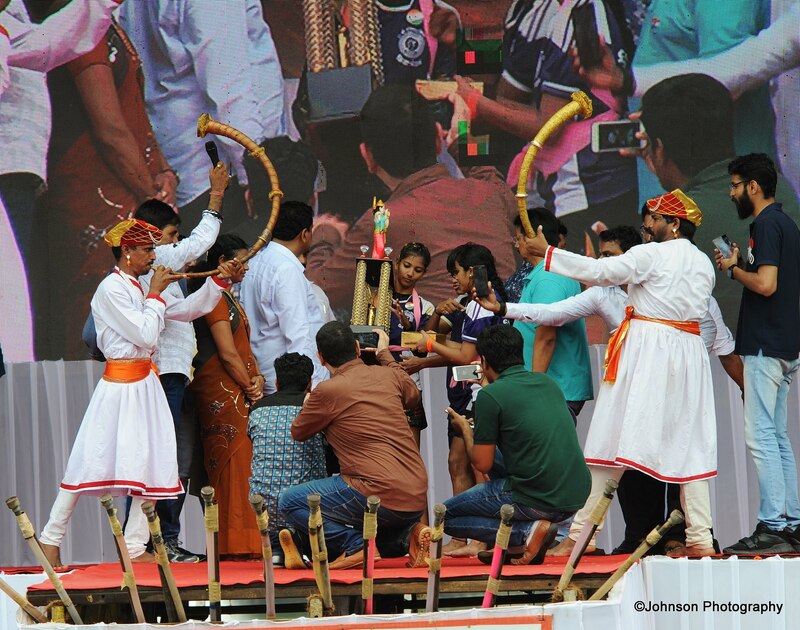 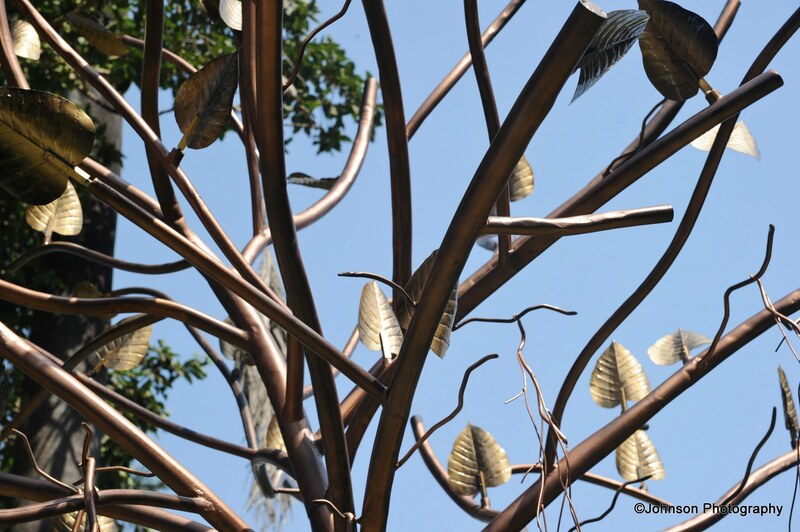 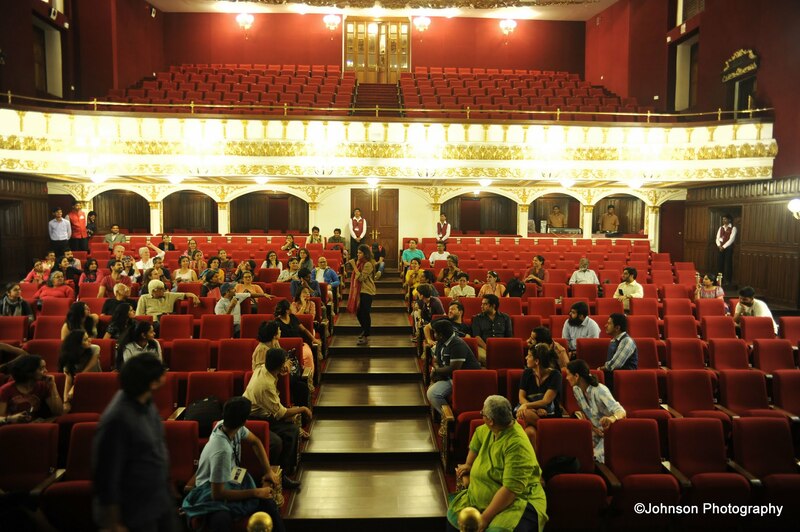 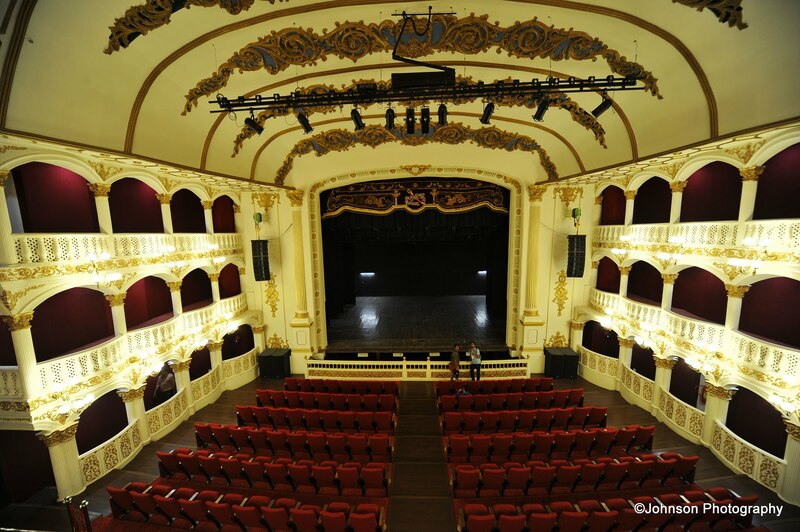 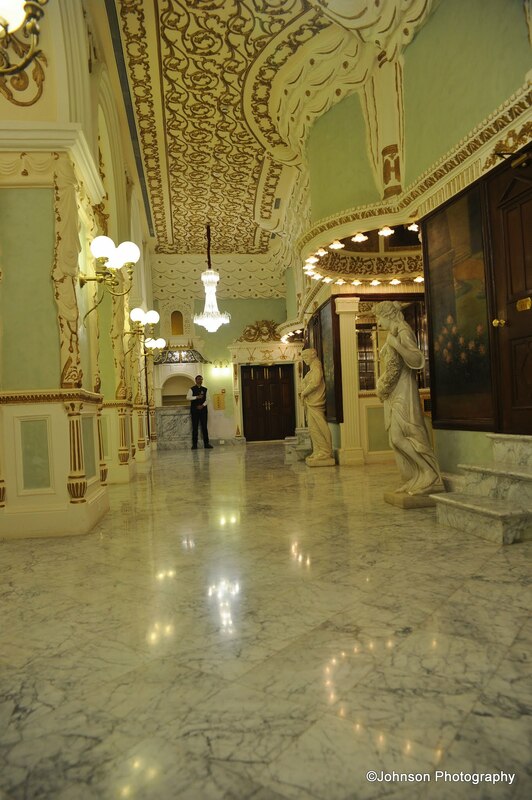 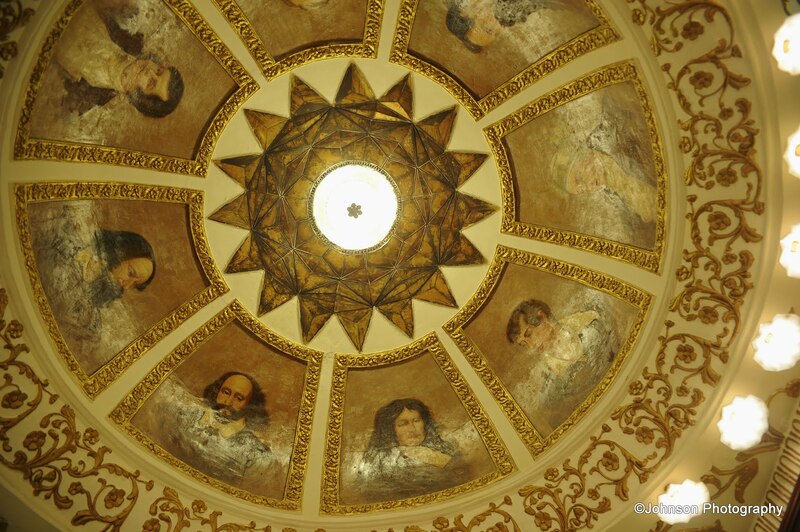 The festival sections are visual arts, dance, music, theatre, cinema, literature, workshops, heritage walks, urban etc. 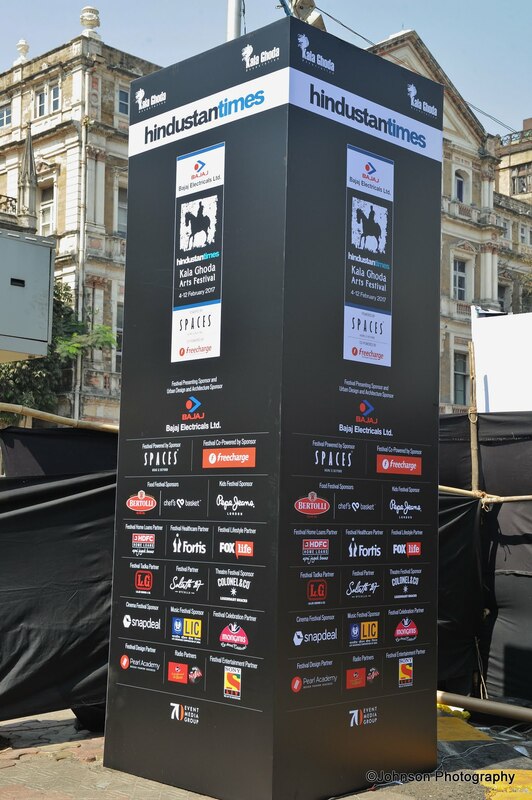 Entry to all the events is free to all, as the costs are met through corporate sponsorship. 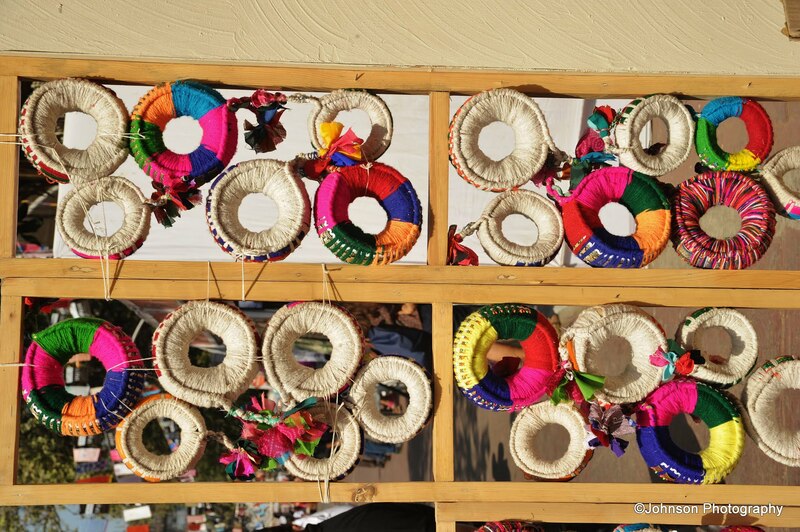 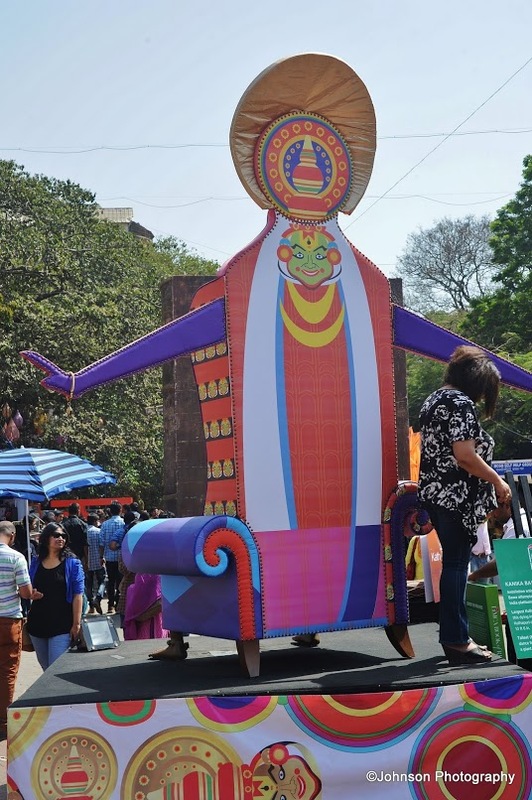 The Rampart Raw being the centre of the Festival is closed off to vehicular traffic for the duration of the festival, with the entire area becoming a street mela, with interactive art installations and stalls of artisans selling their creations. 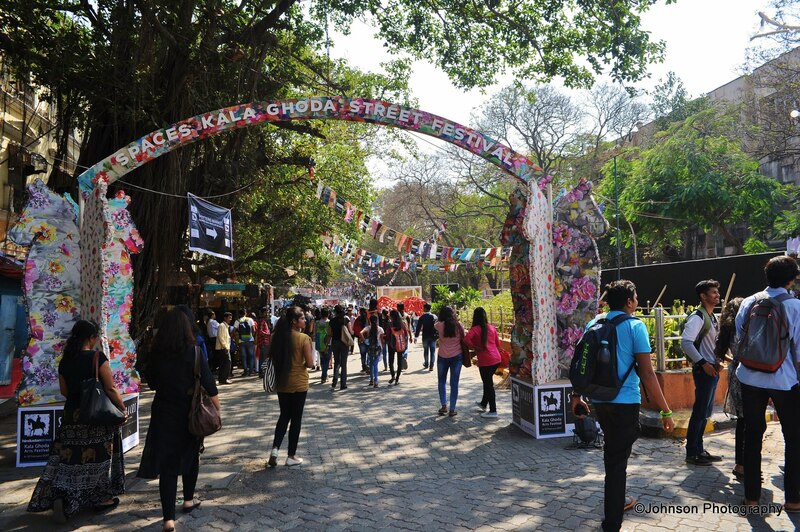 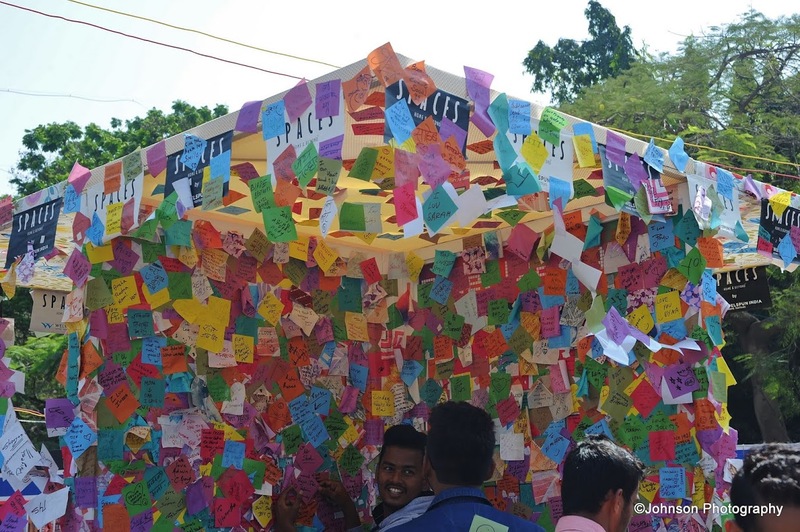 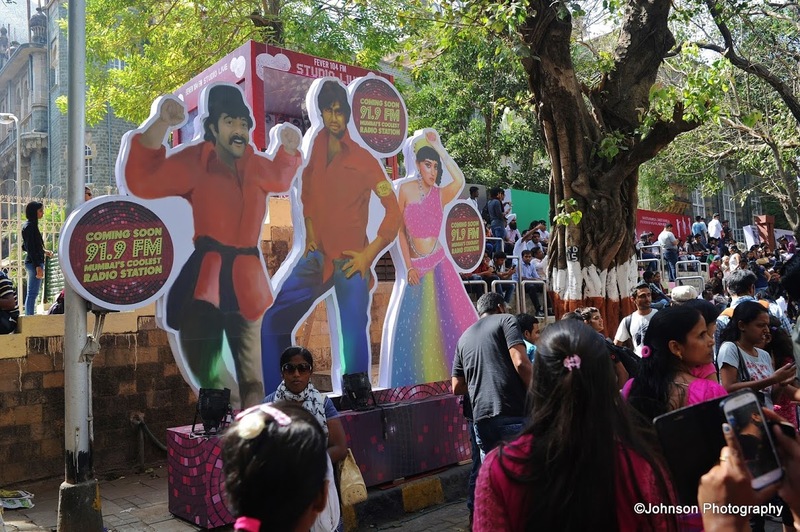 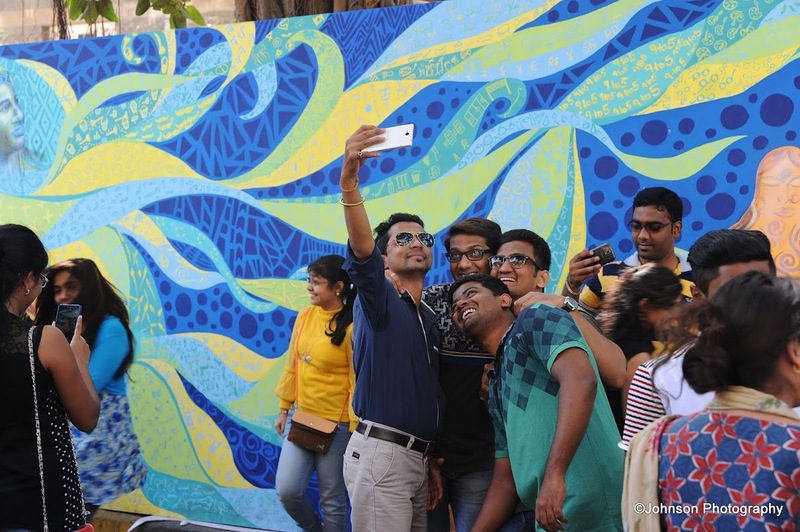 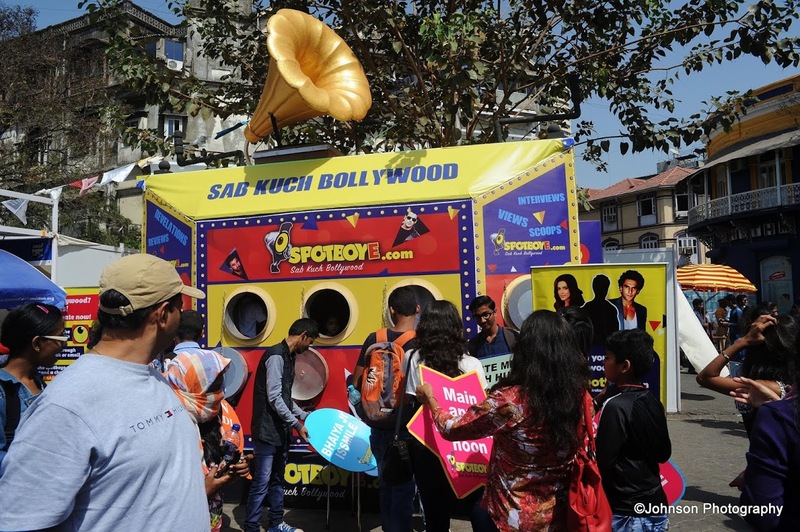 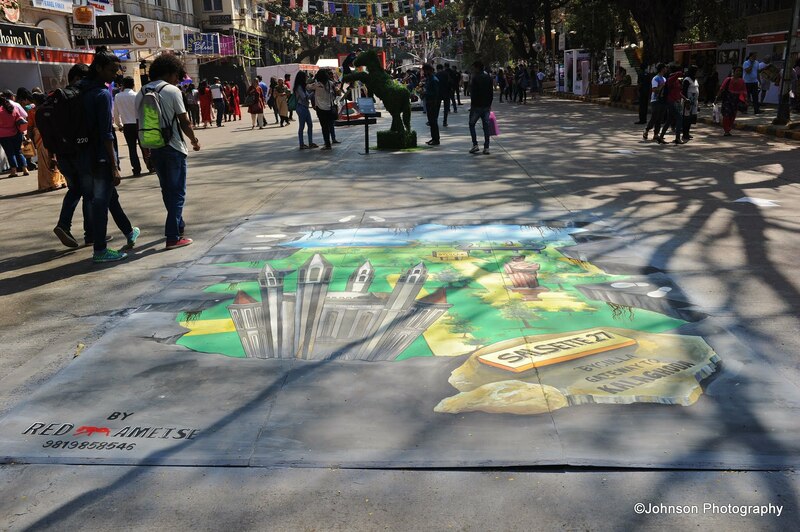 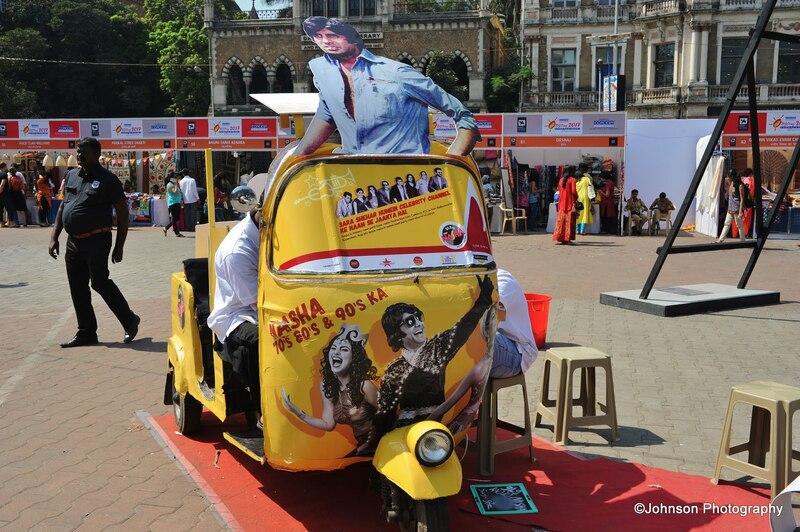 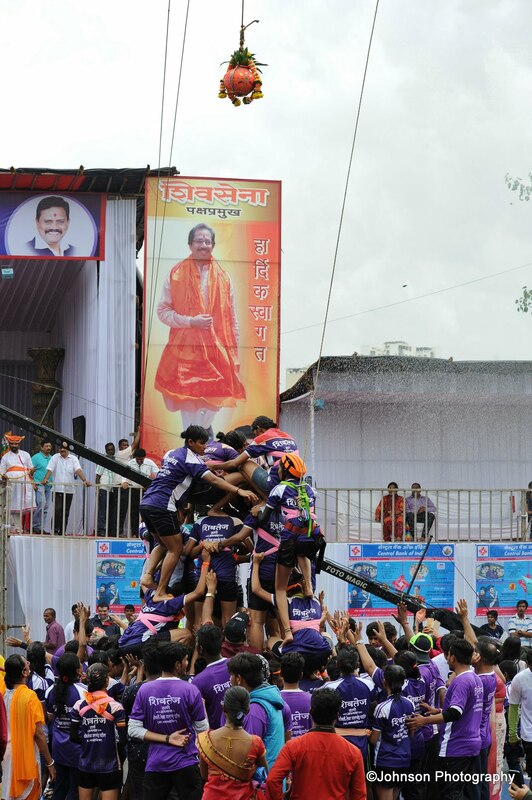 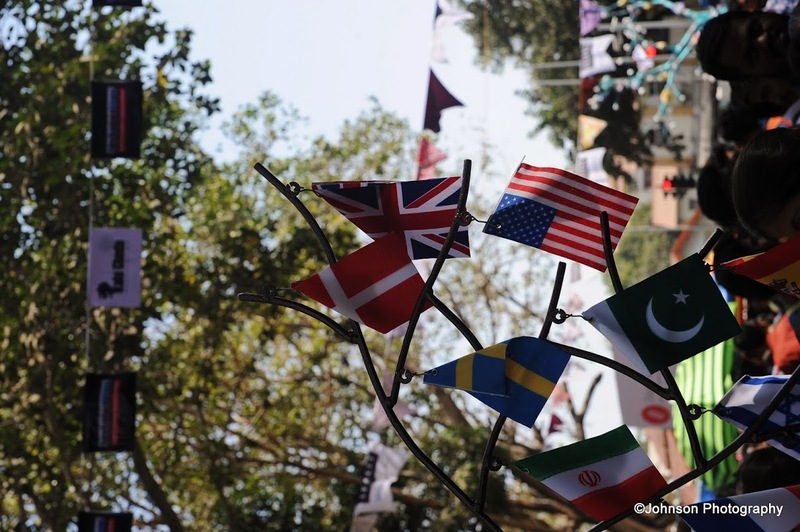 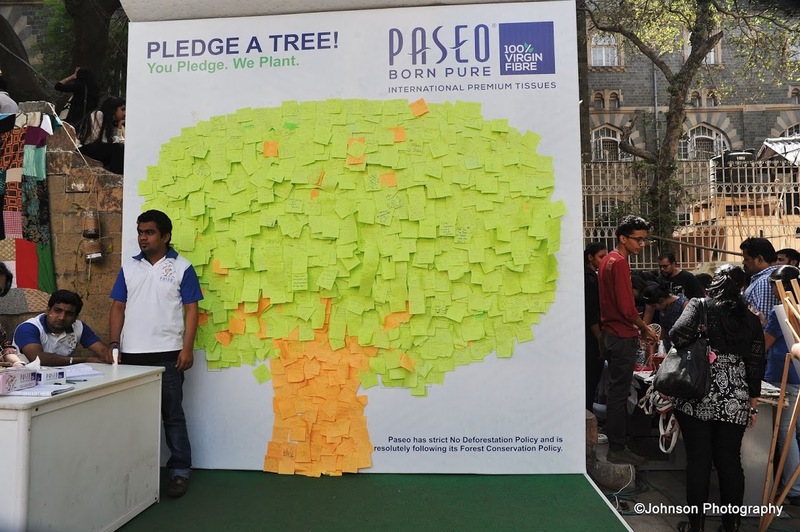 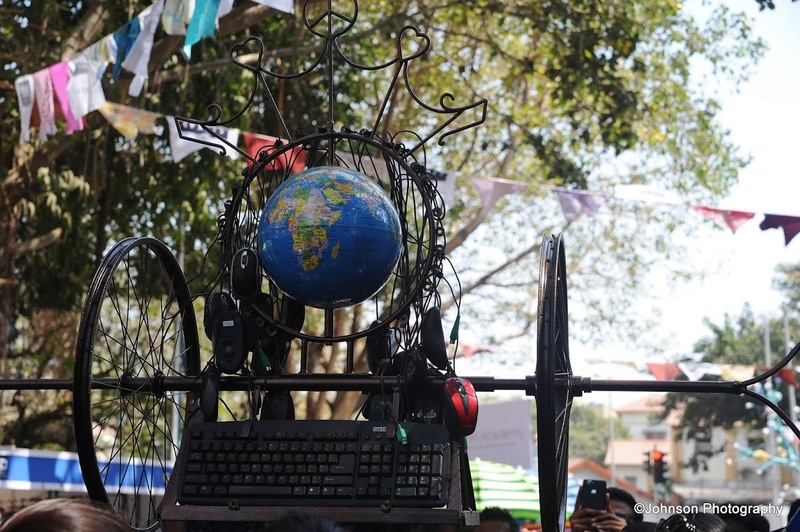 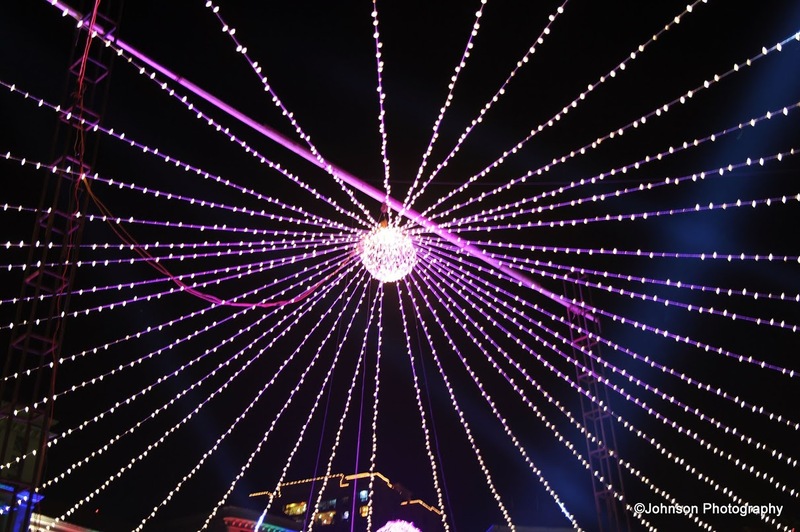 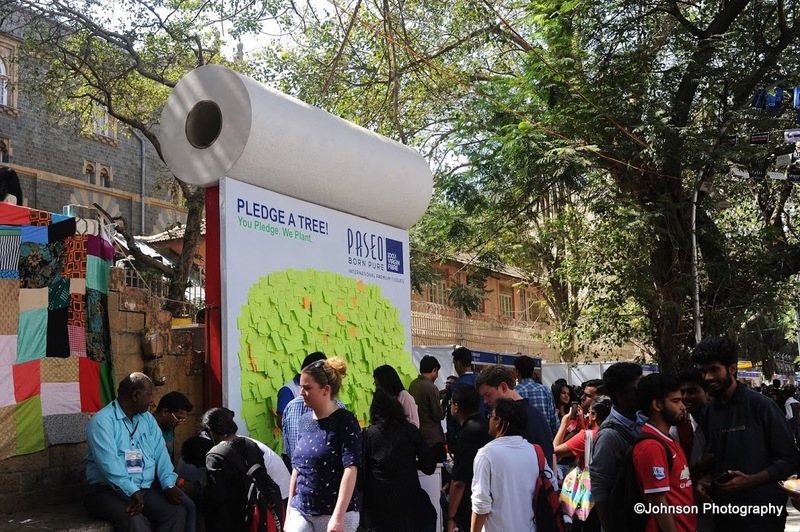 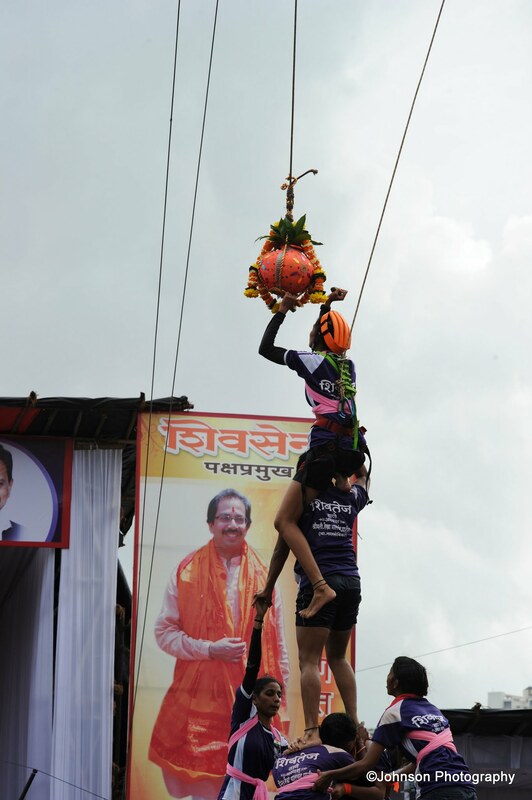 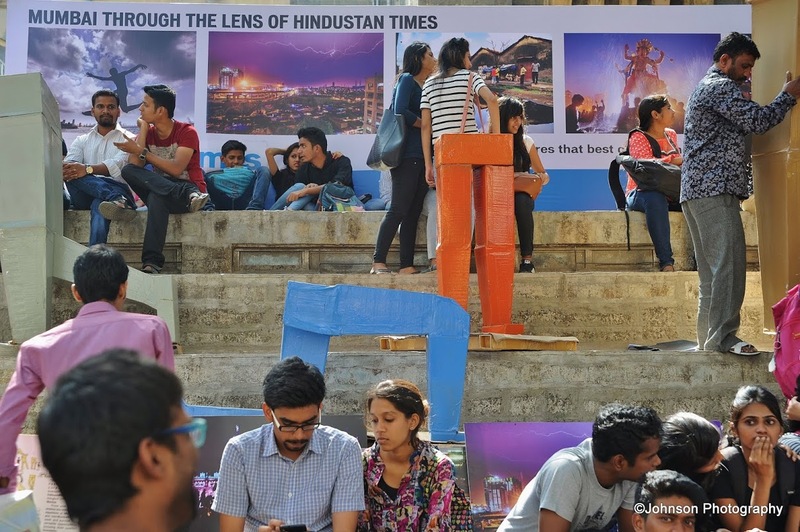 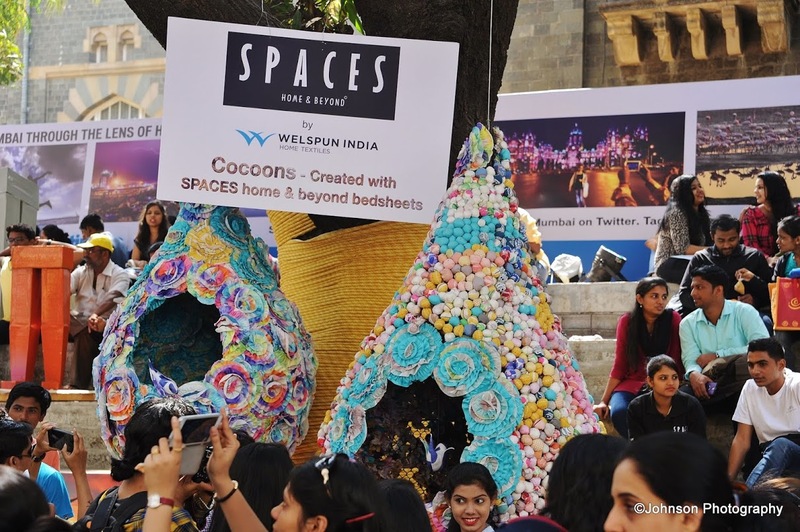 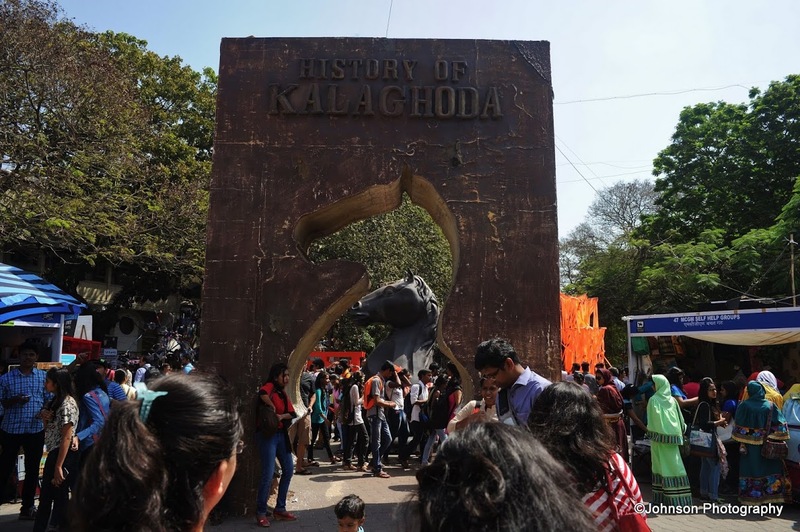 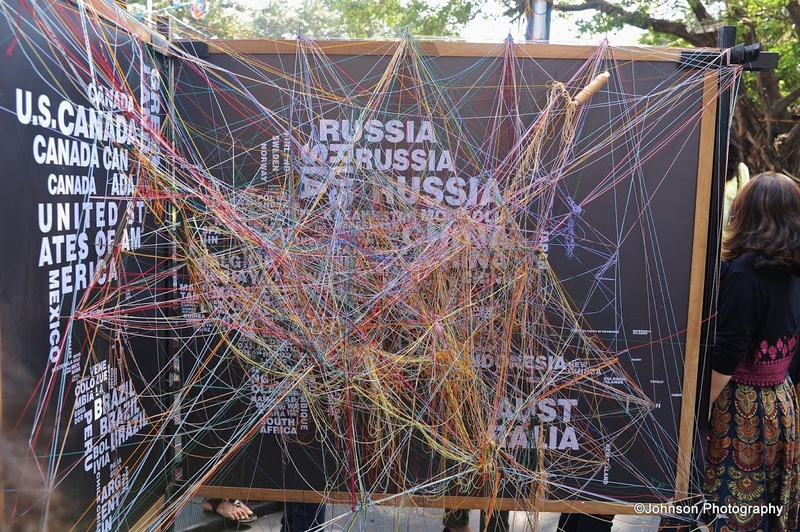 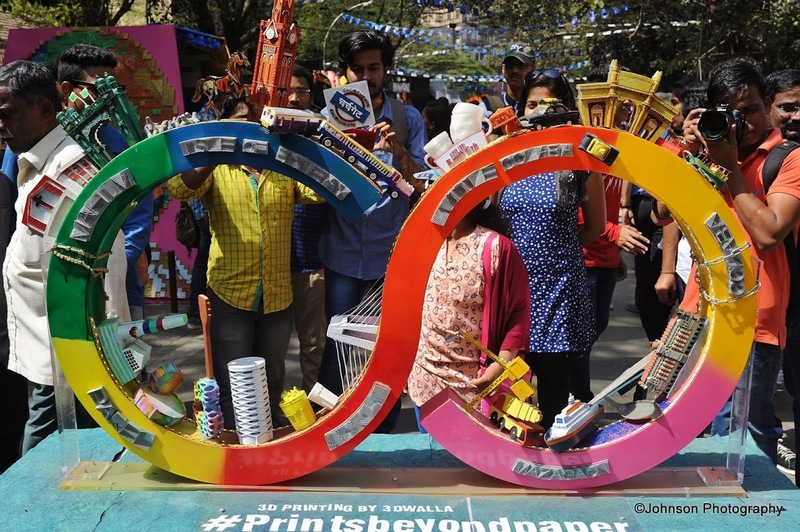 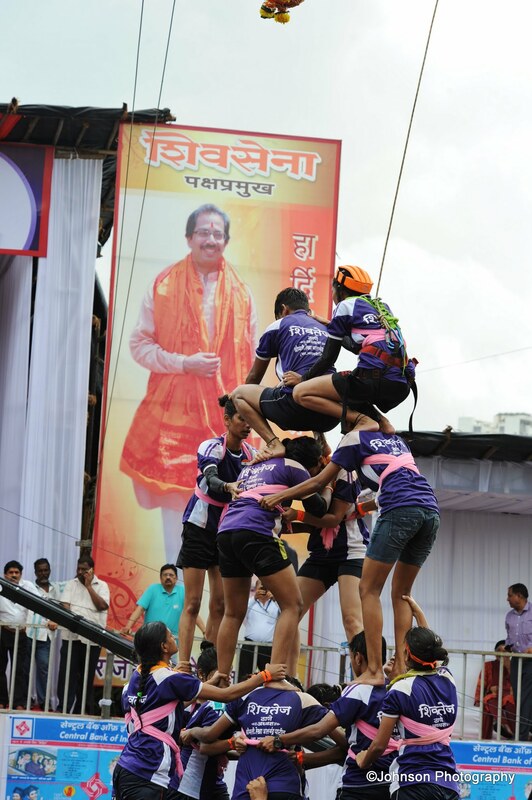 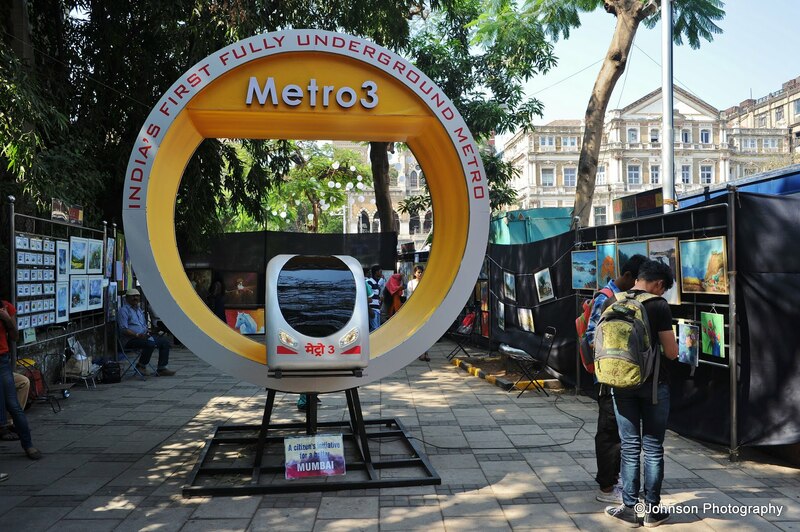 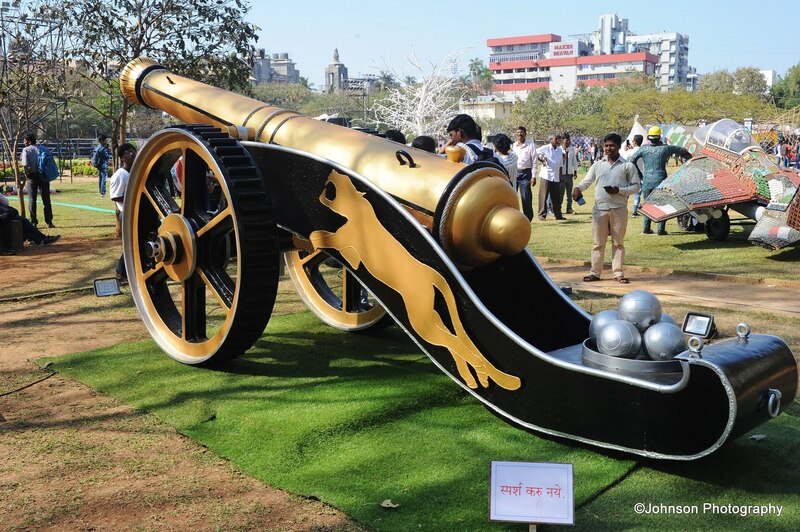 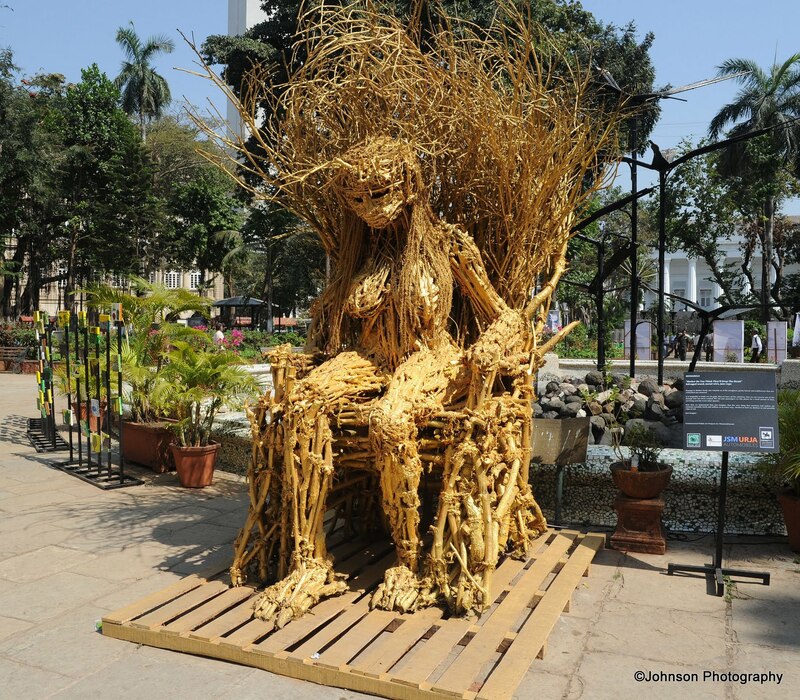 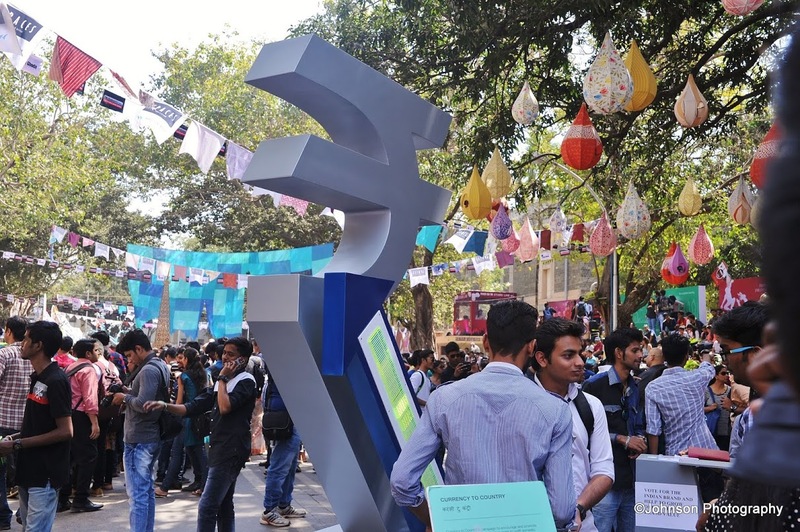 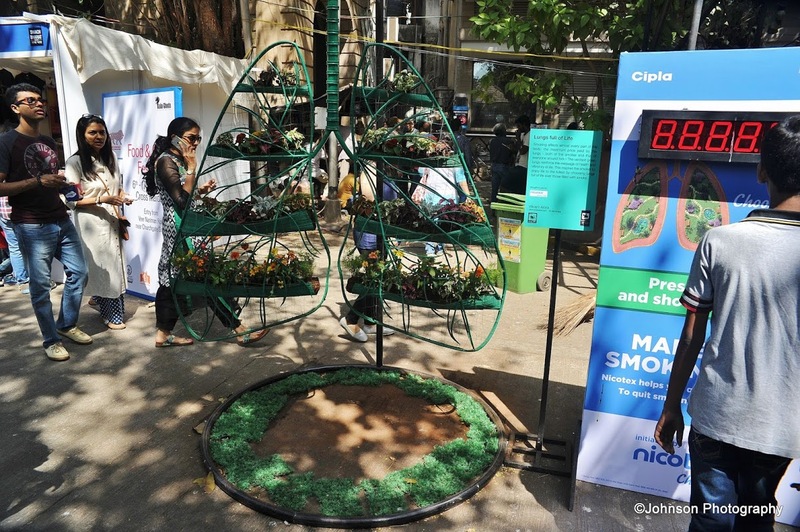 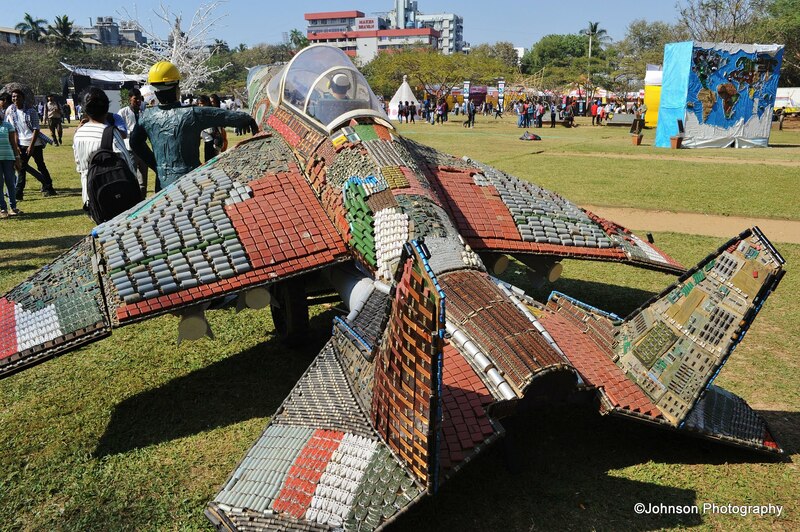 In the recent years, the festival has expanded beyond Kala Ghoda area with many events being held in Cross Maidan and Horniman circle as well.